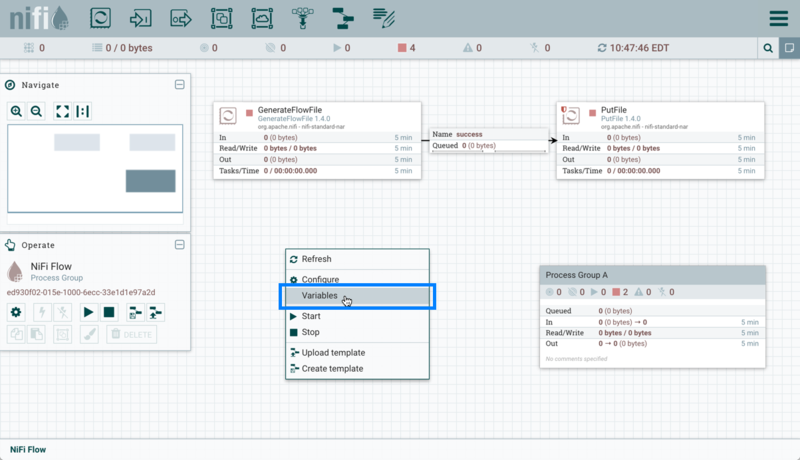 Apache NiFi is a dataflow system based on the concepts of flow-based programming. It supports powerful and scalable directed graphs of data routing, transformation, and system mediation logic. 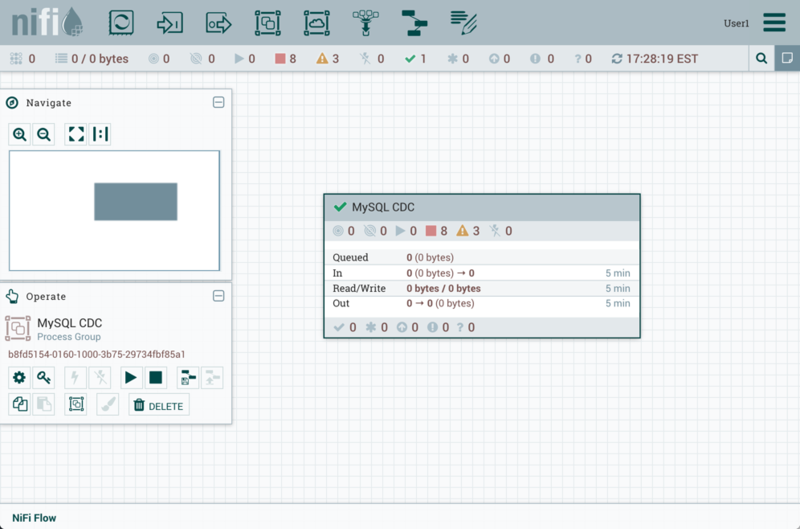 NiFi has a web-based user interface for design, control, feedback, and monitoring of dataflows. It is highly configurable along several dimensions of quality of service, such as loss-tolerant versus guaranteed delivery, low latency versus high throughput, and priority-based queuing. NiFi provides fine-grained data provenance for all data received, forked, joined cloned, modified, sent, and ultimately dropped upon reaching its configured end-state. See the System Administrator’s Guide for information about system requirements, installation, and configuration. Once NiFi is installed, use a supported web browser to view the UI. Current and Current - 1 indicates that the UI is supported in the current stable release of that browser and the preceding one. For instance, if the current stable release is 45.X then the officially supported versions will be 45.X and 44.X. For Safari, which releases major versions much less frequently, Current and Current - 1 simply represent the two latest releases. The supported browser versions are driven by the capabilities the UI employs and the dependencies it uses. UI features will be developed and tested against the supported browsers. Any problem using a supported browser should be reported to Apache NiFi. While the UI may run successfully in unsupported browsers, it is not actively tested against them. Additionally, the UI is designed as a desktop experience and is not currently supported in mobile browsers. In most environments, all of the UI is visible in your browser. However, the UI has a responsive design that allows you to scroll through screens as needed, in smaller sized browsers or tablet environments. In environments where your browser width is less than 800 pixels and the height less than 600 pixels, portions of the UI may become unavailable. 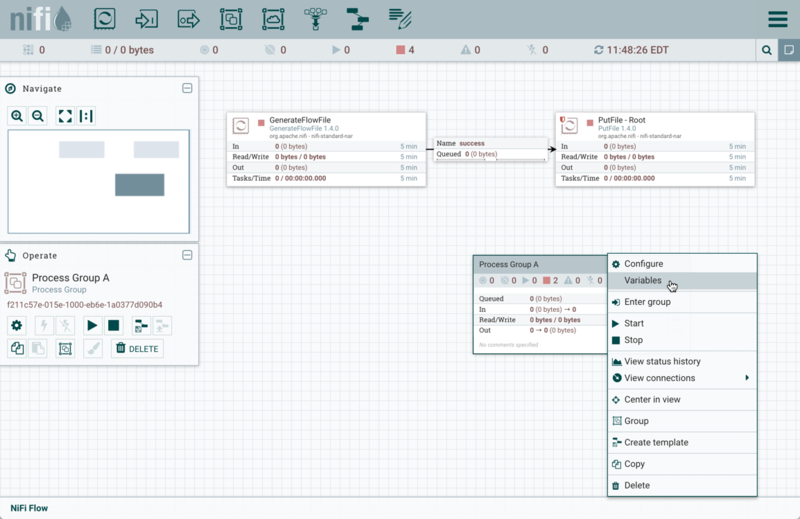 DataFlow Manager: A DataFlow Manager (DFM) is a NiFi user who has permissions to add, remove, and modify components of a NiFi dataflow. uuid: A Universally Unique Identifier that distinguishes the FlowFile from other FlowFiles in the system. Processor: The Processor is the NiFi component that is used to listen for incoming data; pull data from external sources; publish data to external sources; and route, transform, or extract information from FlowFiles. Relationship: Each Processor has zero or more Relationships defined for it. These Relationships are named to indicate the result of processing a FlowFile. After a Processor has finished processing a FlowFile, it will route (or “transfer”) the FlowFile to one of the Relationships. A DFM is then able to connect each of these Relationships to other components in order to specify where the FlowFile should go next under each potential processing result. 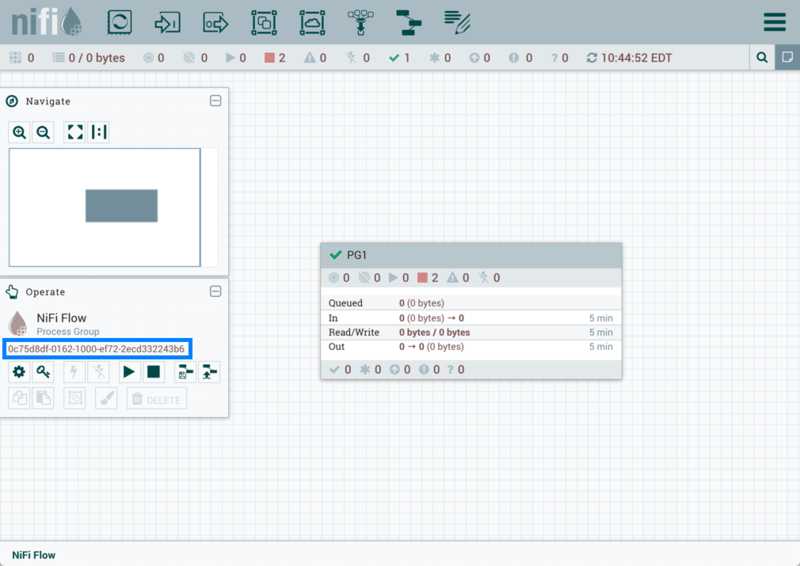 Connection: A DFM creates an automated dataflow by dragging components from the Components part of the NiFi toolbar to the canvas and then connecting the components together via Connections. Each connection consists of one or more Relationships. For each Connection that is drawn, a DFM can determine which Relationships should be used for the Connection. This allows data to be routed in different ways based on its processing outcome. Each connection houses a FlowFile Queue. When a FlowFile is transferred to a particular Relationship, it is added to the queue belonging to the associated Connection. Controller Service: Controller Services are extension points that, after being added and configured by a DFM in the User Interface, will start up when NiFi starts up and provide information for use by other components (such as processors or other controller services). 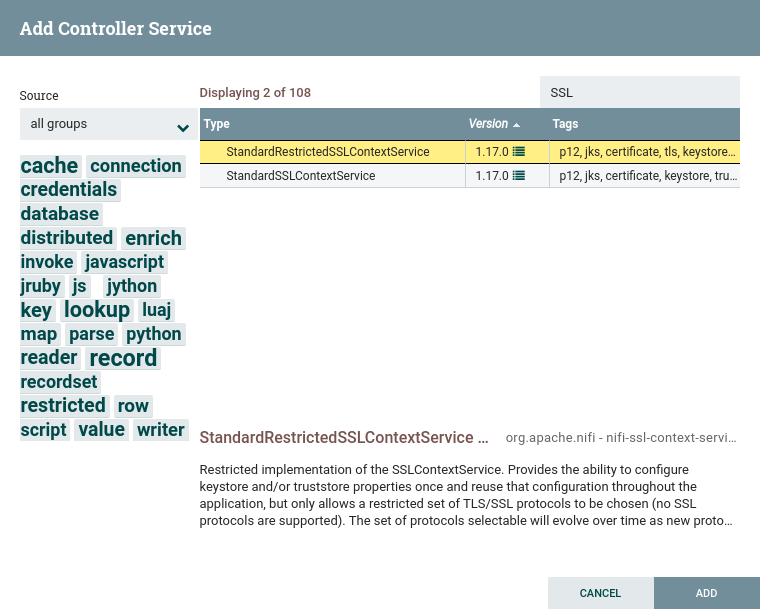 A common Controller Service used by several components is the StandardSSLContextService. It provides the ability to configure keystore and/or truststore properties once and reuse that configuration throughout the application. The idea is that, rather than configure this information in every processor that might need it, the controller service provides it for any processor to use as needed. 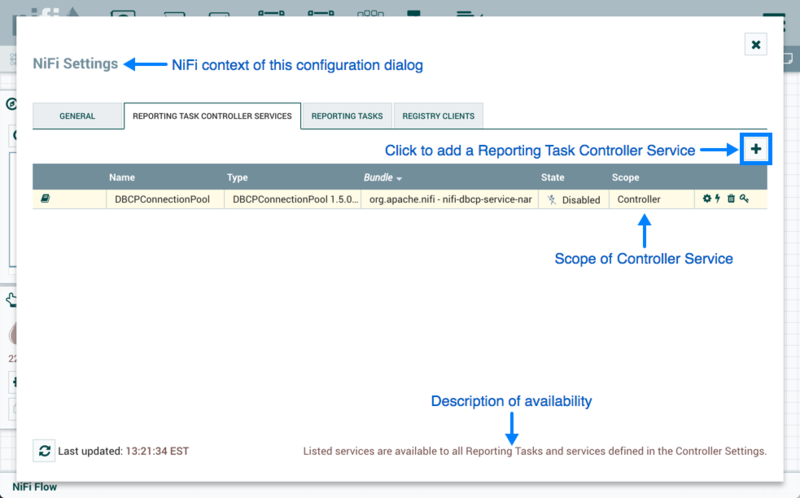 Reporting Task: Reporting Tasks run in the background to provide statistical reports about what is happening in the NiFi instance. 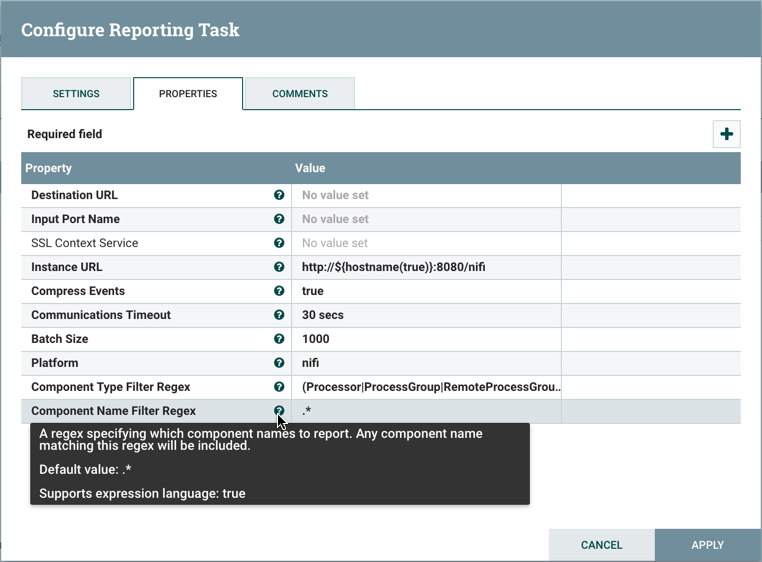 The DFM adds and configures Reporting Tasks in the User Interface as desired. Common reporting tasks include the ControllerStatusReportingTask, MonitorDiskUsage reporting task, MonitorMemory reporting task, and the StandardGangliaReporter. Funnel: A funnel is a NiFi component that is used to combine the data from several Connections into a single Connection. Process Group: When a dataflow becomes complex, it often is beneficial to reason about the dataflow at a higher, more abstract level. 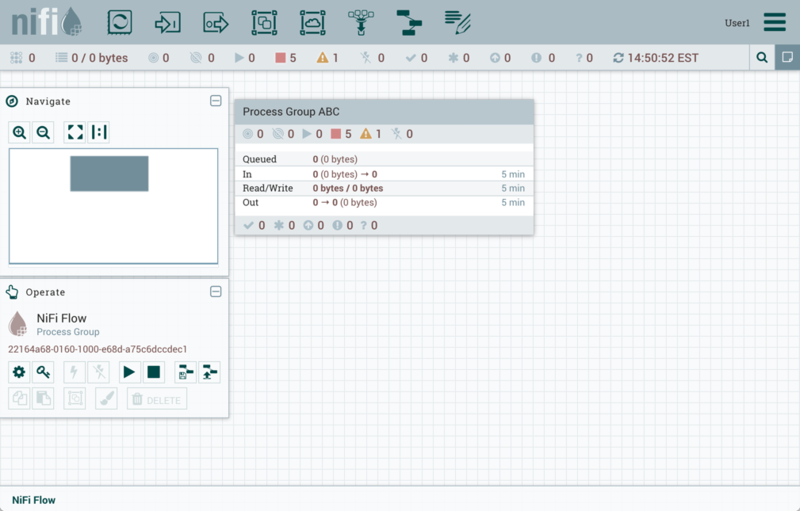 NiFi allows multiple components, such as Processors, to be grouped together into a Process Group. 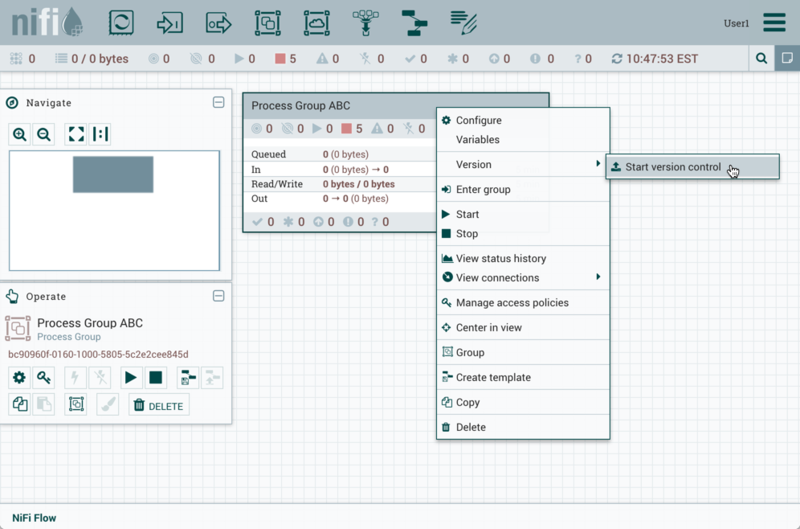 The NiFi User Interface then makes it easy for a DFM to connect together multiple Process Groups into a logical dataflow, as well as allowing the DFM to enter a Process Group in order to see and manipulate the components within the Process Group. 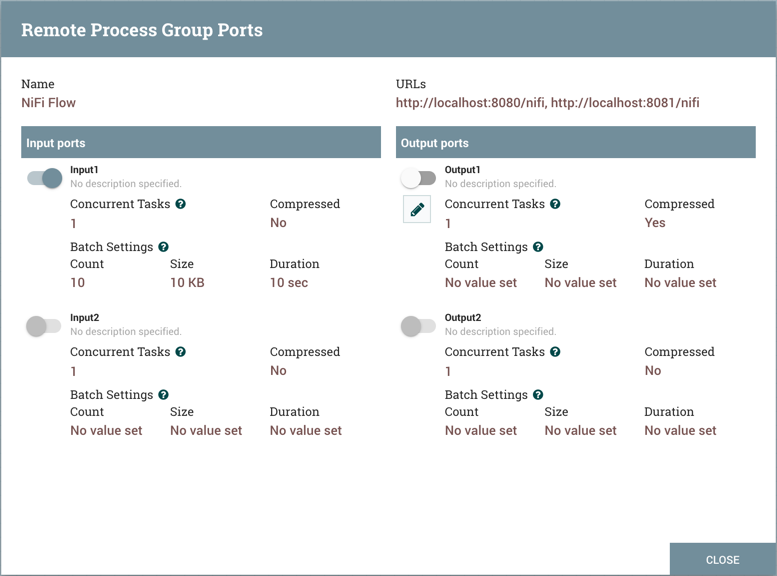 Port: Dataflows that are constructed using one or more Process Groups need a way to connect a Process Group to other dataflow components. This is achieved by using Ports. A DFM can add any number of Input Ports and Output Ports to a Process Group and name these ports appropriately. Remote Process Group: Just as data is transferred into and out of a Process Group, it is sometimes necessary to transfer data from one instance of NiFi to another. While NiFi provides many different mechanisms for transferring data from one system to another, Remote Process Groups are often the easiest way to accomplish this if transferring data to another instance of NiFi. Bulletin: The NiFi User Interface provides a significant amount of monitoring and feedback about the current status of the application. In addition to rolling statistics and the current status provided for each component, components are able to report Bulletins. Whenever a component reports a Bulletin, a bulletin icon is displayed on that component. System-level bulletins are displayed on the Status bar near the top of the page. Using the mouse to hover over that icon will provide a tool-tip that shows the time and severity (Debug, Info, Warning, Error) of the Bulletin, as well as the message of the Bulletin. Bulletins from all components can also be viewed and filtered in the Bulletin Board Page, available in the Global Menu. 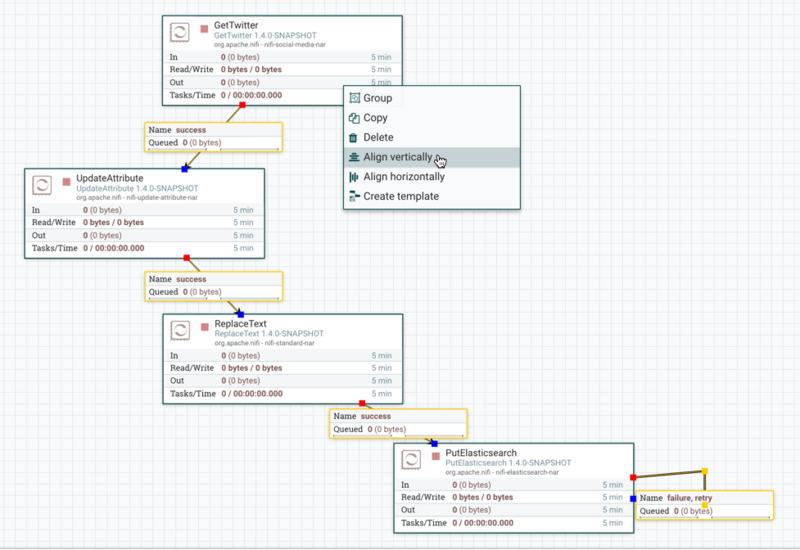 Template: Often times, a dataflow is comprised of many sub-flows that could be reused. 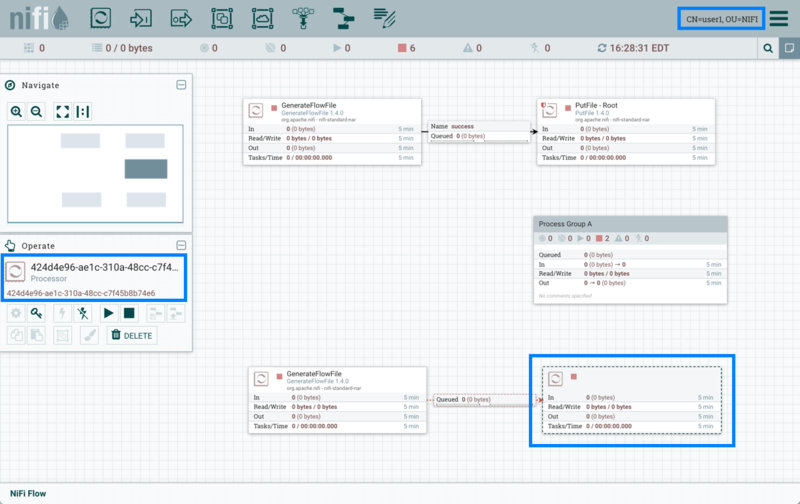 NiFi allows DFMs to select a part of the dataflow (or the entire dataflow) and create a Template. This Template is given a name and can then be dragged onto the canvas just like the other components. As a result, several components may be combined together to make a larger building block from which to create a dataflow. These templates can also be exported as XML and imported into another NiFi instance, allowing these building blocks to be shared. flow.xml.gz: Everything the DFM puts onto the NiFi User Interface canvas is written, in real time, to one file called the flow.xml.gz. This file is located in the nifi/conf directory by default. Any change made on the canvas is automatically saved to this file, without the user needing to click a "Save" button. In addition, NiFi automatically creates a backup copy of this file in the archive directory when it is updated. You can use these archived files to rollback flow configuration. To do so, stop NiFi, replace flow.xml.gz with a desired backup copy, then restart NiFi. In a clustered environment, stop the entire NiFi cluster, replace the flow.xml.gz of one of nodes, and restart the node. Remove flow.xml.gz from other nodes. Once you confirmed the node starts up as a one-node cluster, start the other nodes. The replaced flow configuration will be synchronized across the cluster. 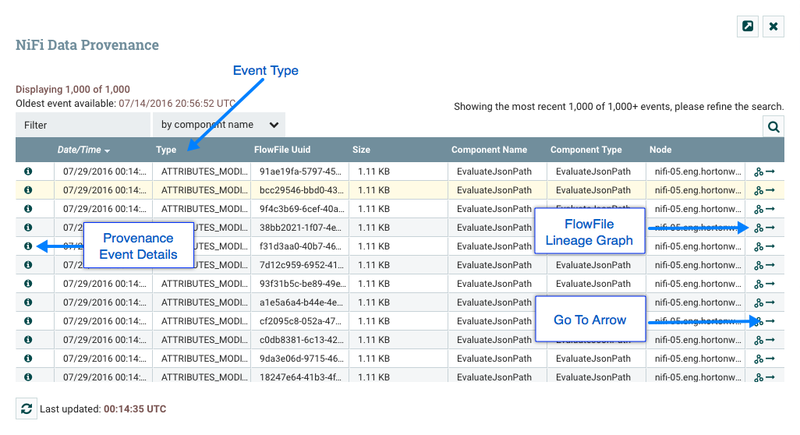 The name and location of flow.xml.gz, and auto archive behavior are configurable. See the System Administrator’s Guide for further details. 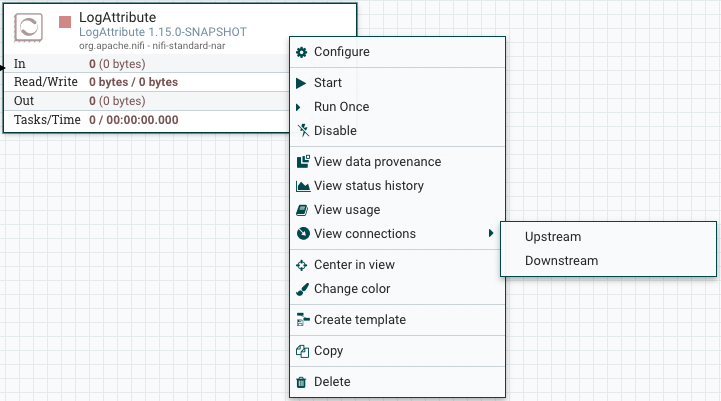 The NiFi UI provides mechanisms for creating automated dataflows, as well as visualizing, editing, monitoring, and administering those dataflows. The UI can be broken down into several segments, each responsible for different functionality of the application. This section provides screenshots of the application and highlights the different segments of the UI. Each segment is discussed in further detail later in the document. When the application is started, the user is able to navigate to the UI by going to the default address of http://<hostname>:8080/nifi in a web browser. 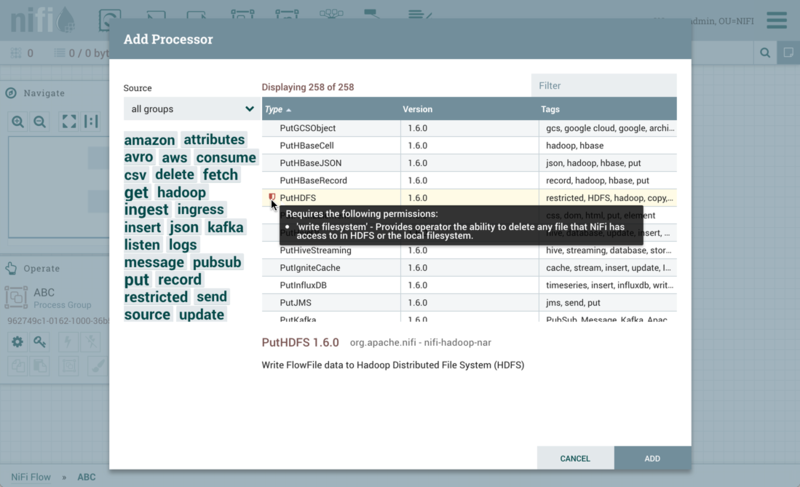 There are no permissions configured by default, so anyone is able to view and modify the dataflow. For information on securing the system, see the System Administrator’s Guide. The Components Toolbar runs across the top left portion of your screen. 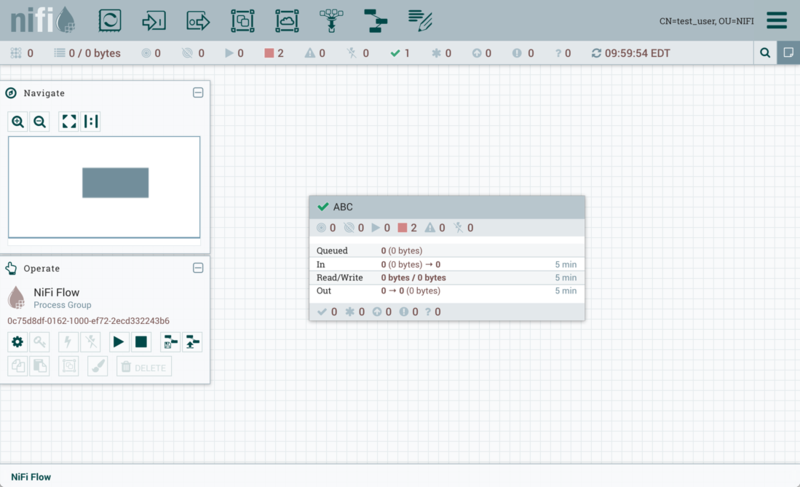 It consists of the components you can drag onto the canvas to build your dataflow. Each component is described in more detail in Building a DataFlow. The Status Bar is under the Components Toolbar. The Status bar provides information about the number of threads that are currently active in the flow, the amount of data that currently exists in the flow, how many Remote Process Groups exist on the canvas in each state (Transmitting, Not Transmitting), how many Processors exist on the canvas in each state (Stopped, Running, Invalid, Disabled), how many versioned Process Groups exist on the canvas in each state (Up to date, Locally modified, Stale, Locally modified and stale, Sync failure) and the timestamp at which all of this information was last refreshed. 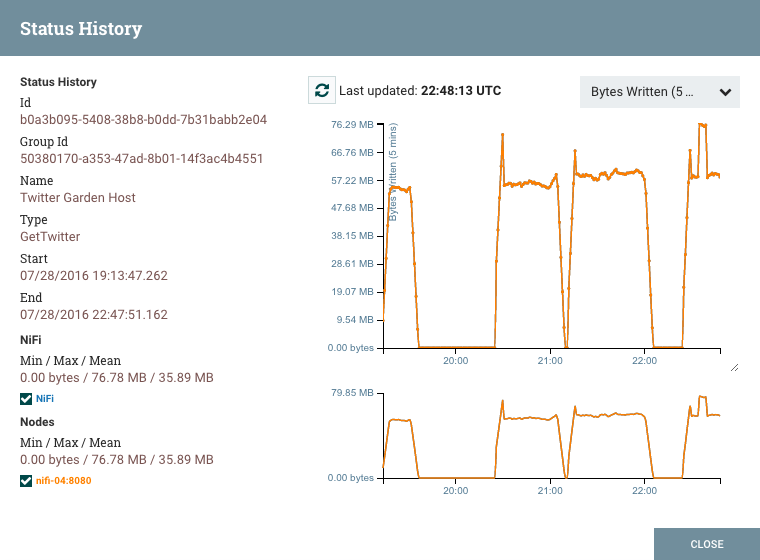 Additionally, if the instance of NiFi is clustered, the Status bar shows how many nodes are in the cluster and how many are currently connected. The Operate Palette sits to the left-hand side of the screen. It consists of buttons that are used by DFMs to manage the flow, as well as by administrators who manage user access and configure system properties, such as how many system resources should be provided to the application. 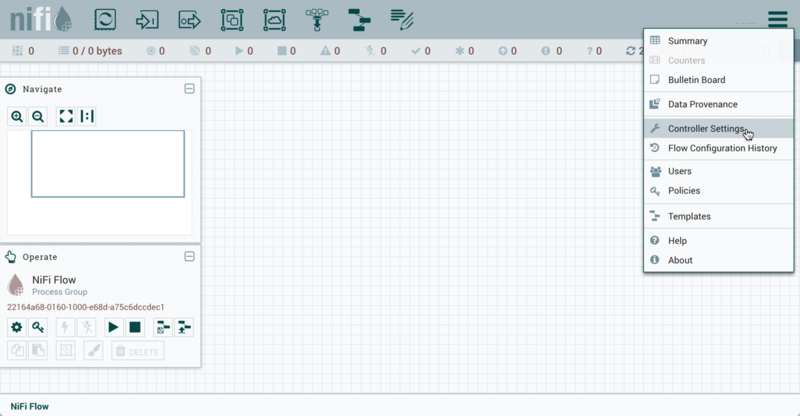 Additionally, the UI has some features that allow you to easily navigate around the canvas. You can use the Navigate Palette to pan around the canvas, and to zoom in and out. The “Birds Eye View” of the dataflow provides a high-level view of the dataflow and allows you to pan across large portions of the dataflow. You can also find breadcrumbs along the bottom of the screen. As you navigate into and out of Process Groups, the breadcrumbs show the depth in the flow, and each Process Group that you entered to reach this depth. Each of the Process Groups listed in the breadcrumbs is a link that will take you back up to that level in the flow. Multi-tenant authorization enables multiple groups of users (tenants) to command, control, and observe different parts of the dataflow, with varying levels of authorization. 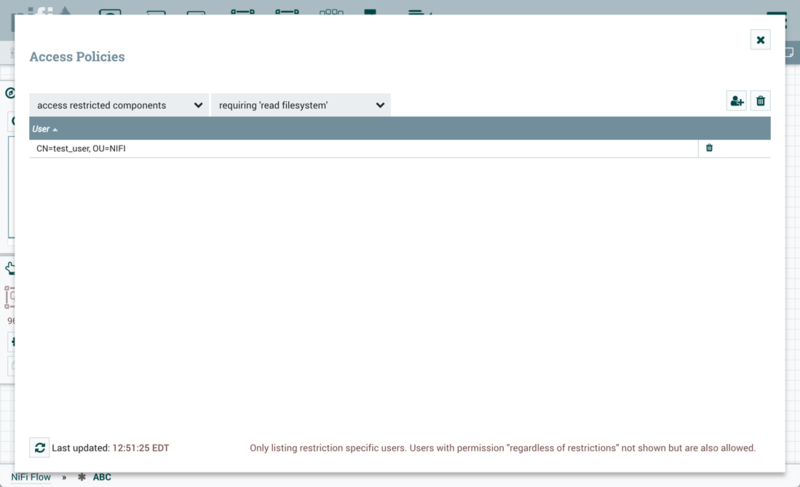 When an authenticated user attempts to view or modify a NiFi resource, the system checks whether the user has privileges to perform that action. These privileges are defined by policies that you can apply system wide or to individual components. 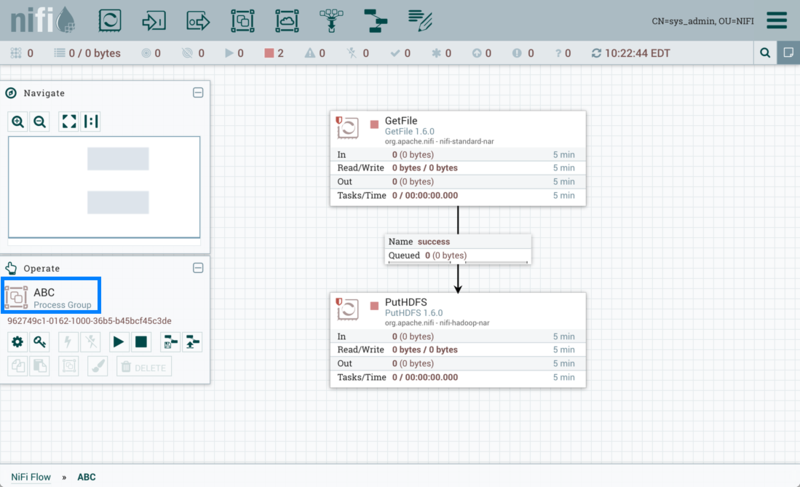 What this means from a Dataflow Manager perspective is that once you have access to the NiFi canvas, a range of functionality is visible and available to you, depending on the privileges assigned to you. 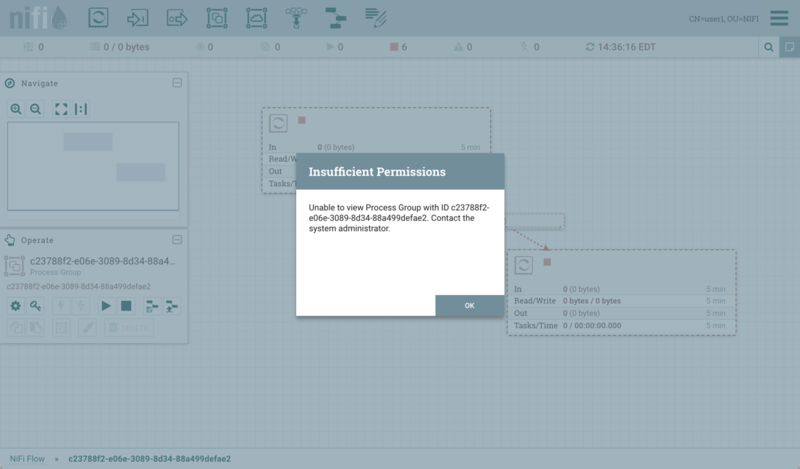 Allows users to create/modify restricted components assuming other permissions are sufficient. 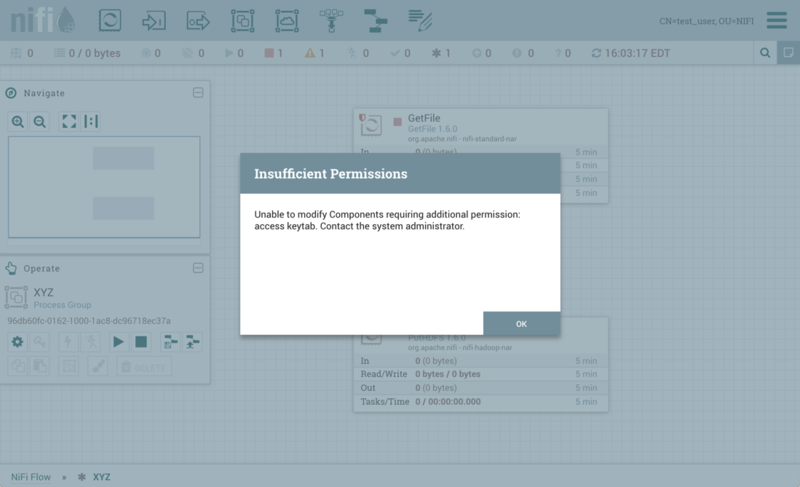 The restricted components may indicate which specific permissions are required. Permissions can be granted for specific restrictions or be granted regardless of restrictions. If permission is granted regardless of restrictions, the user can create/modify all restricted components. If you are unable to view or modify a NiFi resource, contact your System Administrator or see Configuring Users and Access Policies in the System Administrator’s Guide for more information. 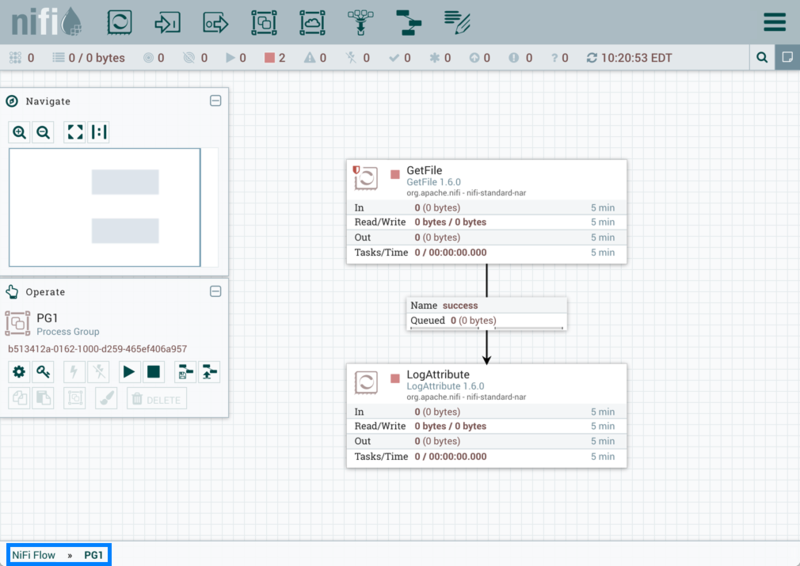 If NiFi is configured to run securely, users will be able to request access to the DataFlow. For information on configuring NiFi to run securely, see the System Administrator’s Guide. If NiFi supports anonymous access, users will be given access accordingly and given an option to log in. Clicking the 'login' link will open the log in page. 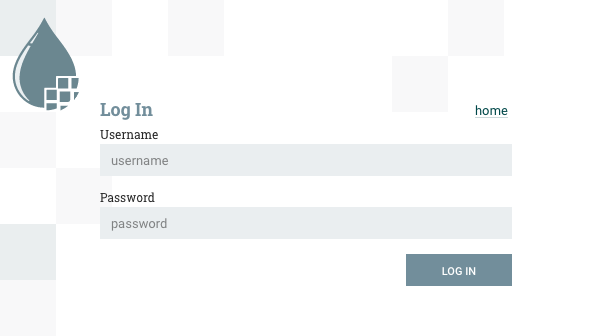 If the user is logging in with their username/password they will be presented with a form to do so. If NiFi is not configured to support anonymous access and the user is logging in with their username/password, they will be immediately sent to the login form bypassing the canvas. 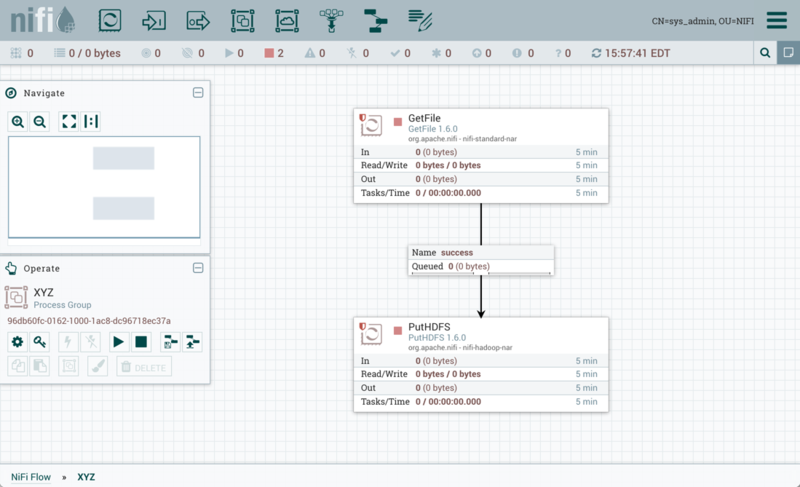 A DFM is able to build an automated dataflow using the NiFi UI. 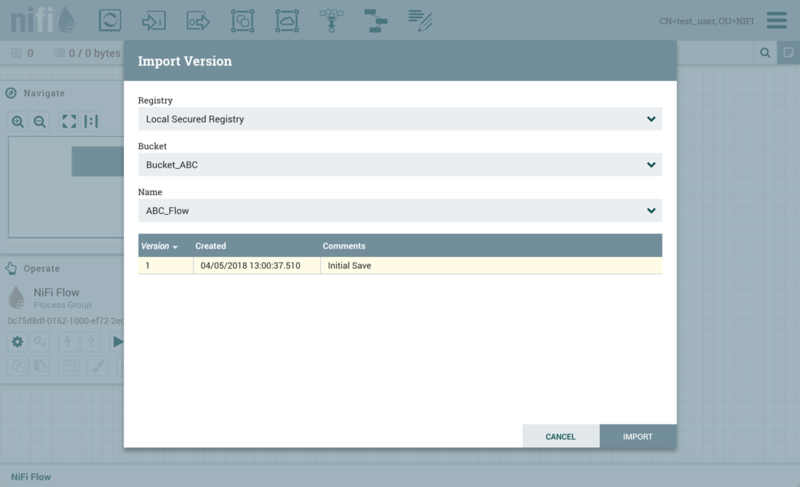 Simply drag components from the toolbar to the canvas, configure the components to meet specific needs, and connect the components together. Restricted components will be marked with a icon next to their name. These are components that can be used to execute arbitrary unsanitized code provided by the operator through the NiFi REST API/UI or can be used to obtain or alter data on the NiFi host system using the NiFi OS credentials. These components could be used by an otherwise authorized NiFi user to go beyond the intended use of the application, escalate privilege, or could expose data about the internals of the NiFi process or the host system. All of these capabilities should be considered privileged, and admins should be aware of these capabilities and explicitly enable them for a subset of trusted users. Before a user is allowed to create and modify restricted components they must be granted access. Hovering over the icon will display the specific permissions a restricted component requires. Permissions can be assigned regardless of restrictions. In this case, the user will have access to all restricted components. Alternatively, users can be assigned access to specific restrictions. If the user has been granted access to all restrictions a component requires, they will have access to that component assuming otherwise sufficient permissions. For more information refer to Accessing the UI with Multi-Tenant Authorization and Restricted Components in Versioned Flows. Clicking the Add button or double-clicking on a Processor Type will add the selected Processor to the canvas at the location that it was dropped. For any component added to the canvas, it is possible to select it with the mouse and move it anywhere on the canvas. Also, it is possible to select multiple items at once by either holding down the Shift key and selecting each item or by holding down the Shift key and dragging a selection box around the desired components. Once you have dragged a Processor onto the canvas, you can interact with it by right-clicking on the Processor and selecting an option from the context menu. The options available to you from the context menu vary, depending on the privileges assigned to you. Configure: This option allows the user to establish or change the configuration of the Processor (see Configuring a Processor). 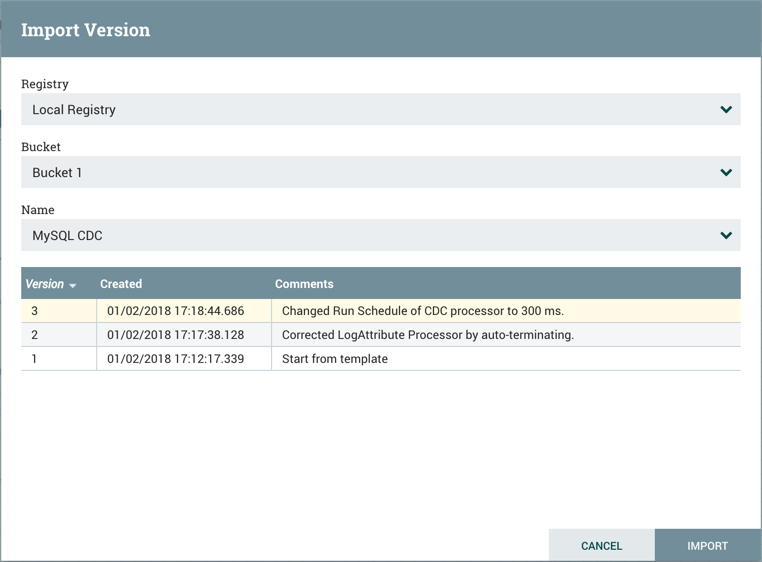 For Processors, Ports, Remote Process Groups, Connections and Labels, it is possible to open the configuration dialog by double-clicking on desired component. Start or Stop: This option allows the user to start or stop a Processor; the option will be either Start or Stop, depending on the current state of the Processor. Enable or Disable: This option allows the user to enable or disable a Processor; the option will be either Enable or Disable, depending on the current state of the Processor. 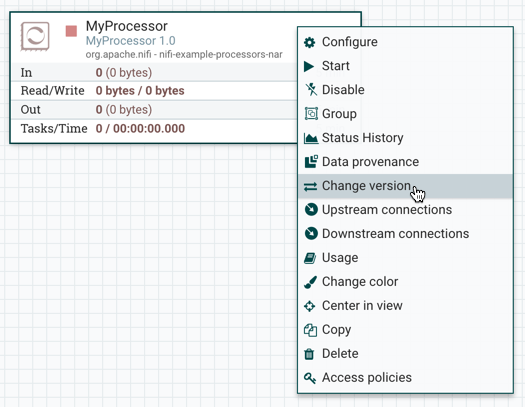 View data provenance: This option displays the NiFi Data Provenance table, with information about data provenance events for the FlowFiles routed through that Processor (see Data Provenance). View status history: This option opens a graphical representation of the Processor’s statistical information over time. View usage: This option takes the user to the Processor’s usage documentation. View connections→Upstream: This option allows the user to see and "jump to" upstream connections that are coming into the Processor. 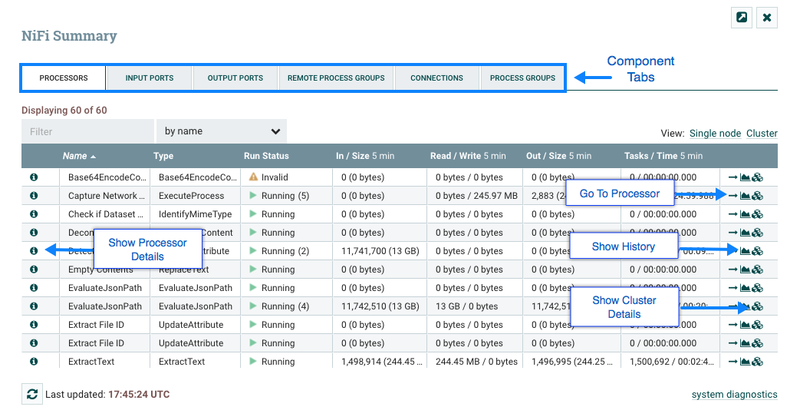 This is particularly useful when processors connect into and out of other Process Groups. View connections→Downstream: This option allows the user to see and "jump to" downstream connections that are going out of the Processor. This is particularly useful when processors connect into and out of other Process Groups. Center in view: This option centers the view of the canvas on the given Processor. Change color: This option allows the user to change the color of the Processor, which can make the visual management of large flows easier. Create template: This option allows the user to create a template from the selected Processor. Copy: This option places a copy of the selected Processor on the clipboard, so that it may be pasted elsewhere on the canvas by right-clicking on the canvas and selecting Paste. The Copy/Paste actions also may be done using the keystrokes Ctrl-C (Command-C) and Ctrl-V (Command-V). Delete: This option allows the DFM to delete a Processor from the canvas. Input Port: Input Ports provide a mechanism for transferring data into a Process Group. When an Input Port is dragged onto the canvas, the DFM is prompted to name the Port. All Ports within a Process Group must have unique names. All components exist only within a Process Group. When a user initially navigates to the NiFi page, the user is placed in the Root Process Group. If the Input Port is dragged onto the Root Process Group, the Input Port provides a mechanism to receive data from remote instances of NiFi via Site-to-Site. In this case, the Input Port can be configured to restrict access to appropriate users, if NiFi is configured to run securely. For information on configuring NiFi to run securely, see the System Administrator’s Guide. Output Port: Output Ports provide a mechanism for transferring data from a Process Group to destinations outside of the Process Group. When an Output Port is dragged onto the canvas, the DFM is prompted to name the Port. All Ports within a Process Group must have unique names. If the Output Port is dragged onto the Root Process Group, the Output Port provides a mechanism for sending data to remote instances of NiFi via Site-to-Site. In this case, the Port acts as a queue. As remote instances of NiFi pull data from the port, that data is removed from the queues of the incoming Connections. If NiFi is configured to run securely, the Output Port can be configured to restrict access to appropriate users. For information on configuring NiFi to run securely, see the System Administrator’s Guide. Process Group: Process Groups can be used to logically group a set of components so that the dataflow is easier to understand and maintain. When a Process Group is dragged onto the canvas, the DFM is prompted to name the Process Group. All Process Groups within the same parent group must have unique names. The Process Group will then be nested within that parent group. Once you have dragged a Process Group onto the canvas, you can interact with it by right-clicking on the Process Group and selecting an option from context menu.The options available to you from the context menu vary, depending on the privileges assigned to you. 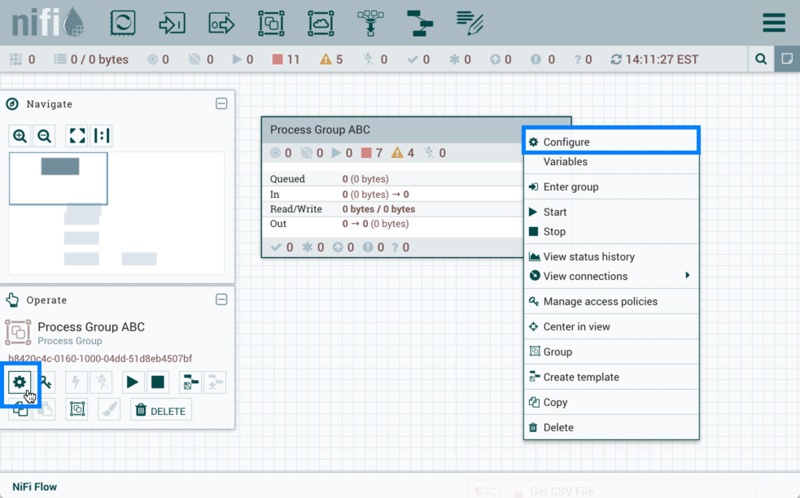 Configure: This option allows the user to establish or change the configuration of the Process Group. 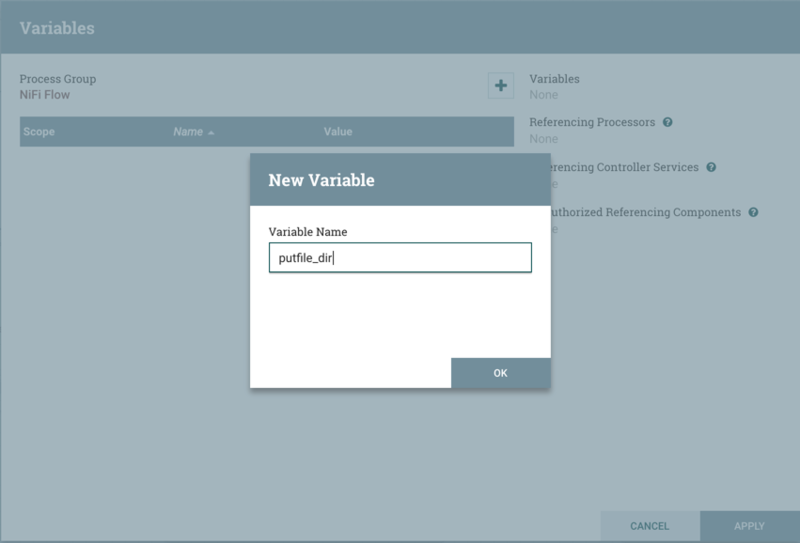 Variables: This option allows the user to create or configure variables within the NiFi UI. Enter group: This option allows the user to enter the Process Group. It is also possible to double-click on the Process Group to enter it. Start: This option allows the user to start a Process Group. Stop: This option allows the user to stop a Process Group. View status history: This option opens a graphical representation of the Process Group’s statistical information over time. View connections→Upstream: This option allows the user to see and "jump to" upstream connections that are coming into the Process Group. View connections→Downstream: This option allows the user to see and "jump to" downstream connections that are going out of the Process Group. Center in view: This option centers the view of the canvas on the given Process Group. 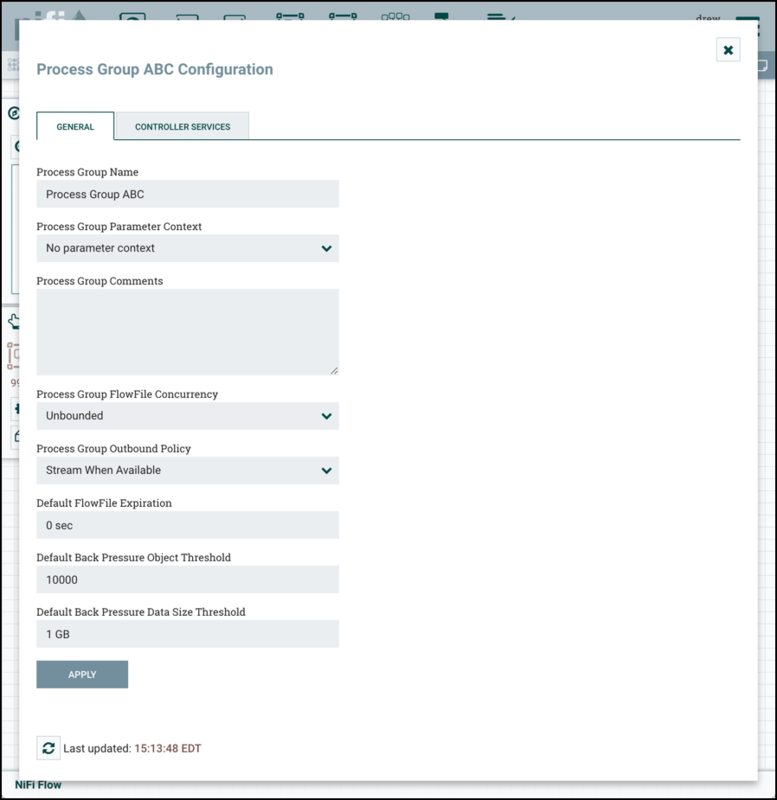 Group: This option allows the user to create a new Process Group that contains the selected Process Group and any other components selected on the canvas. 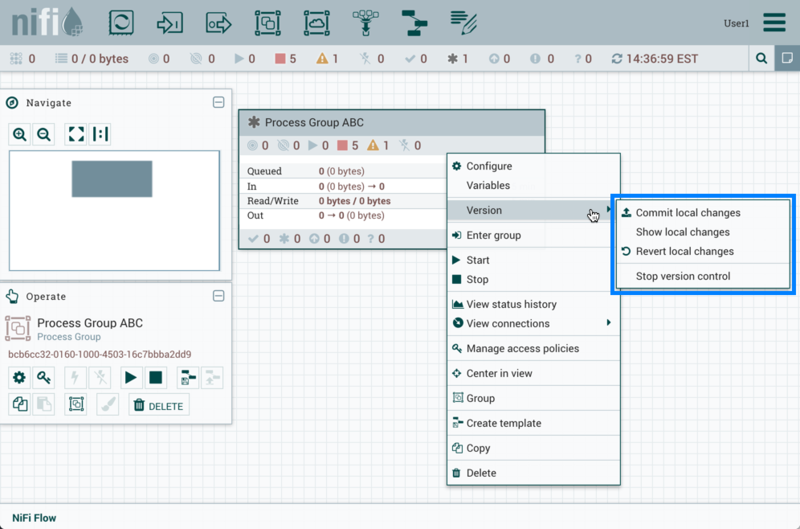 Create template: This option allows the user to create a template from the selected Process Group. Copy: This option places a copy of the selected Process Group on the clipboard, so that it may be pasted elsewhere on the canvas by right-clicking on the canvas and selecting Paste. The Copy/Paste actions also may be done using the keystrokes Ctrl-C (Command-C) and Ctrl-V (Command-V). Delete: This option allows the DFM to delete a Process Group. Remote Process Group: Remote Process Groups appear and behave similar to Process Groups. However, the Remote Process Group (RPG) references a remote instance of NiFi. When an RPG is dragged onto the canvas, rather than being prompted for a name, the DFM is prompted for the URL of the remote NiFi instance. If the remote NiFi is a clustered instance, the URL that should be used is the URL of any NiFi instance in that cluster. When data is transferred to a clustered instance of NiFi via an RPG, the RPG will first connect to the remote instance whose URL is configured to determine which nodes are in the cluster and how busy each node is. This information is then used to load balance the data that is pushed to each node. The remote instances are then interrogated periodically to determine information about any nodes that are dropped from or added to the cluster and to recalculate the load balancing based on each node’s load. For more information, see the section on Site-to-Site. Once you have dragged a Remote Process Group onto the canvas, you can may interact with it by right-clicking on the Remote Process Group and selecting an option from context menu. The options available to you from the context menu vary, depending on the privileges assigned to you. 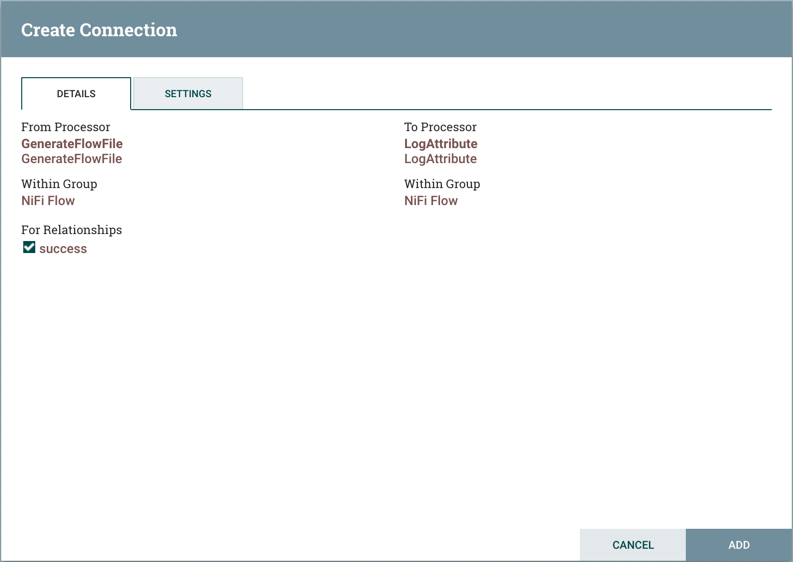 Configure: This option allows the user to establish or change the configuration of the Remote Process Group. Enable transmission: Makes the transmission of data between NiFi instances active (see Remote Process Group Transmission). Disable transmission: Disables the transmission of data between NiFi instances. View status history: This option opens a graphical representation of the Remote Process Group’s statistical information over time. 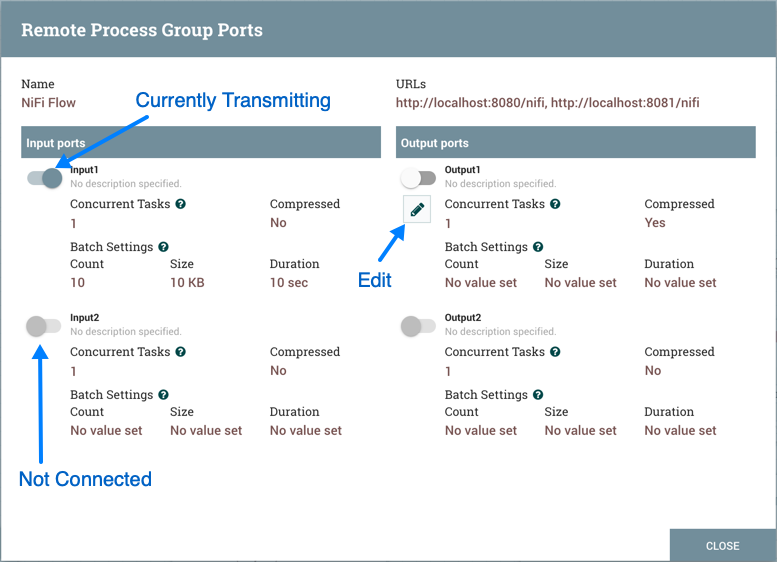 View connections→Upstream: This option allows the user to see and "jump to" upstream connections that are coming into the Remote Process Group. 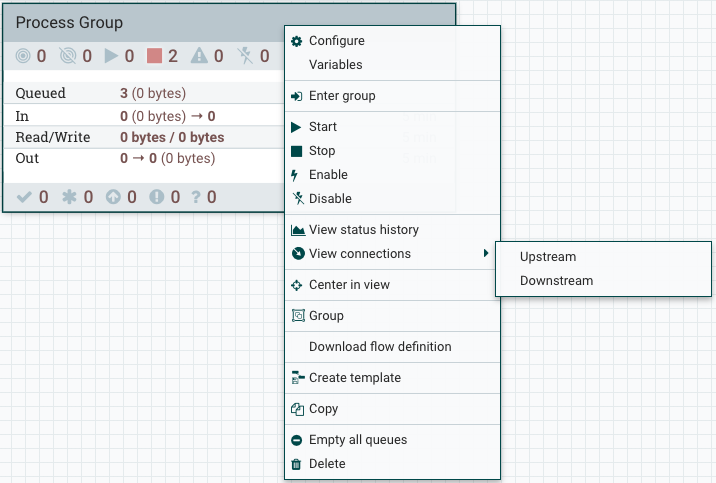 View connections→Downstream: This option allows the user to see and "jump to" downstream connections that are going out of the Remote Process Group. Refresh remote: This option refreshes the view of the status of the remote NiFi instance. 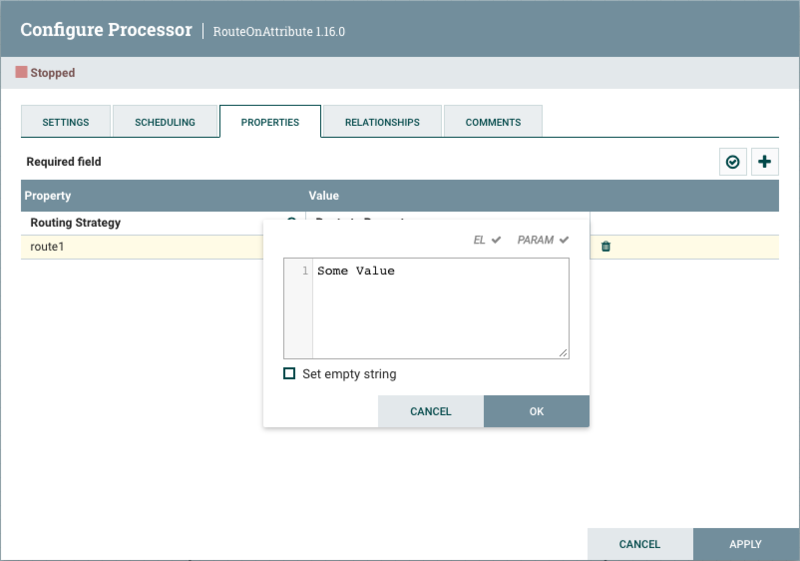 Group: This option allows the user to create a new Process Group that contains the selected Remote Process Group and any other components selected on the canvas. 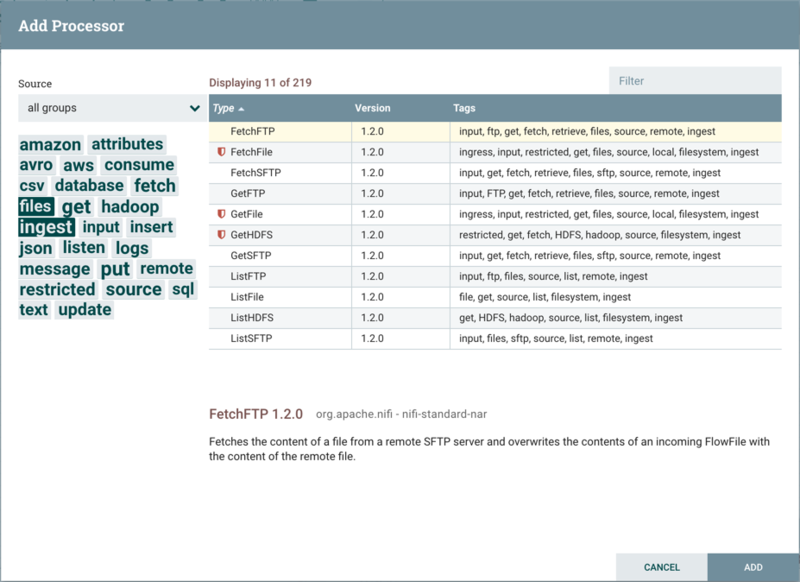 Manage remote ports: This option allows the user to see input ports and/or output ports that exist on the remote instance of NiFi that the Remote Process Group is connected to. Note that if the Site-to-Site configuration is secure, only the ports that the connecting NiFi has been given accessed to will be visible. Center in view: This option centers the view of the canvas on the given Remote Process Group. Go to: This option opens a view of the remote NiFi instance in a new tab of the browser. Note that if the Site-to-Site configuration is secure, the user must have access to the remote NiFi instance in order to view it. Group: This option allows the user to create a Process Group containing the selected Remote Process Group. Create template: This option allows the user to create a template from the selected Remote Process Group. Delete: This option allows the DFM to delete a Remote Process Group from the canvas. Funnel: Funnels are used to combine the data from many Connections into a single Connection. This has two advantages. First, if many Connections are created with the same destination, the canvas can become cluttered if those Connections have to span a large space. By funneling these Connections into a single Connection, that single Connection can then be drawn to span that large space instead. 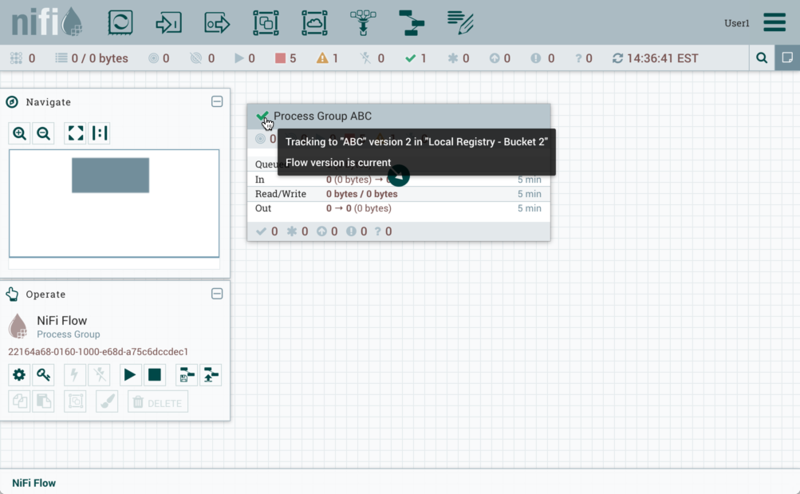 Secondly, Connections can be configured with FlowFile Prioritizers. Data from several Connections can be funneled into a single Connection, providing the ability to Prioritize all of the data on that one Connection, rather than prioritizing the data on each Connection independently. Label: Labels are used to provide documentation to parts of a dataflow. When a Label is dropped onto the canvas, it is created with a default size. The Label can then be resized by dragging the handle in the bottom-right corner. The Label has no text when initially created. The text of the Label can be added by right-clicking on the Label and choosing Configure. You have access to information about the version of your Processors, Controller Services, and Reporting Tasks. This is especially useful when you are working within a clustered environment with multiple NiFi instances running different versions of a component or if you have upgraded to a newer version of a processor. 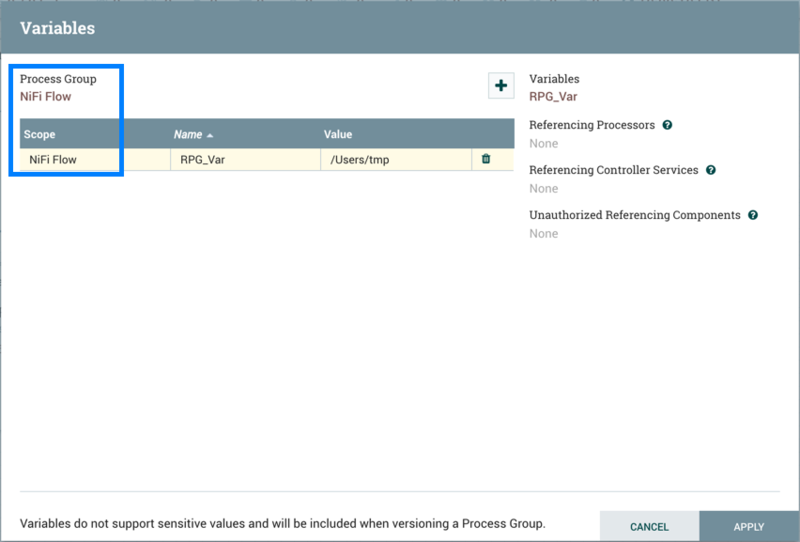 The Add Processor, Add Controller Service, and Add Reporting Task dialogs include a column identifying the component version, as well as the name of the component, the organization or group that created the component, and the NAR bundle that contains the component. Each component displayed on the canvas also contains this information. When you are adding a component, you can sort on version number or filter based on originating source. To sort based on version, click the version column to display in ascending or descending version order. To filter based on source group, click the source drop-down in the upper left of your Add Component dialog, and select the group you want to view. To change a component version, perform the following steps. Right-click the component on the canvas to display configuration options. In the Component Version dialog, select the version you want to run from the Version drop-down menu. When you are configuring a component, you can also view information about version dependencies. Right-click your component and select Configure to display the Configure dialog for your component. Click the information icon to view any version dependency information. To configure a processor, right-click on the Processor and select the Configure option from the context menu. Alternatively, just double-click on the Processor. The configuration dialog is opened with four different tabs, each of which is discussed below. Once you have finished configuring the Processor, you can apply the changes by clicking the Apply button or cancel all changes by clicking the Cancel button. Note that after a Processor has been started, the context menu shown for the Processor no longer has a Configure option but rather has a View Configuration option. Processor configuration cannot be changed while the Processor is running. You must first stop the Processor and wait for all of its active tasks to complete before configuring the Processor again. This tab contains several different configuration items. First, it allows the DFM to change the name of the Processor. The name of a Processor by default is the same as the Processor type. Next to the Processor Name is a checkbox, indicating whether the Processor is Enabled. When a Processor is added to the canvas, it is enabled. If the Processor is disabled, it cannot be started. The disabled state is used to indicate that when a group of Processors is started, such as when a DFM starts an entire Process Group, this (disabled) Processor should be excluded. Below the Name configuration, the Processor’s unique identifier is displayed along with the Processor’s type and NAR bundle. These values cannot be modified. 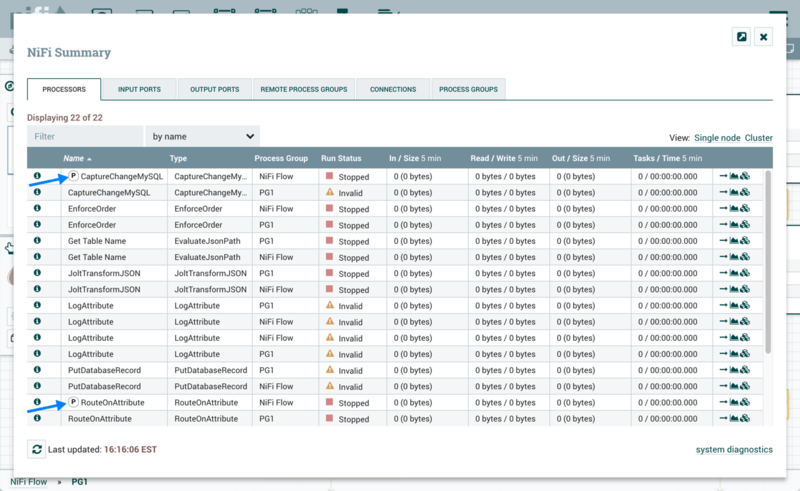 Next are two dialogues for configuring 'Penalty Duration' and 'Yield Duration'. During the normal course of processing a piece of data (a FlowFile), an event may occur that indicates that the data cannot be processed at this time but the data may be processable at a later time. When this occurs, the Processor may choose to Penalize the FlowFile. This will prevent the FlowFile from being Processed for some period of time. For example, if the Processor is to push the data to a remote service, but the remote service already has a file with the same name as the filename that the Processor is specifying, the Processor may penalize the FlowFile. The 'Penalty Duration' allows the DFM to specify how long the FlowFile should be penalized. The default value is 30 seconds. Similarly, the Processor may determine that some situation exists such that the Processor can no longer make any progress, regardless of the data that it is processing. For example, if a Processor is to push data to a remote service and that service is not responding, the Processor cannot make any progress. As a result, the Processor should 'yield', which will prevent the Processor from being scheduled to run for some period of time. That period of time is specified by setting the 'Yield Duration'. The default value is 1 second. The last configurable option on the left-hand side of the Settings tab is the Bulletin level. Whenever the Processor writes to its log, the Processor also will generate a Bulletin. This setting indicates the lowest level of Bulletin that should be shown in the User Interface. By default, the Bulletin level is set to WARN, which means it will display all warning and error-level bulletins. The right-hand side of the Settings tab contains an 'Automatically Terminate Relationships' section. Each of the Relationships that is defined by the Processor is listed here, along with its description. In order for a Processor to be considered valid and able to run, each Relationship defined by the Processor must be either connected to a downstream component or auto-terminated. If a Relationship is auto-terminated, any FlowFile that is routed to that Relationship will be removed from the flow and its processing considered complete. Any Relationship that is already connected to a downstream component cannot be auto-terminated. The Relationship must first be removed from any Connection that uses it. Additionally, for any Relationship that is selected to be auto-terminated, the auto-termination status will be cleared (turned off) if the Relationship is added to a Connection. Timer driven: This is the default mode. The Processor will be scheduled to run on a regular interval. 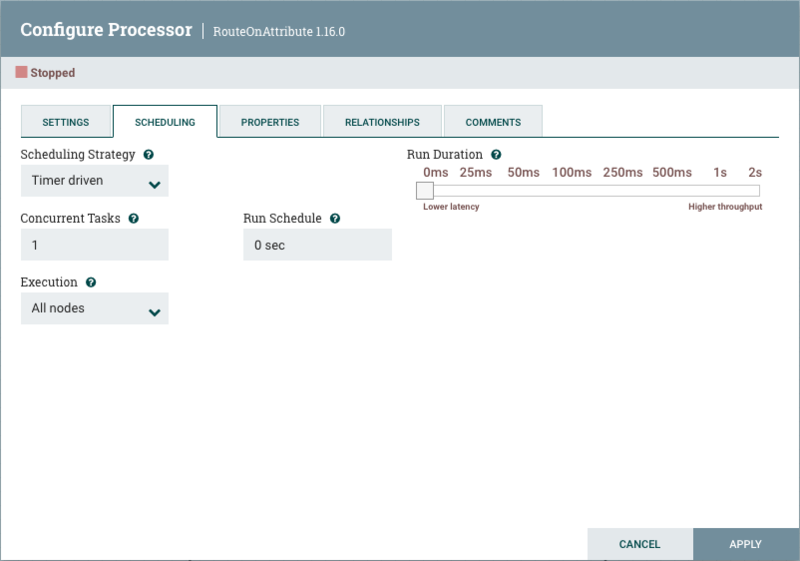 The interval at which the Processor is run is defined by the 'Run Schedule' option (see below). Event driven: When this mode is selected, the Processor will be triggered to run by an event, and that event occurs when FlowFiles enter Connections feeding this Processor. This mode is currently considered experimental and is not supported by all Processors. When this mode is selected, the 'Run Schedule' option is not configurable, as the Processor is not triggered to run periodically but as the result of an event. Additionally, this is the only mode for which the 'Concurrent Tasks' option can be set to 0. In this case, the number of threads is limited only by the size of the Event-Driven Thread Pool that the administrator has configured. Number: Specify one or more valid value. You can enter more than one value using a comma-separated list. Range: Specify a range using the <number>-<number> syntax. Increment: Specify an increment using <start value>/<increment> syntax. For example, in the Minutes field, 0/15 indicates the minutes 0, 15, 30, and 45. * — Indicates that all values are valid for that field.
? — Indicates that no specific value is specified. This special character is valid in the Days of Month and Days of Week field. L — You can append L to one of the Day of Week values, to specify the last occurrence of this day in the month. For example, 1L indicates the last Sunday of the month. The string 0 0 13 * * ? indicates that you want to schedule the processor to run at 1:00 PM every day. The string 0 20 14 ? * MON-FRI indicates that you want to schedule the processor to run at 2:20 PM every Monday through Friday. The string 0 15 10 ? * 6L 2011-2017 indicates that you want to schedule the processor to run at 10:15 AM, on the last Friday of every month, between 2011 and 2017. For additional information and examples, see the Chron Trigger Tutorial in the Quartz documentation. Next, the Scheduling tab provides a configuration option named 'Concurrent Tasks'. This controls how many threads the Processor will use. Said a different way, this controls how many FlowFiles should be processed by this Processor at the same time. Increasing this value will typically allow the Processor to handle more data in the same amount of time. However, it does this by using system resources that then are not usable by other Processors. This essentially provides a relative weighting of Processors — it controls how much of the system’s resources should be allocated to this Processor instead of other Processors. This field is available for most Processors. There are, however, some types of Processors that can only be scheduled with a single Concurrent task. The 'Run Schedule' dictates how often the Processor should be scheduled to run. The valid values for this field depend on the selected Scheduling Strategy (see above). If using the Event driven Scheduling Strategy, this field is not available. When using the Timer driven Scheduling Strategy, this value is a time duration specified by a number followed by a time unit. For example, 1 second or 5 mins. The default value of 0 sec means that the Processor should run as often as possible as long as it has data to process. This is true for any time duration of 0, regardless of the time unit (i.e., 0 sec, 0 mins, 0 days). For an explanation of values that are applicable for the CRON driven Scheduling Strategy, see the description of the CRON driven Scheduling Strategy itself. The right-hand side of the Scheduling tab contains a slider for choosing the 'Run Duration'. This controls how long the Processor should be scheduled to run each time that it is triggered. On the left-hand side of the slider, it is marked 'Lower latency' while the right-hand side is marked 'Higher throughput'. When a Processor finishes running, it must update the repository in order to transfer the FlowFiles to the next Connection. Updating the repository is expensive, so the more work that can be done at once before updating the repository, the more work the Processor can handle (Higher throughput). However, this means that the next Processor cannot start processing those FlowFiles until the previous Process updates this repository. As a result, the latency will be longer (the time required to process the FlowFile from beginning to end will be longer). As a result, the slider provides a spectrum from which the DFM can choose to favor Lower Latency or Higher Throughput. This Processor, by default, has only a single property: 'Routing Strategy'. The default value is 'Route to Property name'. Next to the name of this property is a small question-mark symbol ( ). This help symbol is seen in other places throughout the User Interface, and it indicates that more information is available. Hovering over this symbol with the mouse will provide additional details about the property and the default value, as well as historical values that have been set for the Property. In the top-right corner of the tab is a button for adding a New Property. Clicking this button will provide the DFM with a dialog to enter the name and value of a new property. Not all Processors allow User-Defined properties. In processors that do not allow them, the Processor becomes invalid when User-Defined properties are applied. 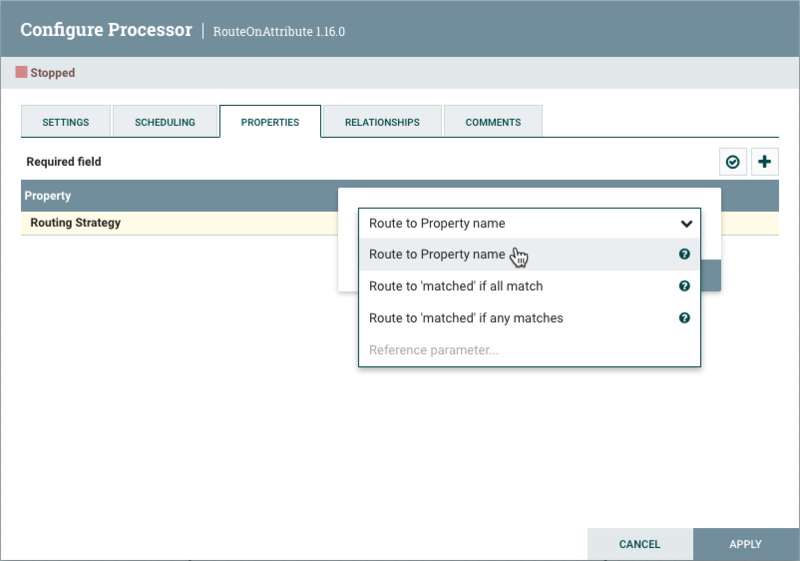 RouteOnAttribute, however, does allow User-Defined properties. In fact, this Processor will not be valid until the user has added a property. Note that after a User-Defined property has been added, an icon will appear on the right-hand side of that row ( ). Clicking it will remove the User-Defined property from the Processor. Some processors also have an Advanced User Interface (UI) built into them. For example, the UpdateAttribute processor has an Advanced UI. To access the Advanced UI, click the Advanced button that appears at the bottom of the Configure Processor window. Only processors that have an Advanced UI will have this button. 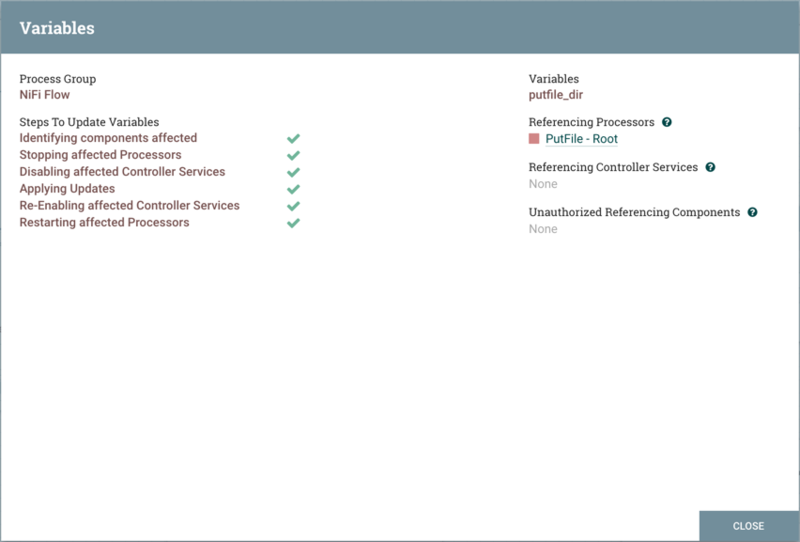 Some processors have properties that refer to other components, such as Controller Services, which also need to be configured. For example, the GetHTTP processor has an SSLContextService property, which refers to the StandardSSLContextService controller service. 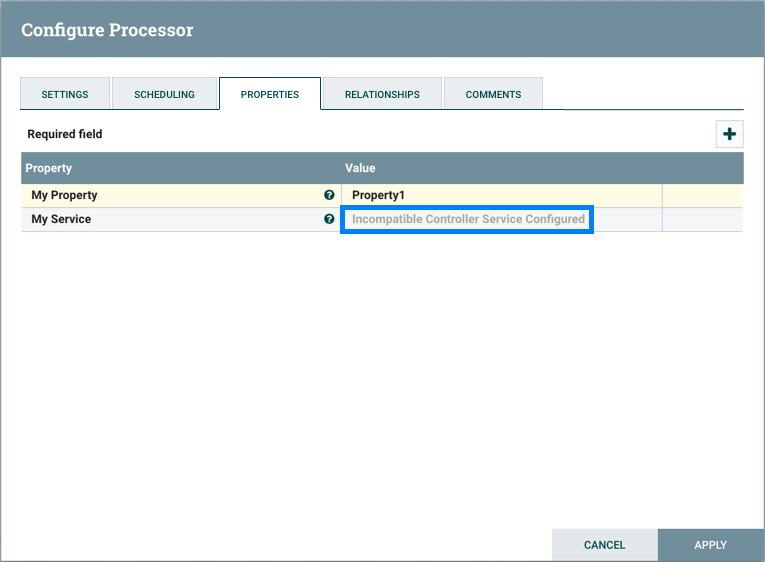 When DFMs want to configure this property but have not yet created and configured the controller service, they have the option to create the service on the spot, as depicted in the image below. For more information about configuring Controller Services, see the Controller Services section. You can access additional documentation about each Processor’s usage by right-clicking on the Processor and selecting 'Usage' from the context menu. Alternatively, select Help from the Global Menu in the top-right corner of the UI to display a Help page with all of the documentation, including usage documentation for all the Processors that are available. Click on the desired Processor to view usage documentation. 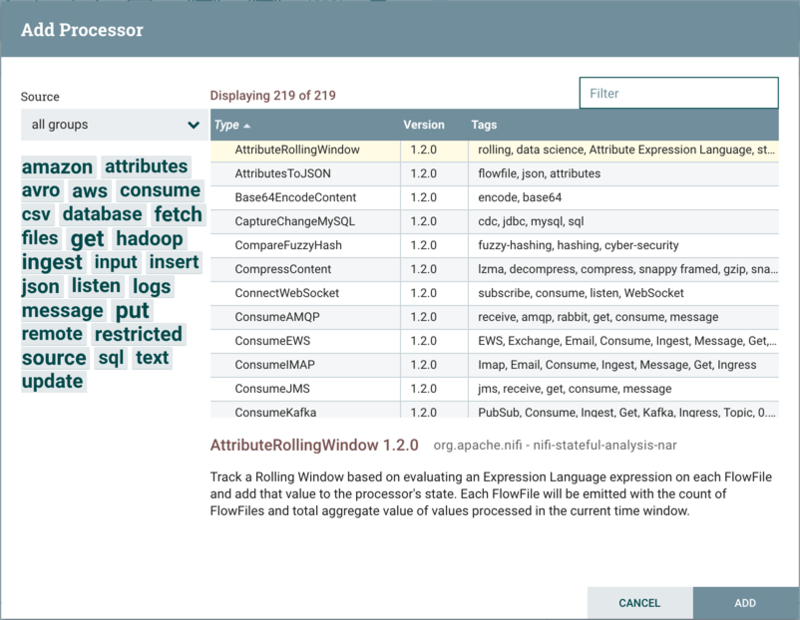 You can use NiFi Expression Language to reference FlowFile attributes, compare them to other values, and manipulate their values when you are creating and configuring dataflows. For more information on Expression Language, see the Expression Language Guide. 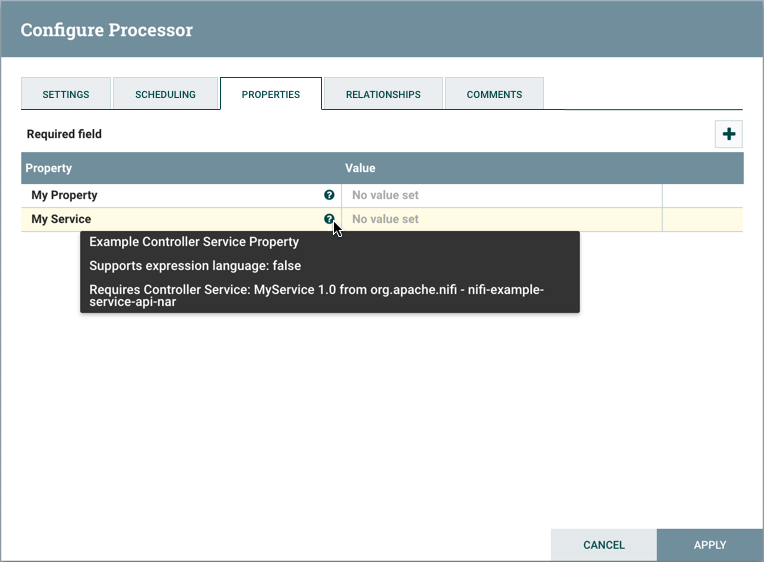 In addition to using FlowFile attributes, system properties, and environment properties within Express Language, you can also define custom properties for Expression Language use. 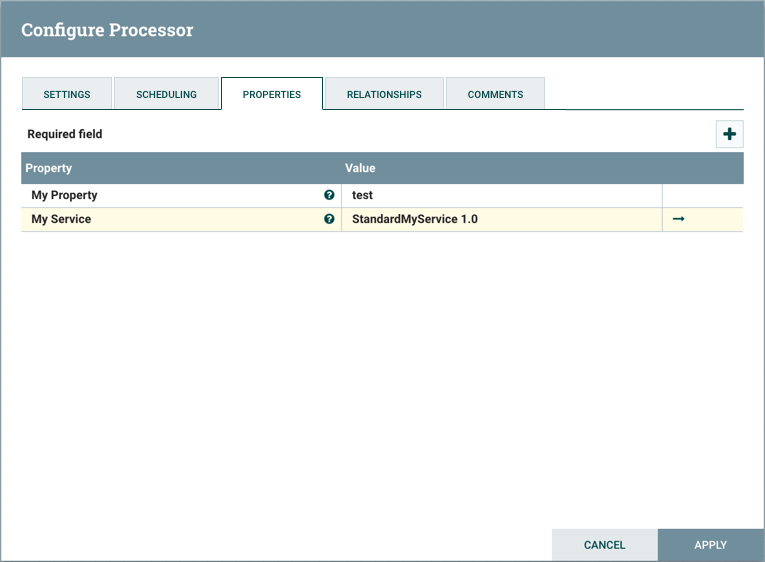 Defining custom properties gives you more flexibility in handling and processing dataflows. You can also create custom properties for connection, server, and service properties, for easier dataflow configuration. 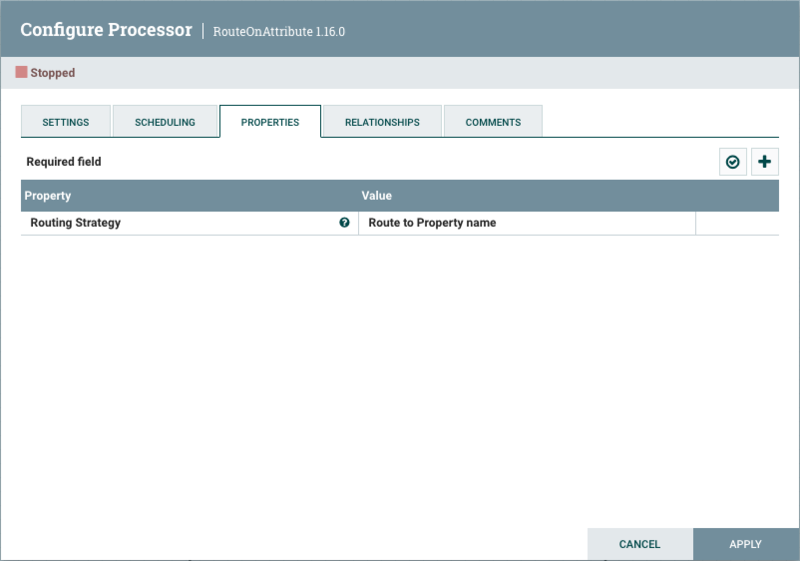 When you are creating custom properties, ensure that each custom property contains a distinct property value, so that it is not overridden by existing environment properties, system properties, or FlowFile attributes. 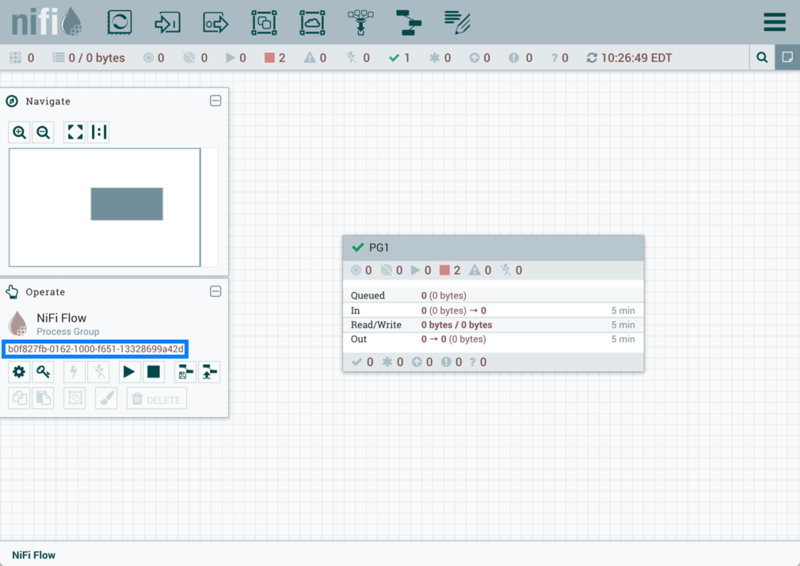 Variables can be created and configured within the NiFi UI. The variables can be used in any field that supports Expression Language. 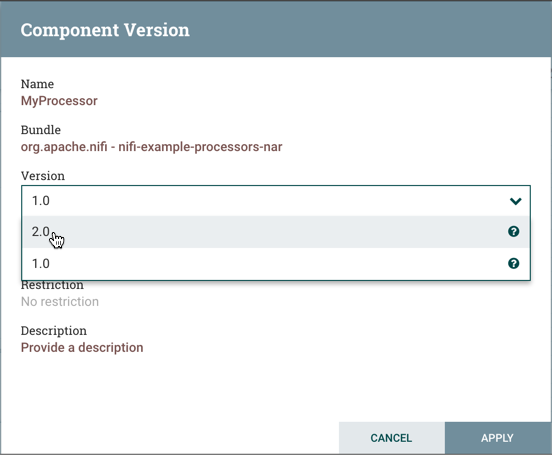 NiFi automatically picks up new or modified variables created in the UI. Variables are scoped by the Process Group they are defined in and are available to any Processor defined at that level and below (i.e. any descendant Processors). Variables in a descendant group override the value in a parent group. More specifically, if a variable x is declared at the root group and also declared inside a process group, components inside the process group will use the value of x defined in the process group. Variable permissions are based solely on the privileges configured on the corresponding Process Group. 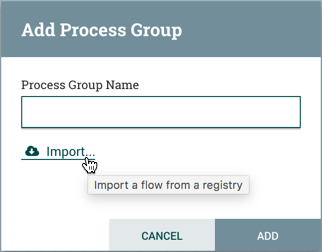 If a user has access to View a process group but does not have access to Modify the process group, the variables can be viewed but not modified. For information on how to manage privileges on components, see the Access Policies section in the System Administrator’s Guide. Identify one or more sets of key/value pairs, and give them to your system administrator. 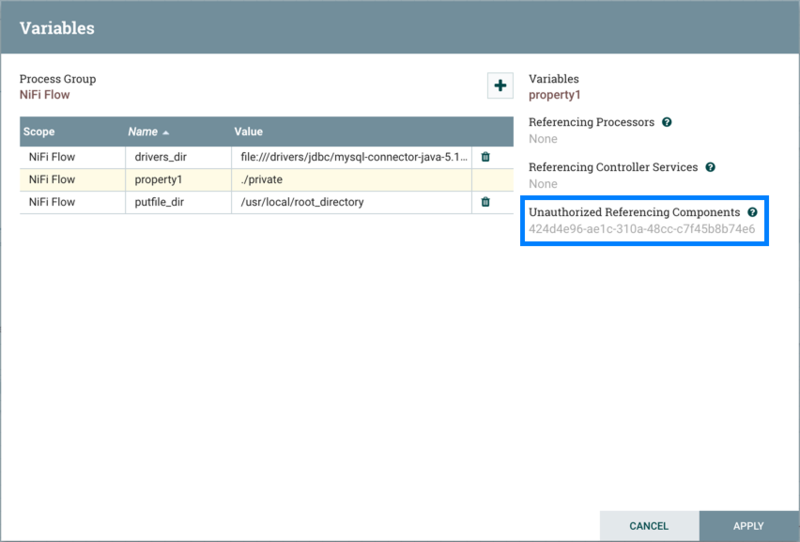 Once the new custom properties have been added, ensure that the nifi.variable.registry.properties field in the nifi.properties file is updated with the custom properties location. NiFi must be restarted for these updates to be picked up. For more information, see the Custom Properties section in the System Administrator’s Guide. Controller Services are shared services that can be used by reporting tasks, processors, and other services to utilize for configuration or task execution. Controller Services defined on the controller level are limited to reporting tasks and other services defined there. 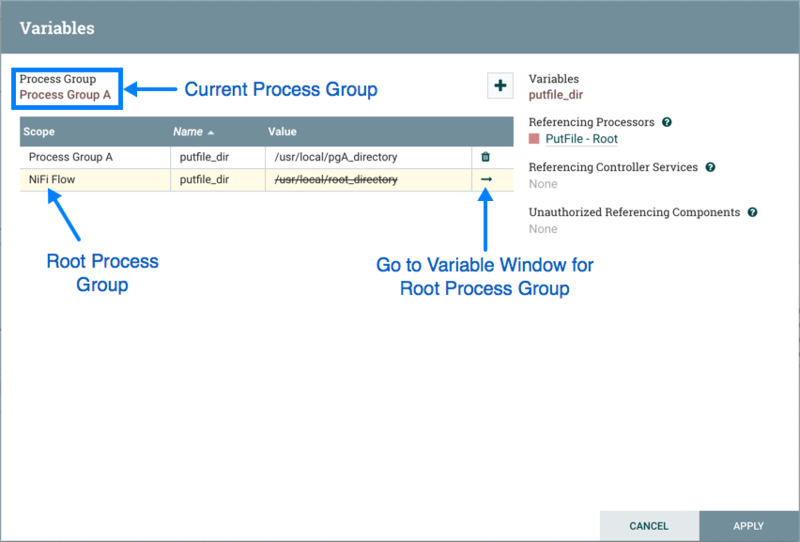 Controller Services for use by processors in your dataflow must be defined in the configuration of the root process group or sub-process group(s) where they will be used. 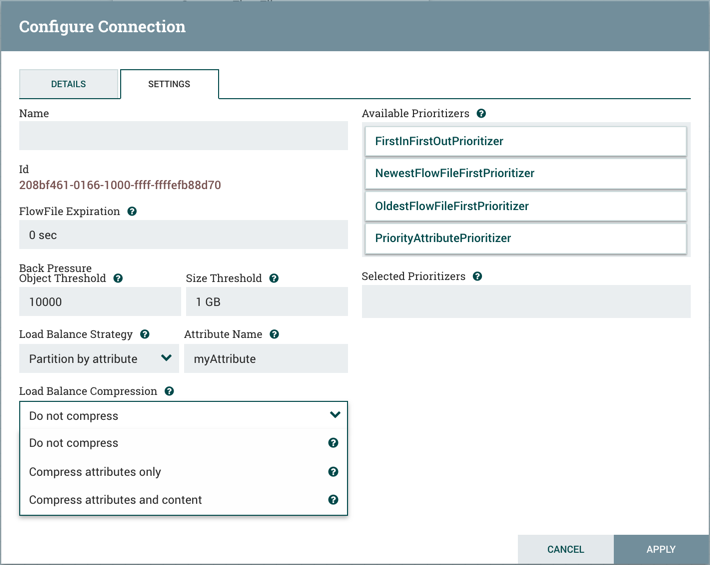 If your NiFi instance is secured, your ability to view and add Controller Services is dependent on the privileges assigned to you. If you do not have access to one or more Controller Services, you are not able to see or access it in the UI. Access privileges can be assigned on a global or Controller Service-specific basis (see Accessing the UI with Multi-Tenant Authorization for more information). 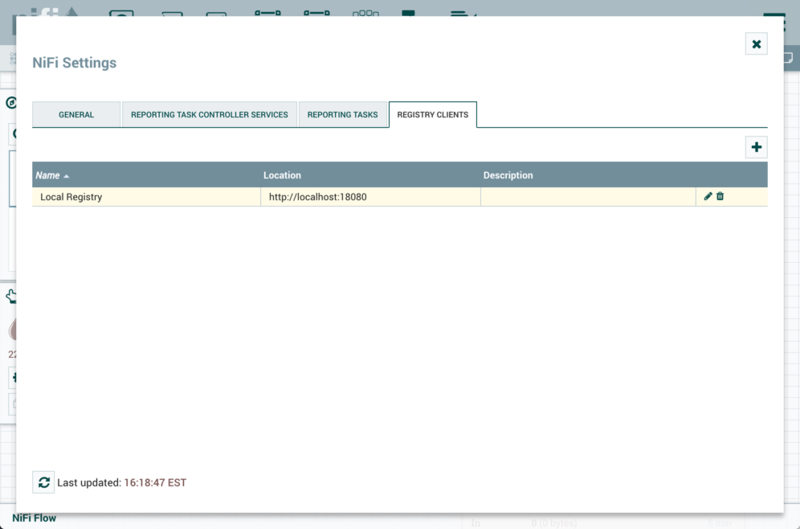 To add a Controller Service for a reporting task, select Controller Settings from the Global Menu. This displays the NiFi Settings window. The window has four tabs: General, Reporting Task Controller Services, Reporting Tasks and Registry Clients. The General tab provides settings for the overall maximum thread counts of the instance. To the right of the General tab is the Reporting Task Controller Services tab. From this tab, the DFM may click the + button in the upper-right corner to create a new Controller Service. The Add Controller Service window opens. This window is similar to the Add Processor window. It provides a list of the available Controller Services on the right and a tag cloud, showing the most common category tags used for Controller Services, on the left. The DFM may click any tag in the tag cloud in order to narrow down the list of Controller Services to those that fit the categories desired. The DFM may also use the Filter field at the top-right of the window to search for the desired Controller Service or use the Source drop-down at the top-left to filter the list by the group who created them. Upon selecting a Controller Service from the list, the DFM can see a description of the service below. 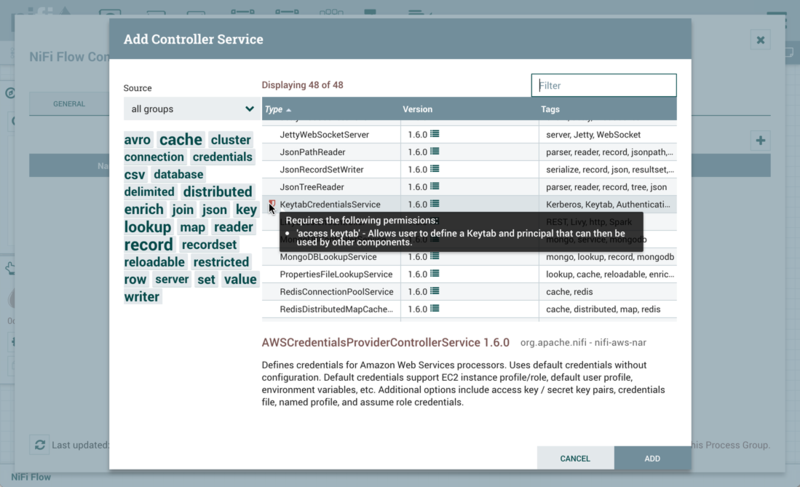 Select the desired controller service and click Add, or simply double-click the name of the service to add it. Once you have added a Controller Service, you can configure it by clicking the Configure button in the far-right column. Other buttons in this column include Enable, Remove and Access Policies. You can obtain information about Controller Services by clicking the Usage and Alerts buttons in the left-hand column. When the DFM clicks the Configure button, a Configure Controller Service window opens. It has three tabs: Settings, Properties,and Comments. This window is similar to the Configure Processor window. The Settings tab provides a place for the DFM to give the Controller Service a unique name (if desired). 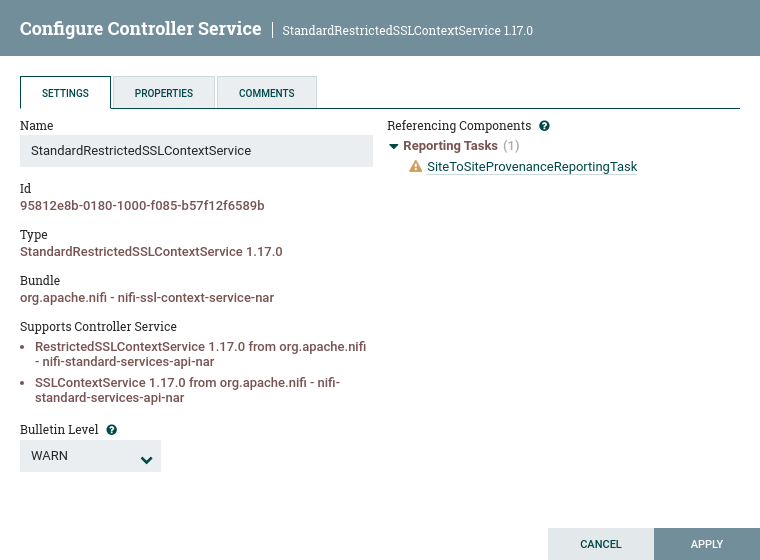 It also lists the UUID, Type, Bundle and Support information for the service and provides a list of other components (reporting tasks or other controller services) that reference the service. The Properties tab lists the various properties that apply to the particular controller service. As with configuring processors, the DFM may hover over the question mark icons to see more information about each property. The Comments tab is just an open-text field, where the DFM may include comments about the service. After configuring a Controller Service, click the Apply button to apply the configuration and close the window, or click the Cancel button to cancel the changes and close the window. 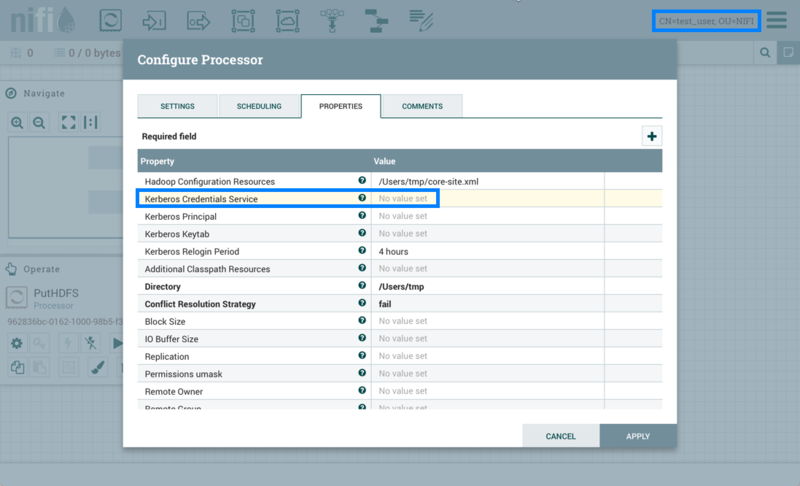 To add a Controller Service for a dataflow, you can either right click a Process Group and select Configure, or click Configure from the Operate Palette. When you click Configure from the Operate Palette with nothing selected on your canvas, you add a Controller Service for your Root Process Group. 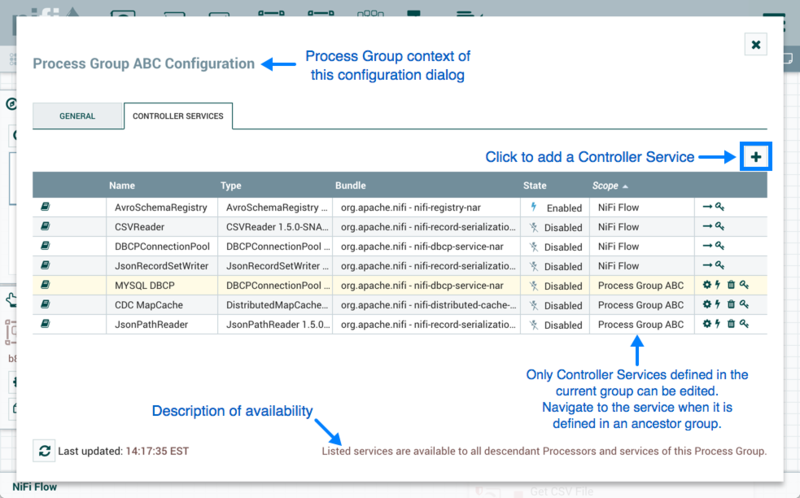 That Controller Service is then available to all nested Process Groups in your dataflow. 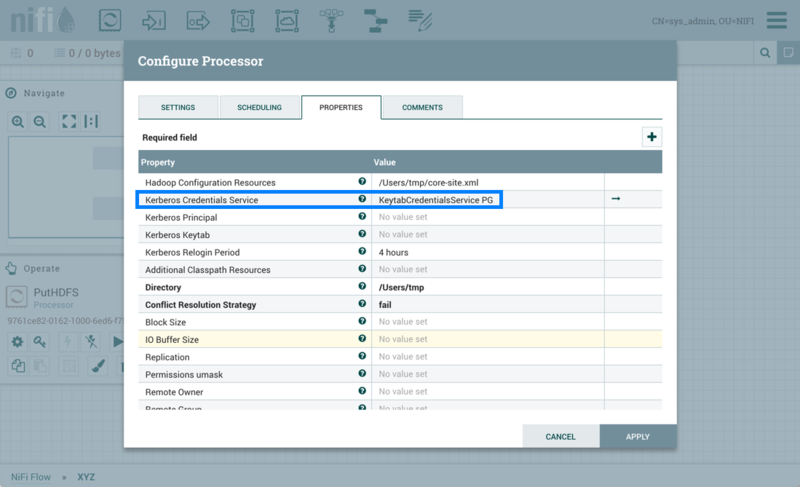 When you select a Process Group on the canvas and then click Configure from either the Operate Palette or the Process Group context menu, the service will be available to all Processors and Controller Services defined in that Process Group and below. Click Configure, either from the Operate Palette, or from the Process Group context menu. 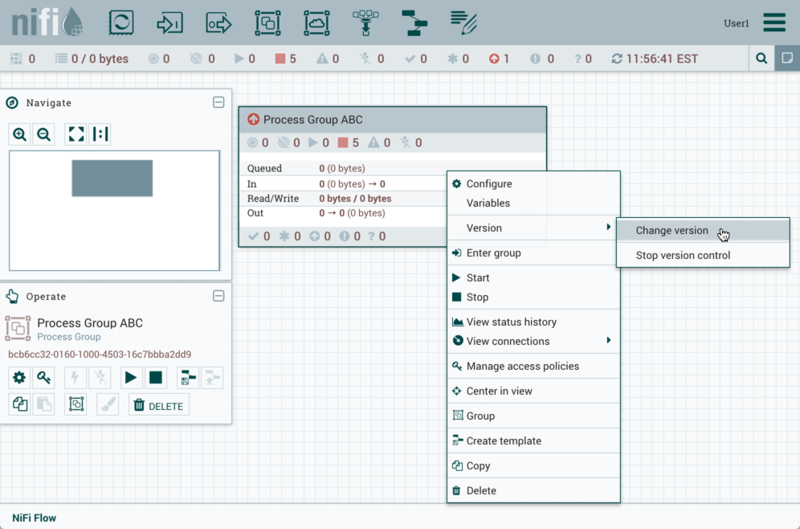 This displays the process group Configuration window. The window has two tabs: General and Controller Services. The General tab is for settings that pertain to general information about the process group. For example, if configuring the root process group, the DFM can provide a unique name for the overall dataflow, as well as comments that describe the flow (Note: this information is visible to any other NiFi instance that connects remotely to this instance (using Remote Process Groups, a.k.a., Site-to-Site)). 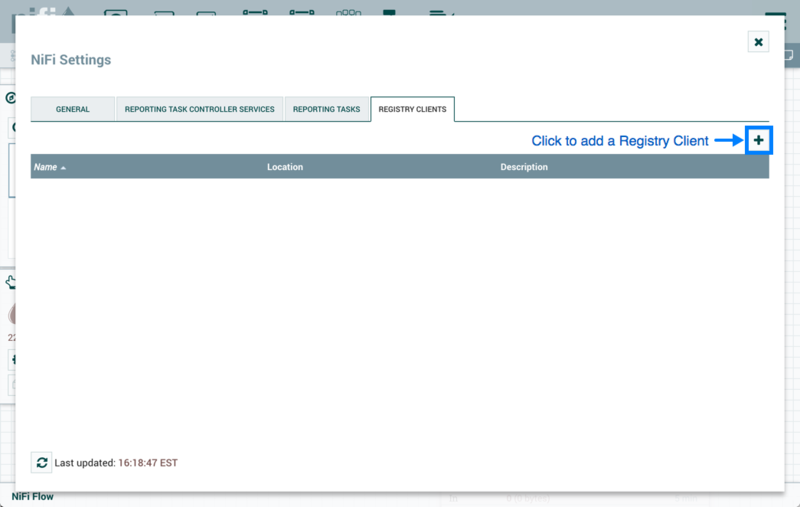 From the Process Group Configuration page, select the Controller Services tab. Click the + button to display the Add Controller Service dialog. Select the Controller Service desired, and click Add. Perform any necessary Controller Service configuration tasks by clicking the Configure icon ( ) in the right-hand column. After a Controller Service has been configured, it must be enabled in order to run. Do this using the Enable button ( ) in the far-right column of the Controller Services tab. 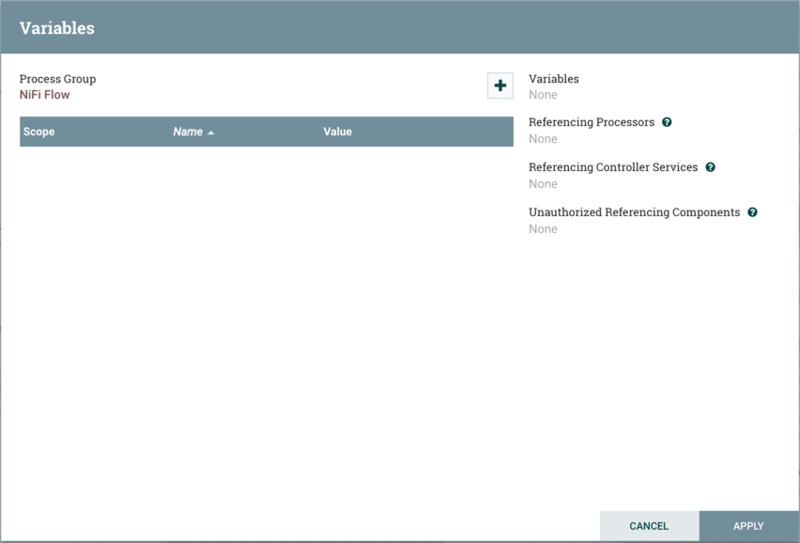 In order to modify an existing/running controller service, the DFM needs to stop/disable it (as well as all referencing reporting tasks and controller services). Do this using the Disable button ( ). 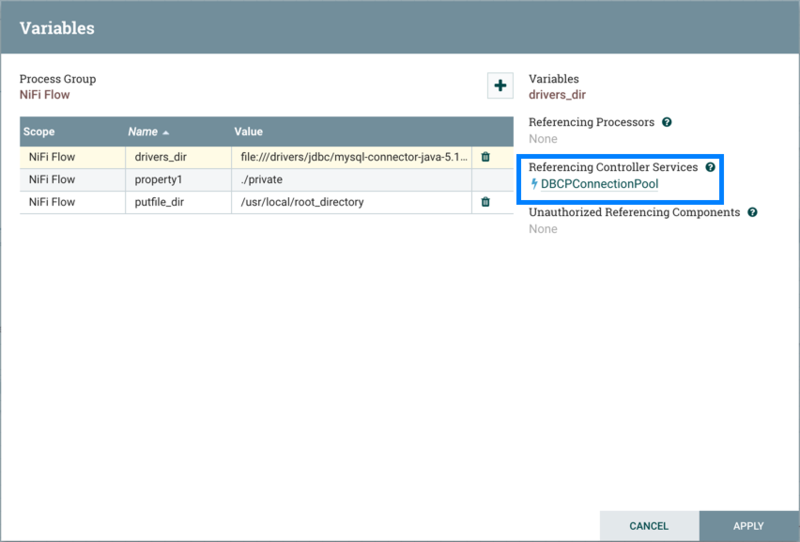 Rather than having to hunt down each component that is referenced by that controller service, the DFM has the ability to stop/disable them when disabling the controller service in question. 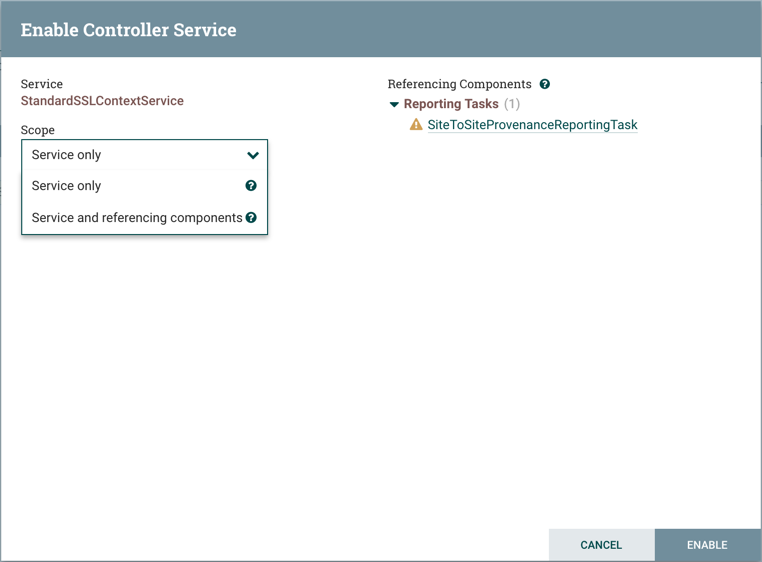 When enabling a controller service, the DFM has the option to either start/enable the controller service and all referencing components or start/enable only the controller service itself. 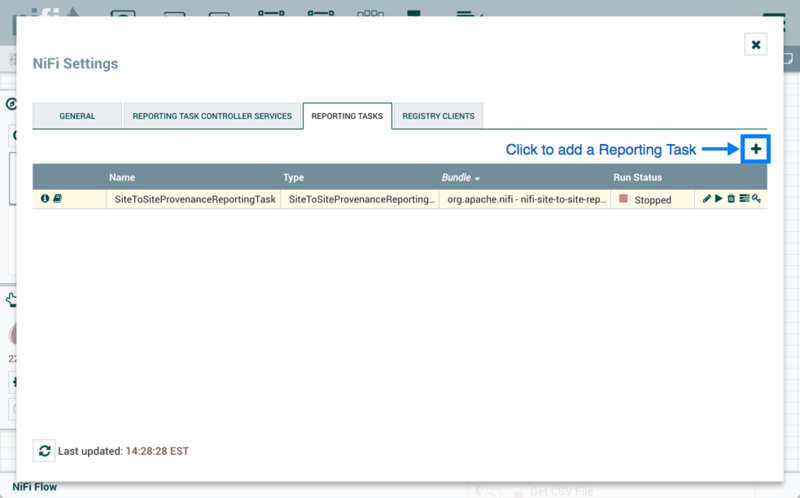 Reporting Tasks run in the background to provide statistical reports about what is happening in the NiFi instance. The DFM adds and configures Reporting Tasks similar to the process for Controller Services. To add a Reporting Task, select Controller Settings from the Global Menu. This displays the NiFi Settings window. 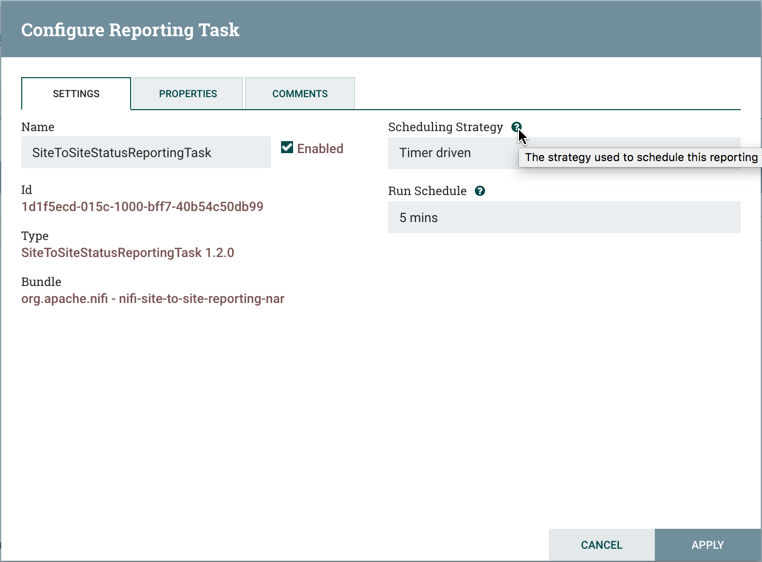 Select the Reporting Tasks tab and click the + button in the upper-right corner to create a new Reporting Task. The Add Reporting Task window opens. This window is similar to the Add Processor window. 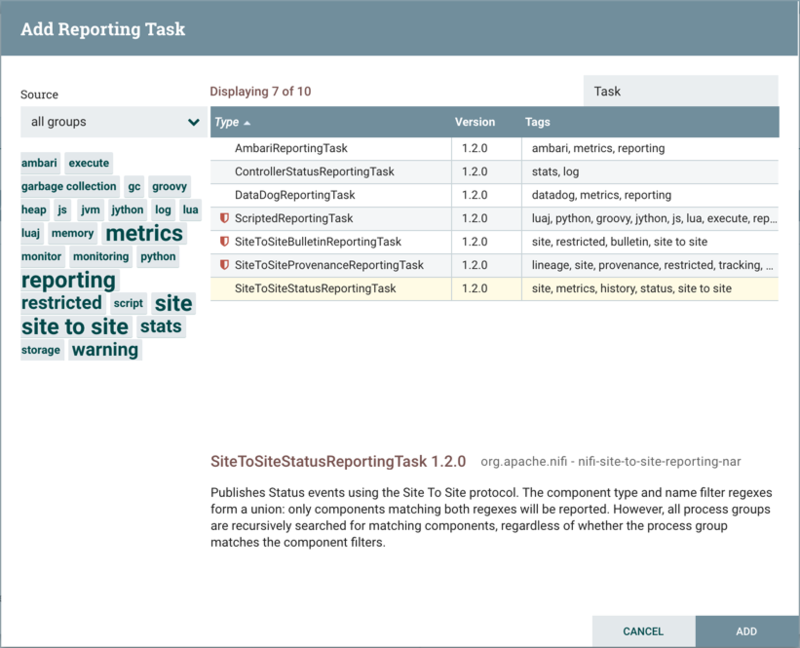 It provides a list of the available Reporting Tasks on the right and a tag cloud, showing the most common category tags used for Reporting Tasks, on the left. The DFM may click any tag in the tag cloud in order to narrow down the list of Reporting Tasks to those that fit the categories desired. The DFM may also use the Filter field at the top-right of the window to search for the desired Reporting Task or use the Source drop-down at the top-left to filter the list by the group who created them. Upon selecting a Reporting Task from the list, the DFM can see a description of the task below. Select the desired reporting task and click Add, or simply double-click the name of the service to add it. Once a Reporting Task has been added, the DFM may configure it by clicking the Edit button in the far-right column. Other buttons in this column include Start, Remove, State and Access Policies. You can obtain information about Reporting Tasks by clicking the View Details, Usage, and Alerts buttons in the left-hand column. When the DFM clicks the Edit button, a Configure Reporting Task window opens. It has three tabs: Settings, Properties, and Comments. This window is similar to the Configure Processor window. The Settings tab provides a place for the DFM to give the Reporting Task a unique name (if desired). It also lists the UUID, Type, and Bundle information for the task and provides settings for the task’s Scheduling Strategy and Run Schedule (similar to the same settings in a processor). The DFM may hover the mouse over the question mark icons to see more information about each setting. The Properties tab lists the various properties that may be configured for the task. The DFM may hover the mouse over the question mark icons to see more information about each property. The Comments tab is just an open-text field, where the DFM may include comments about the task. After configuring the Reporting Task, click the Apply button to apply the configuration and close the window, or click the Cancel button to cancel the changes and close the window. When you want to run the Reporting Task, click the Start button ( ). The user drags the Connection bubble from one component to another until the second component is highlighted. When the user releases the mouse, a 'Create Connection' dialog appears. This dialog consists of two tabs: 'Details' and 'Settings'. They are discussed in detail below. Note that it is possible to draw a connection so that it loops back on the same processor. This can be useful if the DFM wants the processor to try to re-process FlowFiles if they go down a failure Relationship. To create this type of looping connection, simply drag the connection bubble away and then back to the same processor until it is highlighted. Then release the mouse and the same 'Create Connection' dialog appears. 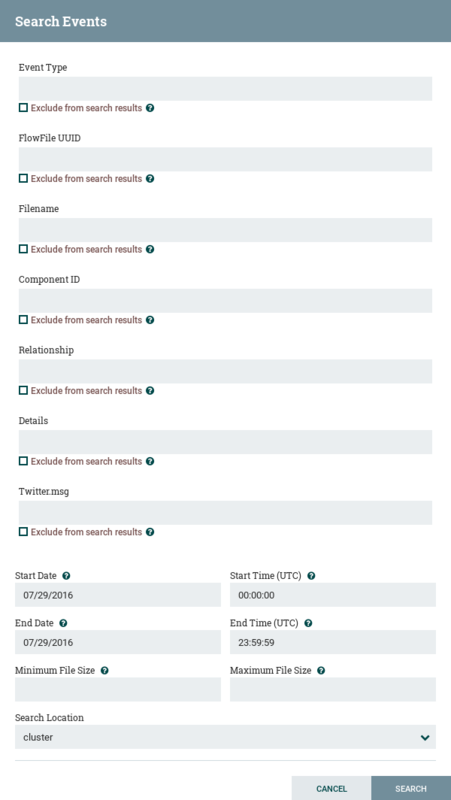 Additionally, this tab provides the ability to choose which Relationships should be included in this Connection. At least one Relationship must be selected. If only one Relationship is available, it is automatically selected. If multiple Connections are added with the same Relationship, any FlowFile that is routed to that Relationship will automatically be 'cloned', and a copy will be sent to each of those Connections. The Connection name is optional. If not specified, the name shown for the Connection will be names of the Relationships that are active for the Connection. FlowFile expiration is a concept by which data that cannot be processed in a timely fashion can be automatically removed from the flow. This is useful, for example, when the volume of data is expected to exceed the volume that can be sent to a remote site. In this case, the expiration can be used in conjunction with Prioritizers to ensure that the highest priority data is processed first and then anything that cannot be processed within a certain time period (one hour, for example) can be dropped. The expiration period is based on the time that the data entered the NiFi instance. In other words, if the file expiration on a given connection is set to '1 hour', and a file that has been in the NiFi instance for one hour reaches that connection, it will expire. The default value of 0 sec indicates that the data will never expire. When a file expiration other than '0 sec' is set, a small clock icon appears on the connection label, so the DFM can see it at-a-glance when looking at a flow on the canvas. NiFi provides two configuration elements for Back Pressure. These thresholds indicate how much data should be allowed to exist in the queue before the component that is the source of the Connection is no longer scheduled to run. This allows the system to avoid being overrun with data. The first option provided is the "Back pressure object threshold." This is the number of FlowFiles that can be in the queue before back pressure is applied. The second configuration option is the "Back pressure data size threshold." This specifies the maximum amount of data (in size) that should be queued up before applying back pressure. This value is configured by entering a number followed by a data size (B for bytes, KB for kilobytes, MB for megabytes, GB for gigabytes, or TB for terabytes). By default each new connection added will have a default Back Pressure Object Threshold of 10,000 objects and Back Pressure Data Size Threshold of 1 GB. These defaults can be changed by modifying the appropriate properties in the nifi.properties file. When back pressure is enabled, small progress bars appear on the connection label, so the DFM can see it at-a-glance when looking at a flow on the canvas. The progress bars change color based on the queue percentage: Green (0-60%), Yellow (61-85%) and Red (86-100%). Hovering your mouse over a bar displays the exact percentage. When the queue is completely full, the Connection is highlighted in red. Do not load balance: Do not load balance FlowFiles between nodes in the cluster. This is the default. Partition by attribute: Determines which node to send a given FlowFile to based on the value of a user-specified FlowFile Attribute. All FlowFiles that have the same value for the Attribute will be sent to the same node in the cluster. If the destination node is disconnected from the cluster or if unable to communicate, the data does not fail over to another node. The data will queue, waiting for the node to be available again. Additionally, if a node joins or leaves the cluster necessitating a rebalance of the data, consistent hashing is applied to avoid having to redistribute all of the data. Round robin: FlowFiles will be distributed to nodes in the cluster in a round-robin fashion. If a node is disconnected from the cluster or if unable to communicate with a node, the data that is queued for that node will be automatically redistributed to another node(s). Single node: All FlowFiles will be sent to a single node in the cluster. Which node they are sent to is not configurable. If the node is disconnected from the cluster or if unable to communicate with the node, the data that is queued for that node will remain queued until the node is available again. In addition to the UI settings, there are Cluster Node Properties related to load balancing that must also be configured in nifi.properties. NiFi persists the nodes that are in a cluster across restarts. This prevents the redistribution of data until all of the nodes have connected. If the cluster is shutdown and a node is not intended to be brought back up, the user is responsible for removing the node from the cluster via the "Cluster" dialog in the UI (see Managing Nodes for more information). After selecting the load balance strategy, the user can configure whether or not data should be compressed when being transferred between nodes in the cluster. Do not compress: FlowFiles will not be compressed. This is the default. Compress attributes only: FlowFile attributes will be compressed, but FlowFile contents will not. Compress attributes and content: FlowFile attributes and contents will be compressed. Hovering over the icon will display the connection’s load balance strategy and compression configuration. The icon in this state also indicates that all data in the connection has been distributed across the cluster. The right-hand side of the tab provides the ability to prioritize the data in the queue so that higher priority data is processed first. Prioritizers can be dragged from the top ('Available prioritizers') to the bottom ('Selected prioritizers'). Multiple prioritizers can be selected. The prioritizer that is at the top of the 'Selected prioritizers' list is the highest priority. If two FlowFiles have the same value according to this prioritizer, the second prioritizer will determine which FlowFile to process first, and so on. If a prioritizer is no longer desired, it can then be dragged from the 'Selected prioritizers' list to the 'Available prioritizers' list. FirstInFirstOutPrioritizer: Given two FlowFiles, the one that reached the connection first will be processed first. 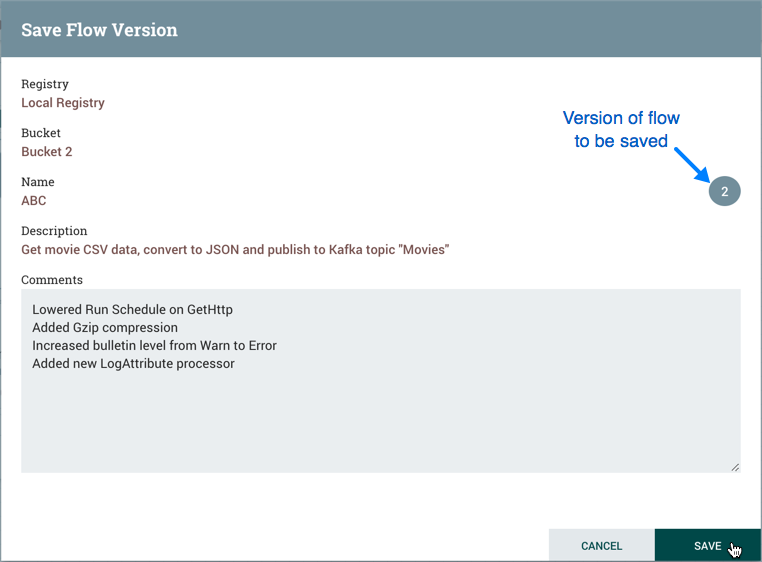 NewestFlowFileFirstPrioritizer: Given two FlowFiles, the one that is newest in the dataflow will be processed first. OldestFlowFileFirstPrioritizer: Given two FlowFiles, the one that is oldest in the dataflow will be processed first. 'This is the default scheme that is used if no prioritizers are selected'. PriorityAttributePrioritizer: Given two FlowFiles, an attribute called “priority” will be extracted. The one that has the lowest priority value will be processed first. 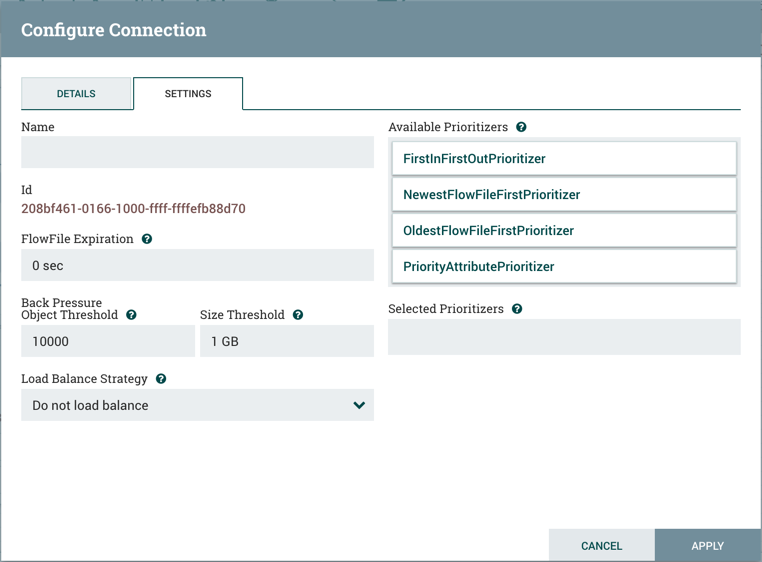 Note that an UpdateAttribute processor should be used to add the "priority" attribute to the FlowFiles before they reach a connection that has this prioritizer set. If only one has that attribute it will go first. Values for the "priority" attribute can be alphanumeric, where "a" will come before "z" and "1" before "9"
If "priority" attribute cannot be parsed as a long, unicode string ordering will be used. For example: "99" and "100" will be ordered so the flowfile with "99" comes first, but "A-99" and "A-100" will sort so the flowfile with "A-100" comes first. With a Load Balance Strategy configured, the connection has a queue per node in addition to the local queue. The prioritizer will sort the data in each queue independently. After a connection has been drawn between two components, the connection’s configuration may be changed, and the connection may be moved to a new destination; however, the processors on either side of the connection must be stopped before a configuration or destination change may be made. To change a connection’s configuration or interact with the connection in other ways, right-click on the connection to open the connection context menu. Configure: This option allows the user to change the configuration of the connection. 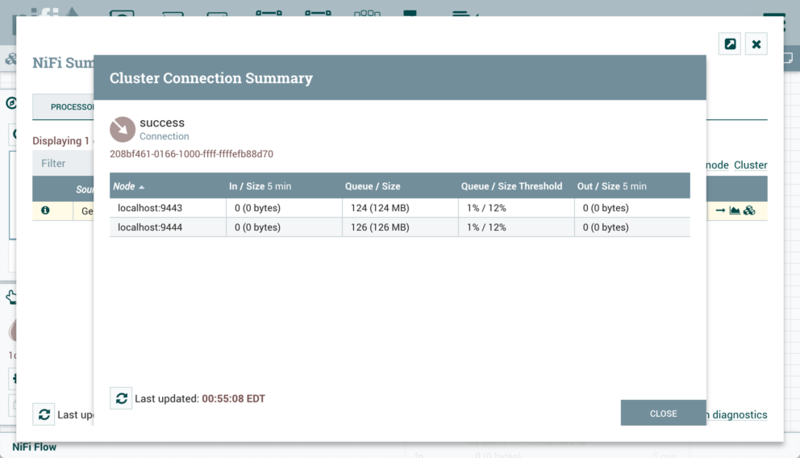 View status history: This option opens a graphical representation of the connection’s statistical information over time. List queue: This option lists the queue of FlowFiles that may be waiting to be processed. Go to source: This option can be useful if there is a long distance between the connection’s source and destination components on the canvas. By clicking this option, the view of the canvas will jump to the source of the connection. Go to destination: Similar to the "Go to source" option, this option changes the view to the destination component on the canvas and can be useful if there is a long distance between two connected components. Bring to front: This option brings the connection to the front of the canvas if something else (such as another connection) is overlapping it. Empty queue: This option allows the DFM to clear the queue of FlowFiles that may be waiting to be processed. This option can be especially useful during testing, when the DFM is not concerned about deleting data from the queue. When this option is selected, users must confirm that they want to delete the data in the queue. Delete: This option allows the DFM to delete a connection between two components. Note that the components on both sides of the connection must be stopped and the connection must be empty before it can be deleted. To add a bend point (or elbow) to an existing connection, simply double-click on the connection in the spot where you want the bend point to be. Then, you can use the mouse to grab the bend point and drag it so that the connection is bent in the desired way. You can add as many bend points as you want. You can also use the mouse to drag and move the label on the connection to any existing bend point. To remove a bend point, simply double-click it again. Site-to-Site optionally makes use of Certificates in order to encrypt data and provide authentication and authorization. Each port can be configured to allow only specific users, and only those users will be able to see that the port even exists. For information on configuring the Certificates, see the Security Configuration section of the System Administrator’s Guide. As nodes in the remote cluster change, those changes are automatically detected and data is scaled out across all nodes in the cluster. Site-to-Site allows batches of FlowFiles to be sent at once in order to avoid the overhead of establishing connections and making multiple round-trip requests between peers. Checksums are automatically produced by both the sender and receiver and compared after the data has been transmitted, in order to ensure that no corruption has occurred. If the checksums don’t match, the transaction will simply be canceled and tried again. As nodes come online or drop out of the remote cluster, or a node’s load becomes heavier or lighter, the amount of data that is directed to that node will automatically be adjusted. When a FlowFile is transferred over this protocol, all of the FlowFile’s attributes are automatically transferred with it. This can be very advantageous in many situations, as all of the context and enrichment that has been determined by one instance of NiFi travels with the data, making for easy routing of the data and allowing users to easily inspect the data. As new technologies and ideas emerge, the protocol for handling Site-to-Site communications are able to change with them. When a connection is made to a remote NiFi instance, a handshake is performed in order to negotiate which protocol and which version of the protocol will be used. This allows new capabilities to be added while still maintaining backward compatibility with all older instances. Additionally, if a vulnerability or deficiency is ever discovered in a protocol, it allows a newer version of NiFi to forbid communication over the compromised versions of the protocol. Site-to-Site is a protocol transferring data between two NiFi instances. Both end can be a standalone NiFi or a NiFi cluster. In this section, the NiFi instance initiates the communications is called Site-to-Site client NiFi instance and the other end as Site-to-Site server NiFi instance to clarify what configuration needed on each NiFi instances. A NiFi instance can be both client and server for Site-to-Site protocol, however, it can only be a client or server within a specific Site-to-Site communication. For example, if there are three NiFi instances A, B and C. A pushes data to B, and B pulls data from C. A — push → B ← pull — C. Then B is not only a server in the communication between A and B, but also a client in B and C.
Remote Process Group: In order to communicate with a remote NiFi instance via Site-to-Site, simply drag a Remote Process Group onto the canvas and enter the URL of the remote NiFi instance (for more information on the components of a Remote Process Group, see Remote Process Group Transmission section of this guide.) The URL is the same URL you would use to go to that instance’s User Interface. At that point, you can drag a connection to or from the Remote Process Group in the same way you would drag a connection to or from a Processor or a local Process Group. When you drag the connection, you will have a chance to choose which Port to connect to. Note that it may take up to one minute for the Remote Process Group to determine which ports are available. 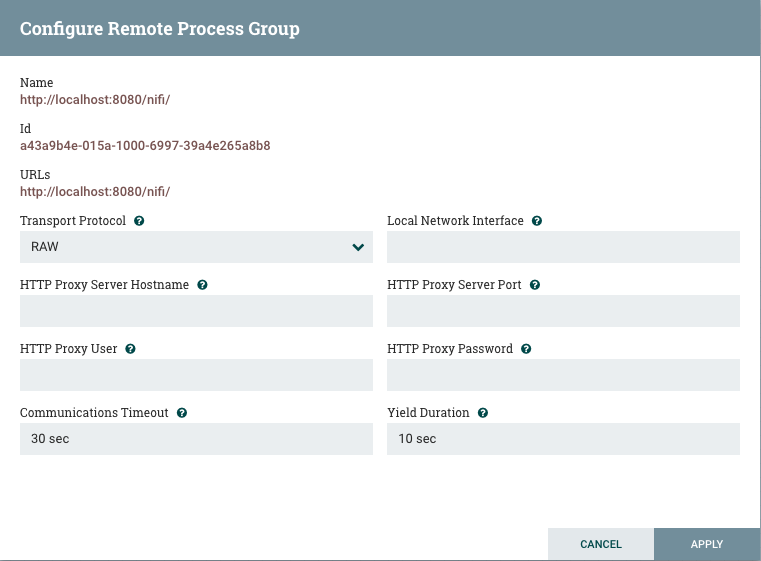 If the connection is dragged starting from the Remote Process Group, the ports shown will be the Output Ports of the remote group, as this indicates that you will be pulling data from the remote instance. 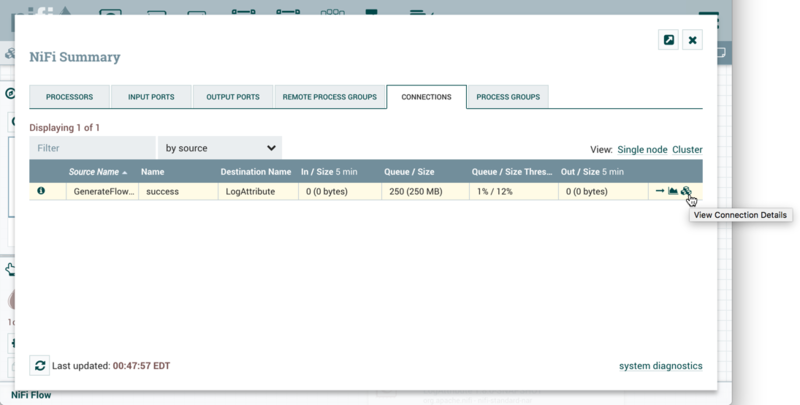 If the connection instead ends on the Remote Process Group, the ports shown will be the Input Ports of the remote group, as this implies that you will be pushing data to the remote instance. If the remote instance is configured to use secure data transmission, you will see only ports that you are authorized to communicate with. For information on configuring NiFi to run securely, see the System Administrator’s Guide. By default, it is set to RAW which uses raw socket communication using a dedicated port. HTTP transport protocol is especially useful if the remote NiFi instance is in a restricted network that only allow access through HTTP(S) protocol or only accessible from a specific HTTP Proxy server. For accessing through a HTTP Proxy Server, BASIC and DIGEST authentication are supported. Local Network Interface: In some cases, it may be desirable to prefer one network interface over another. For example, if a wired interface and a wireless interface both exist, the wired interface may be preferred. This can be configured by specifying the name of the network interface to use in this box. If the value entered is not valid, the Remote Process Group will not be valid and will not communicate with other NiFi instances until this is resolved. 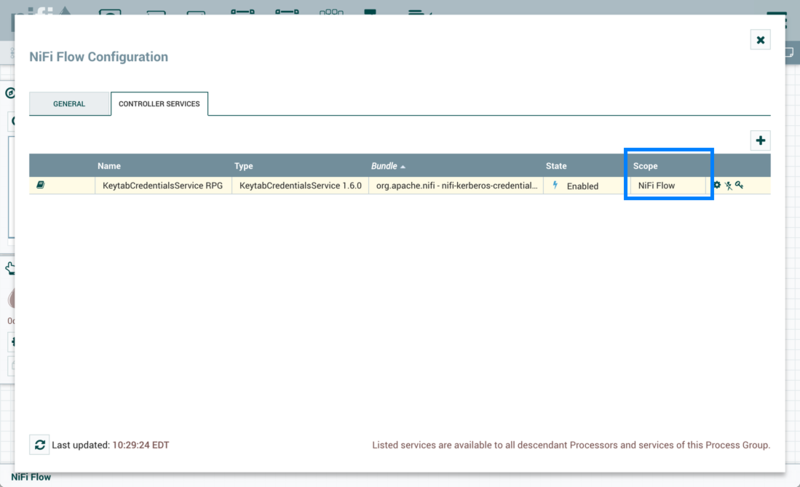 Retrieve Site-to-Site Details: If your NiFi is running securely, in order for another NiFi instance to retrieve information from your instance, it needs to be added to the Global Access "retrieve site-to-site details" policy. 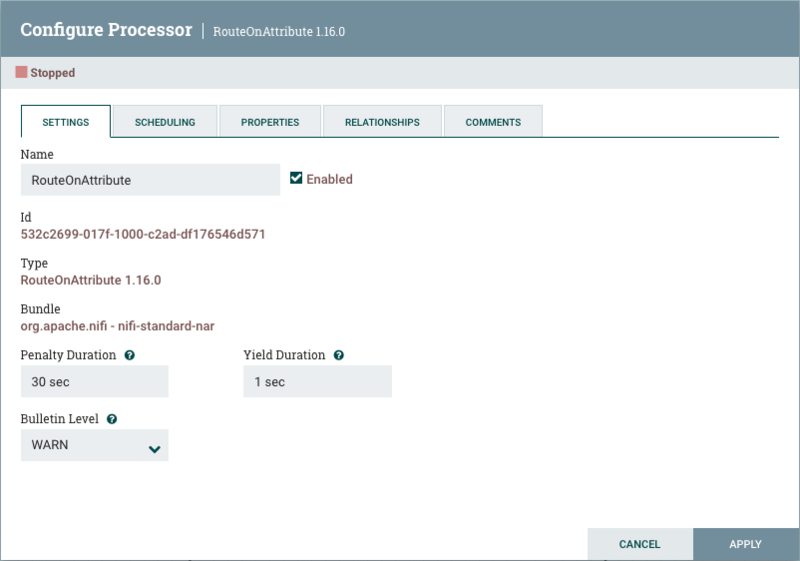 This will allow the other instance to query your instance for details such as name, description, available peers (nodes when clustered), statistics, OS port information and available Input and Output ports. Utilizing Input and Output ports in a secured instance requires additional policy configuration as described below. Input Port: In order to allow another NiFi instance to push data to your local instance, you can simply drag an Input Port onto the Root Process Group of your canvas. After entering a name for the port, it will be added to your flow. You can now right-click on the Input Port and choose Configure in order to adjust the name and the number of concurrent tasks that are used for the port. If Site-to-Site is configured to run securely, you will need to manage the port’s "receive data via site-to-site" component access policy. Only those users who have been added to the policy will be able to communicate with the port. Output Port: Similar to an Input Port, a DataFlow Manager may choose to add an Output Port to the Root Process Group. The Output Port allows an authorized NiFi instance to remotely connect to your instance and pull data from the Output Port. Configuring the Output Port and managing the port’s access policies will again allow the DFM to control how many concurrent tasks are allowed, as well as which users are authorized to pull data from the instance being configured. In addition to other instances of NiFi, some other applications may use a Site-to-Site client in order to push data to or receive data from a NiFi instance. 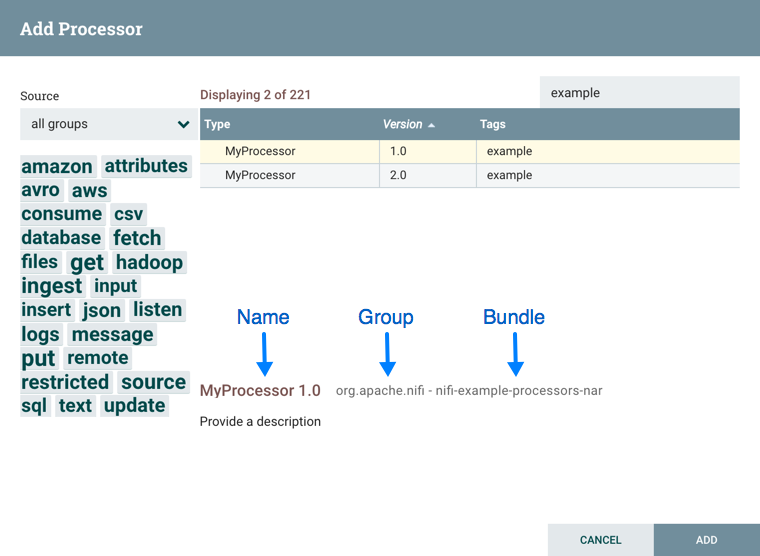 For example, NiFi provides an Apache Storm spout and an Apache Spark Receiver that are able to pull data from NiFi’s Root Group Output Ports. For information on how to enable and configure Site-to-Site on a NiFi instance, see the Site-to-Site Properties section of the System Administrator’s Guide. For information on how to configure access policies, see the Access Properties section of the System Administrator’s Guide. This section has described the steps required to build a dataflow. Now, to put it all together. The following example dataflow consists of just two processors: GenerateFlowFile and LogAttribute. These processors are normally used for testing, but they can also be used to build a quick flow for demonstration purposes and see NiFi in action. On the Scheduling tab, set Run schedule to: 5 sec. Note that the GenerateFlowFile processor can create many FlowFiles very quickly; that’s why setting the Run schedule is important so that this flow does not overwhelm the system NiFi is running on. On the Settings tab, under Auto-terminate relationships, select the checkbox next to Success. This will terminate FlowFiles after this processor has successfully processed them. Also on the Settings tab, set the Bulletin level to Info. 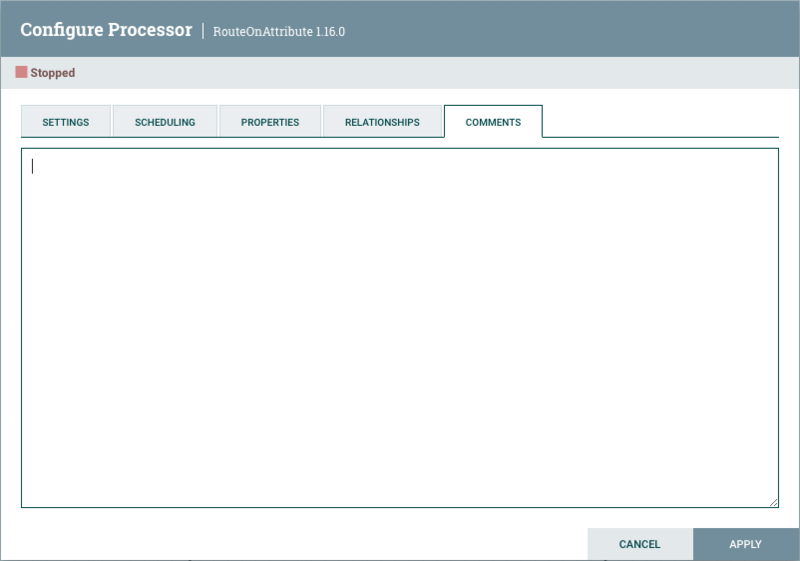 This way, when the dataflow is running, this processor will display the bulletin icon (see Anatomy of a Processor), and the user may hover over it with the mouse to see the attributes that the processor is logging. Now see the following section on how to start and stop the dataflow. When the dataflow is running, be sure to note the statistical information that is displayed on the face of each processor (see Anatomy of a Processor). When a component is added to the NiFi canvas, it is in the Stopped state. In order to cause the component to be triggered, the component must be started. Once started, the component can be stopped at any time. From a Stopped state, the component can be configured, started, or disabled. The component’s configuration must be valid. All defined Relationships for the component must be connected to another component or auto-terminated. The component must be stopped. The component must be enabled. The component must have no active tasks. 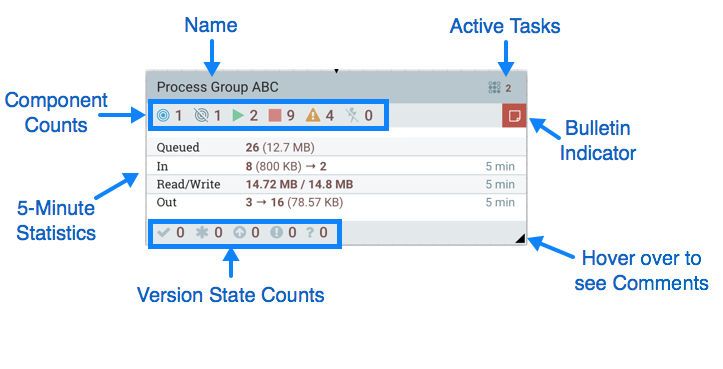 For more information about active tasks, see the "Anatomy of …​" sections under Monitoring of DataFlow (Anatomy of a Processor, Anatomy of a Process Group, Anatomy of a Remote Process Group). Components can be started by selecting all of the components to start and then clicking the Start button ( ) in the Operate Palette or by right-clicking a single component and choosing Start from the context menu. 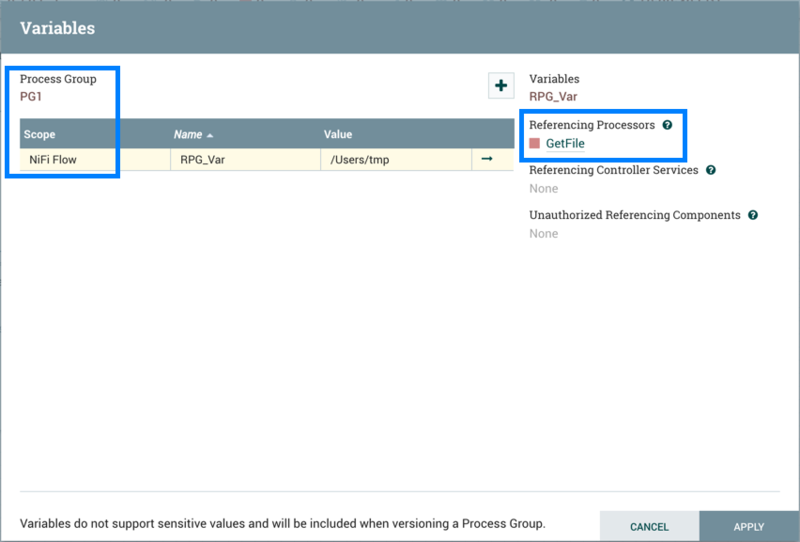 If starting a Process Group, all components within that Process Group (including child Process Groups) will be started, with the exception of those components that are invalid or disabled. Once started, the status indicator of a Processor will change to a Play symbol ( ). A component can be stopped any time that it is running. A component is stopped by right-clicking on the component and clicking Stop from the context menu, or by selecting the component and clicking the Stop button ( ) in the Operate Palette. If a Process Group is stopped, all of the components within the Process Group (including child Process Groups) will be stopped. Once stopped, the status indicator of a component will change to the Stop symbol ( ). Stopping a component does not interrupt its currently running tasks. Rather, it stops scheduling new tasks to be performed. The number of active tasks is shown in the top-right corner of the Processor (See Anatomy of a Processor for more information). When a component is enabled, it is able to be started. Users may choose to disable components when they are part of a dataflow that is still being assembled, for example. Typically, if a component is not intended to be run, the component is disabled, rather than being left in the Stopped state. This helps to distinguish between components that are intentionally not running and those that may have been stopped temporarily (for instance, to change the component’s configuration) and inadvertently were never restarted. When it is desirable to re-enable a component, it can be enabled by selecting the component and clicking the Enable button ( ) in the Operate Palette. This is available only when the selected component or components are disabled. Alternatively, a component can be enabled by checking the checkbox next to the "Enabled" option in the Settings tab of the Processor configuration dialog or the configuration dialog for a Port. Once enabled, the component’s status indicator will change to either Invalid ( ) or Stopped ( ), depending on whether or not the component is valid. A component is then disabled by selecting the component and clicking the Disable button ( ) in the Operate Palette, or by clearing the checkbox next to the "Enabled" option in the Settings tab of the Processor configuration dialog or the configuration dialog for a Port. Only Ports and Processors can be enabled and disabled. Remote Process Groups provide a mechanism for sending data to or retrieving data from a remote instance of NiFi. 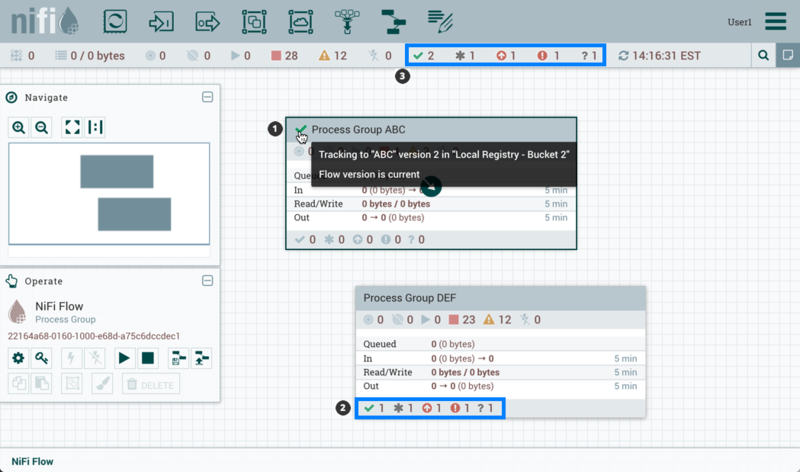 When a Remote Process Group (RPG) is added to the canvas, it is added with the Transmission Disabled, as indicated by the icon ( ) in the top-left corner. When Transmission is Disabled, it can be enabled by right-clicking on the RPG and clicking the "Enable Transmission" menu item. This will cause all ports for which there is a Connection to begin transmitting data. This will cause the status indicator to then change to the Transmission Enabled icon ( ). If there are problems communicating with the Remote Process Group, a Warning indicator ( ) may instead be present in the top-left corner. Hovering over this Warning indicator with the mouse will provide more information about the problem. 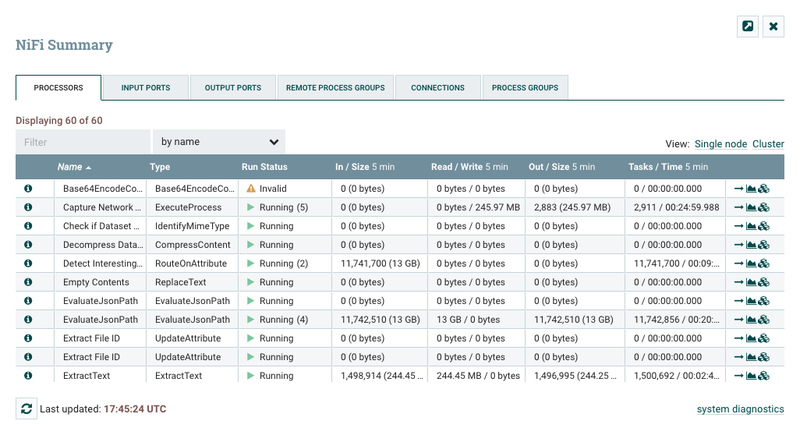 The left-hand side lists all of the Input Ports that the remote instance of NiFi allows data to be sent to. The right-hand side lists all of the Output Ports from which this instance is able to pull data. If the remote instance is using secure communications (the URL of the NiFi instance begins with https://, rather than http://), any Ports that the remote instance has not made available to this instance will not be shown. If a Port that is expected to be shown is not shown in this dialog, ensure that the instance has proper permissions and that the Remote Process Group’s flow is current. This can be checked by closing the Port Configuration Dialog and looking at the bottom-right corner of the Remote Process Group. The date at which the flow was last refreshed is shown. If the flow appears to be outdated, it can be updated by right-clicking on the Remote Process Group and selecting "Refresh flow." (See Anatomy of a Remote Process Group for more information). The on/off switch provides a mechanism to enable and disable transmission for each Port in the Remote Process Group independently. Those Ports that are connected but are not currently transmitting can be configured by clicking the pencil icon ( ) below the on/off switch. Clicking this icon will allow the DFM to change the number of Concurrent tasks and whether or not compression should be used when transmitting data to or from this Port. NiFi provides various mechanisms for getting around a dataflow. The NiFi User Interface section describes various ways to navigate around the NiFi canvas; however, once a flow exists on the canvas, there are additional ways to get from one component to another. When multiple Process Groups exist in a flow, breadcrumbs appear at the bottom of the screen, providing a way to navigate between them. In addition, to enter a Process Group that is currently visible on the canvas, simply double-click it, thereby "drilling down" into it. Connections also provide a way to jump from one location to another within the flow. Right-click on a connection and select "Go to source" or "Go to destination" in order to jump to one end of the connection or another. This can be very useful in large, complex dataflows, where the connection lines may be long and span large areas of the canvas. Finally, all components provide the ability to jump forward or backward within the flow. Right-click any component (e.g., a processor, process group, port, etc.) and select either "Upstream connections" or "Downstream connections". A dialog window will open, showing the available upstream or downstream connections that the user may jump to. This can be especially useful when trying to follow a dataflow in a backward direction. It is typically easy to follow the path of a dataflow from start to finish, drilling down into nested process groups; however, it can be more difficult to follow the dataflow in the other direction. A hyperlink can be used to navigate directly to a component on the NiFi canvas. This is especially useful when Multi-Tenant Authorization is configured. For example, a URL can be given to a user to direct them to the specific process group to which they have privileges. Linking to multiple components on the canvas is supported, with the restriction that the length of the URL cannot exceed a 2000 character limit. 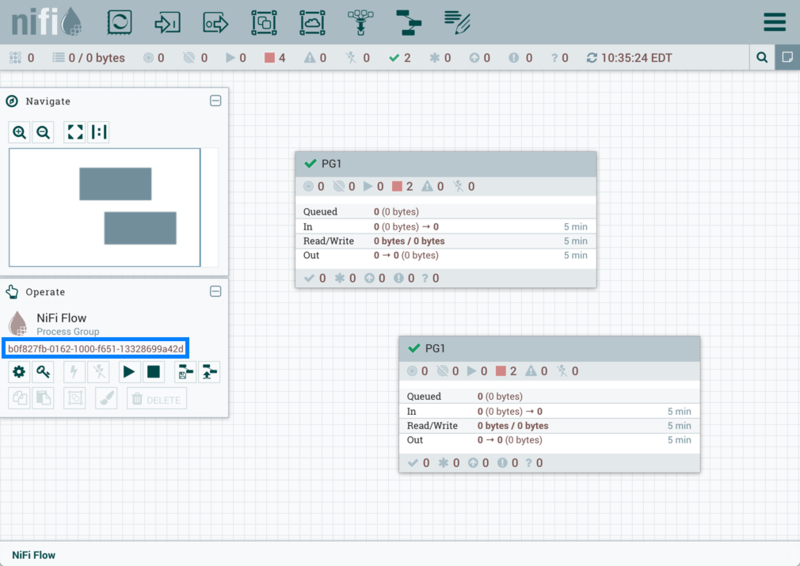 Components on the NiFi canvas can be aligned to more precisely arrange your dataflow. To do this, first select all the components you want to align. Then right-click to see the context menu and select “Align vertically” or “Align horizontally” depending on your desired result. NiFi provides a great deal of information about the DataFlow in order to monitor its health and status. The Status bar provides information about the overall system health (see NiFi User Interface). Processors, Process Groups, and Remote Process Groups provide fine-grained details about their operations. Connections and Process Groups provide information about the amount of data in their queues. The Summary Page provides information about all of the components on the canvas in a tabular format and also provides System Diagnostics that include disk usage, CPU utilization, and Java Heap and Garbage Collection information. In a clustered environment, this information is available per-node or as aggregates across the entire cluster. We will explore each of these monitoring artifacts below. Processor Type: NiFi provides several different types of Processors in order to allow for a wide range of tasks to be performed. Each type of Processor is designed to perform one specific task. The Processor type (PutFile, in this example) describes the task that this Processor performs. In this case, the Processor writes a FlowFile to disk - or "Puts" a FlowFile to a File. Bulletin Indicator: When a Processor logs that some event has occurred, it generates a Bulletin to notify those who are monitoring NiFi via the User Interface. The DFM is able to configure which bulletins should be displayed in the User Interface by updating the "Bulletin level" field in the "Settings" tab of the Processor configuration dialog. The default value is WARN, which means that only warnings and errors will be displayed in the UI. This icon is not present unless a Bulletin exists for this Processor. When it is present, hovering over the icon with the mouse will provide a tooltip explaining the message provided by the Processor as well as the Bulletin level. If the instance of NiFi is clustered, it will also show the Node that emitted the Bulletin. Bulletins automatically expire after five minutes. Running: The Processor is currently running. Stopped: The Processor is valid and enabled but is not running. Invalid: The Processor is enabled but is not currently valid and cannot be started. Hovering over this icon will provide a tooltip indicating why the Processor is not valid. Disabled: The Processor is not running and cannot be started until it has been enabled. This status does not indicate whether or not the Processor is valid. Processor Name: This is the user-defined name of the Processor. By default, the name of the Processor is the same as the Processor Type. In the example, this value is "Copy to /review". Active Tasks: The number of tasks that this Processor is currently executing. This number is constrained by the "Concurrent tasks" setting in the "Scheduling" tab of the Processor configuration dialog. Here, we can see that the Processor is currently performing one task. If the NiFi instance is clustered, this value represents the number of tasks that are currently executing across all nodes in the cluster. In: The amount of data that the Processor has pulled from the queues of its incoming Connections. This value is represented as <count> (<size>) where <count> is the number of FlowFiles that have been pulled from the queues and <size> is the total size of those FlowFiles' content. In this example, the Processor has pulled 29 FlowFiles from the input queues, for a total of 14.16 megabytes (MB). Read/Write: The total size of the FlowFile content that the Processor has read from disk and written to disk. This provides valuable information about the I/O performance that this Processor requires. Some Processors may only read the data without writing anything while some will not read the data but will only write data. Others will neither read nor write data, and some Processors will both read and write data. In this example, we see that in the past five minutes, this Processor has read 4.88 MB of the FlowFile content and has written 4.88 MB as well. This is what we would expect, since this Processor simply copies the contents of a FlowFile to disk. Note, however, that this is not the same as the amount of data that it pulled from its input queues. This is because some of the files that it pulled from the input queues already exist in the output directory, and the Processor is configured to route FlowFiles to failure when this occurs. Therefore, for those files which already existed in the output directory, data was neither read nor written to disk. Out: The amount of data that the Processor has transferred to its outbound Connections. This does not include FlowFiles that the Processor removes itself, or FlowFiles that are routed to connections that are auto-terminated. Like the "In" metric above, this value is represented as <count> (<size>) where <count> is the number of FlowFiles that have been transferred to outbound Connections and <size> is the total size of those FlowFiles' content. In this example, all of the Relationships are configured to be auto-terminated, so no FlowFiles are reported as having been transferred Out. Tasks/Time: The number of times that this Processor has been triggered to run in the past 5 minutes, and the amount of time taken to perform those tasks. The format of the time is <hour>:<minute>:<second>. Note that the amount of time taken can exceed five minutes, because many tasks can be executed in parallel. For instance, if the Processor is scheduled to run with 60 Concurrent tasks, and each of those tasks takes one second to complete, it is possible that all 60 tasks will be completed in a single second. However, in this case we will see the Time metric showing that it took 60 seconds, instead of 1 second. This time can be thought of as "System Time," or said another way, this value is 60 seconds because that’s the amount of time it would have taken to perform the action if only a single concurrent task were used. Name: This is the user-defined name of the Process Group. This name is set when the Process Group is added to the canvas. The name can later by changed by right-clicking on the Process Group and clicking the "Configure" menu option. In this example, the name of the Process Group is "Process Group ABC." Bulletin Indicator: When a child component of a Process Group emits a bulletin, that bulletin is propagated to the component’s parent Process Group, as well. When any component has an active Bulletin, this indicator will appear, allowing the user to hover over the icon with the mouse to see the Bulletin. Active Tasks: The number of tasks that are currently executing by the components within this Process Group. Here, we can see that the Process Group is currently performing two tasks. If the NiFi instance is clustered, this value represents the number of tasks that are currently executing across all nodes in the cluster. Queued: The number of FlowFiles currently enqueued within the Process Group. This field is represented as <count> (<size>) where <count> is the number of FlowFiles that are currently enqueued in the Process Group and <size> is the total size of those FlowFiles' content. In this example, the Process Group currently has 26 FlowFiles enqueued with a total size of 12.7 megabytes (MB). In: The number of FlowFiles that have been transferred into the Process Group through all of its Input Ports over the past 5 minutes. This field is represented as <count> / <size> → <ports> where <count> is the number of FlowFiles that have entered the Process Group in the past 5 minutes, <size> is the total size of those FlowFiles' content and <ports> is the number of Input Ports. In this example, 8 FlowFiles have entered the Process Group with a total size of 800 KB and two Input Ports exist. Read/Write: The total size of the FlowFile content that the components within the Process Group have read from disk and written to disk. This provides valuable information about the I/O performance that this Process Group requires. In this example, we see that in the past five minutes, components within this Process Group have read 14.72 MB of the FlowFile content and have written 14.8 MB. Out: The number of FlowFiles that have been transferred out of the Process Group through its Output Ports over the past 5 minutes. This field is represented as <ports> → <count> (<size>) where <ports> is the number of Output Ports, <count> is the number of FlowFiles that have exited the Process Group in the past 5 minutes and <size> is the total size of those FlowFiles' content. In this example, there are three Output Ports, 16 FlowFiles have exited the Process Group and their total size is 78.57 KB. Transmitting Ports: The number of Remote Process Group Ports that currently are configured to transmit data to remote instances of NiFi or pull data from remote instances of NiFi. Non-Transmitting Ports: The number of Remote Process Group Ports that are currently connected to components within this Process Group but currently have their transmission disabled. Running Components: The number of Processors, Input Ports, and Output Ports that are currently running within this Process Group. Stopped Components: The number of Processors, Input Ports, and Output Ports that are currently not running but are valid and enabled. These components are ready to be started. Invalid Components: The number of Processors, Input Ports, and Output Ports that are enabled but are currently not in a valid state. This may be due to misconfigured properties or missing Relationships. Disabled Components: The number of Processors, Input Ports, and Output Ports that are currently disabled. These components may or may not be valid. If the Process Group is started, these components will not cause any errors but will not be started. Version State Counts: The Version State Counts element provides information about how many versioned process groups are within the Process Group. See Version States for more information. 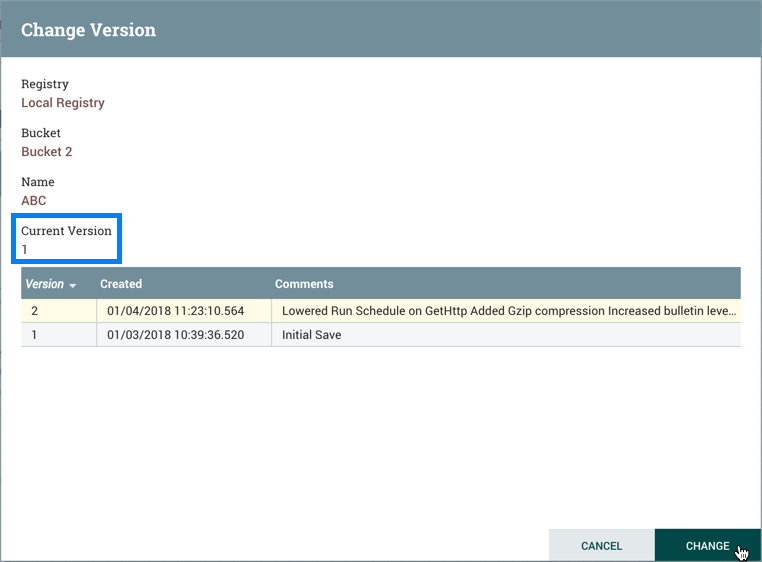 Comments: When the Process Group is added to the canvas, the user is given the option of specifying Comments in order to provide information about the Process Group. The comments can later be changed by right-clicking on the Process Group and clicking the "Configure" menu option. 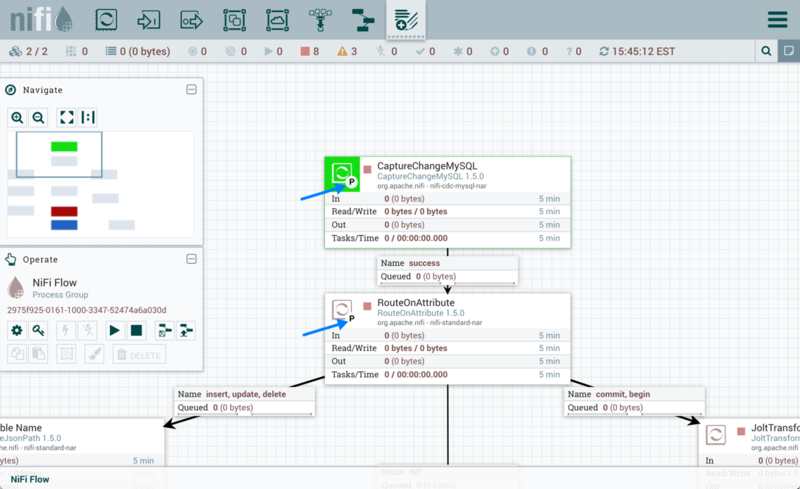 When creating a DataFlow, it is often necessary to transfer data from one instance of NiFi to another. In this case, the remote instance of NiFi can be thought of as a Process Group. For this reason, NiFi provides the concept of a Remote Process Group. 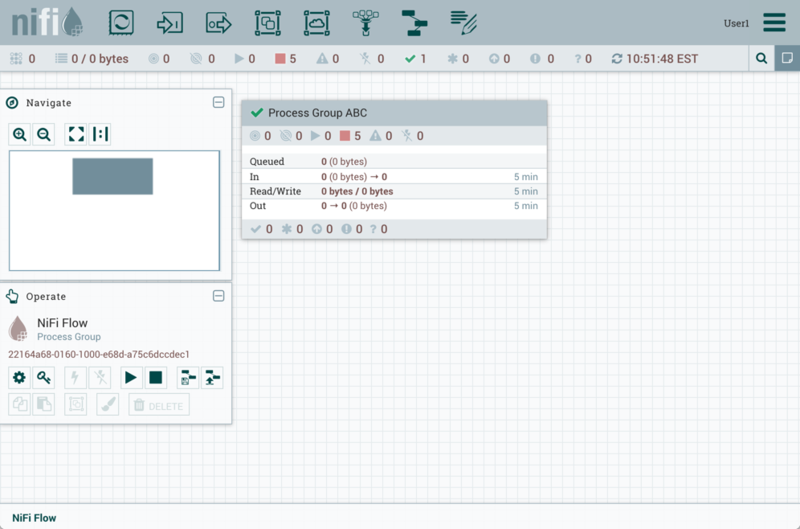 From the User Interface, the Remote Process Group looks similar to the Process Group. However, rather than showing information about the inner workings and state of a Remote Process Group, such as queue sizes, the information rendered about a Remote Process Group is related to the interaction that occurs between this instance of NiFi and the remote instance. The image above shows the different elements that make up a Remote Process Group. Here, we provide an explanation of the icons and details about the information provided. Transmission Status: The Transmission Status indicates whether or not data Transmission between this instance of NiFi and the remote instance is currently enabled. The icon shown will be the Transmission Enabled icon ( ) if any of the Input Ports or Output Ports is currently configured to transmit or the Transmission Disabled icon ( ) if all of the Input Ports and Output Ports that are currently connected are stopped. Remote Instance Name: This is the name of the NiFi instance that was reported by the remote instance. When the Remote Process Group is first created, before this information has been obtained, the URL of the remote instance will be shown here instead. Remote Instance URL: This is the URL of the remote instance that the Remote Process Group points to. This URL is entered when the Remote Process Group is added to the canvas and it cannot be changed. Secure Indicator: This icon indicates whether or not communications with the remote NiFi instance are secure. If communications with the remote instance are secure, this will be indicated by the "Locked" icon ( ). If the communications are not secure, this will be indicated by the "Unlocked" icon ( ). If the communications are secure, this instance of NiFi will not be able to communicate with the remote instance until an administrator for the remote instance grants access. 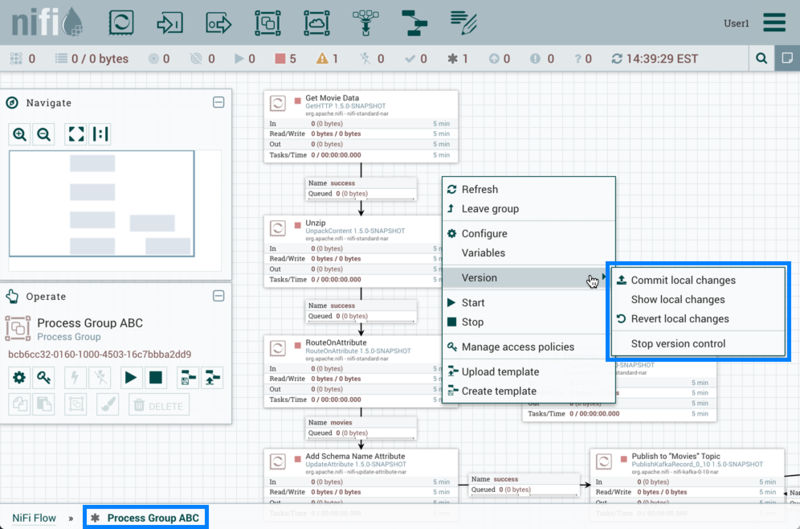 Whenever the Remote Process Group is added to the canvas, this will automatically initiate a request to have a user for this instance of NiFi created on the remote instance. This instance will be unable to communicate with the remote instance until an administrator on the remote instance adds the user to the system and adds the "NiFi" role to the user. In the event that communications are not secure, the Remote Process Group is able to receive data from anyone, and the data is not encrypted while it is transferred between instances of NiFi. 5-Minute Statistics: Two statistics are shown for Remote Process Groups: Sent and Received. Both of these are in the format <count> (<size>) where <count> is the number of FlowFiles that have been sent or received in the previous five minutes and <size> is the total size of those FlowFiles' content. Comments: The Comments that are provided for a Remote Process Group are not comments added by the users of this NiFi but rather the Comments added by the administrators of the remote instance. These comments indicate the purpose of the NiFi instance as a whole. Last Refreshed Time: The information that is pulled from a remote instance and rendered on the Remote Process Group in the User Interface is periodically refreshed in the background. This element indicates the time at which that refresh last happened, or if the information has not been refreshed for a significant amount of time, the value will change to indicate Remote flow not current. 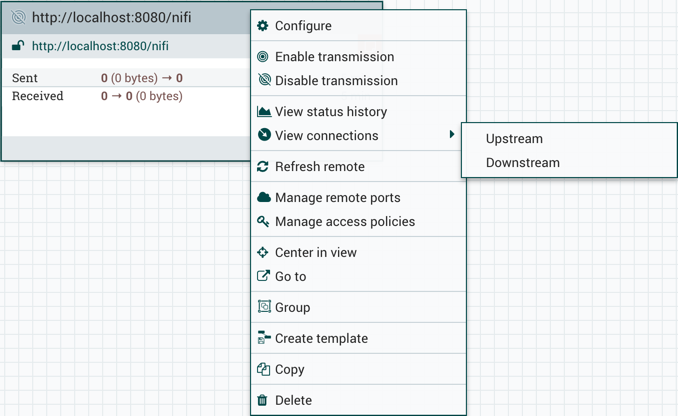 NiFi can be triggered to initiate a refresh of this information by right-clicking on the Remote Process Group and choosing the "Refresh flow" menu item. The FlowFiles enqueued in a Connection can be viewed when necessary. 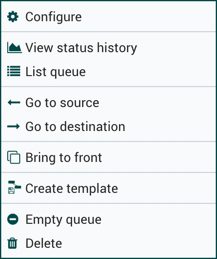 The Queue listing is opened via List queue in a Connection’s context menu. The listing will return the top 100 FlowFiles in the active queue according to the configured priority. The listing can be performed even if the source and destination are actively running. Additionally, details for a Flowfile in the listing can be viewed by clicking the Details button ( ) in the left most column. 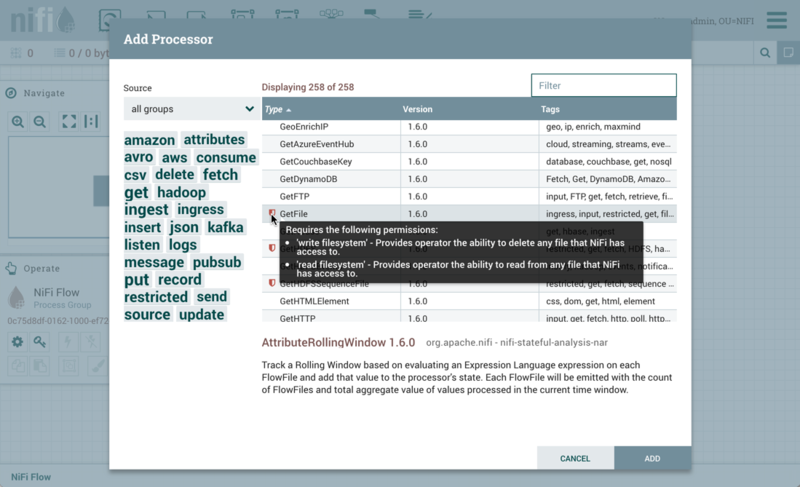 From here, the FlowFile details and attributes are available as well as buttons for downloading or viewing the content. Viewing the content is only available if the nifi.content.viewer.url has been configured. 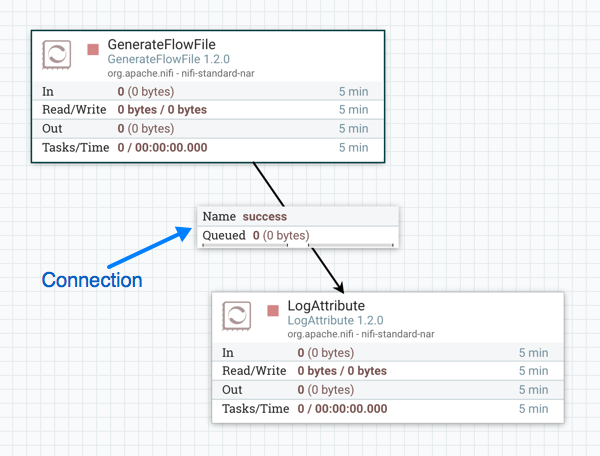 If the source or destination of the Connection are actively running, there is a chance that the desired FlowFile will no longer be in the active queue. The FlowFiles enqueued in a Connection can also be deleted when necessary. The removal of the FlowFiles is initiated via Empty queue in the Connection’s context menu. This action can also be performed if the source and destination are actively running. While the NiFi canvas is useful for understanding how the configured DataFlow is laid out, this view is not always optimal when trying to discern the status of the system. In order to help the user understand how the DataFlow is functioning at a higher level, NiFi provides a Summary page. This page is available in the Global Menu in the top-right corner of the User Interface. See the NiFi User Interface section for more information about the location of this toolbar. This dialog provides a great deal of information about each of the components on the canvas. Below, we have annotated the different elements within the dialog in order to make the discussion of the dialog easier. The Summary page is primarily comprised of a table that provides information about each of the components on the canvas. Above this table is a set of five tabs that can be used to view the different types of components. The information provided in the table is the same information that is provided for each component on the canvas. Each of the columns in the table may be sorted by clicking on the heading of the column. For more on the types of information displayed, see the sections Anatomy of a Processor, Anatomy of a Process Group, and Anatomy of a Remote Process Group above. Bulletin Indicator: As in other places throughout the User Interface, when this icon is present, hovering over the icon will provide information about the Bulletin that was generated, including the message, the severity level, the time at which the Bulletin was generated, and (in a clustered environment) the node that generated the Bulletin. Like all the columns in the Summary table, this column where bulletins are shown may be sorted by clicking on the heading so that all the currently existing bulletins are shown at the top of the list. Details: Clicking the Details icon will provide the user with the details of the component. This dialog is the same as the dialog provided when the user right-clicks on the component and chooses the "View Configuration" menu item. Go To: Clicking this button will close the Summary page and take the user directly to the component on the NiFi canvas. This may change the Process Group that the user is currently in. This icon is not available if the Summary page has been opened in a new browser tab or window (by clicking the "Pop Out" button, as described below). Status History: Clicking the Status History icon will open a new dialog that shows a historical view of the statistics that are rendered for this component. See the section Historical Statistics of a Component for more information. Refresh: The Refresh button allows the user to refresh the information displayed without closing the dialog and opening it again. The time at which the information was last refreshed is shown just to the right of the Refresh button. The information on the page is not automatically refreshed. Filter: The Filter element allows users to filter the contents of the Summary table by typing in all or part of some criteria, such as a Processor Type or Processor Name. The types of filters available differ according to the selected tab. For instance, if viewing the Processor tab, the user is able to filter by name or by type. When viewing the Connections tab, the user is able to filter by source, by name, or by destination name. The filter is automatically applied when the contents of the text box are changed. Below the text box is an indicator of how many entries in the table match the filter and how many entries exist in the table. Pop-Out: When monitoring a flow, it is helpful to be able to open the Summary table in a separate browser tab or window. The "Pop Out" button, next to the Close button, will cause the entire Summary dialog to be opened in a new browser tab or window (depending on the configuration of the browser). Once the page is "popped out", the dialog is closed in the original browser tab/window. In the new tab/window, the "Pop Out" button and the "Go To" button will no longer be available. System Diagnostics: The System Diagnostics window provides information about how the system is performing with respect to system resource utilization. While this is intended mostly for administrators, it is provided in this view because it does provide a summary of the system. This dialog shows information such as CPU utilization, how full the disks are, and Java-specific metrics, such as memory size and utilization, as well as Garbage Collection information. While the Summary table and the canvas show numeric statistics pertaining to the performance of a component over the past five minutes, it is often useful to have a view of historical statistics as well. This information is available by right-clicking on a component and choosing the "Status History" menu option or by clicking on the Status History in the Summary page (see Summary Page for more information). Id: The ID of the component for which the stats are being shown. Group Id: The ID of the Process Group in which the component resides. Name: The Name of the Component for which the stats are being shown. Component-Specific Entries: Information is shown for each different type of component. For example, for a Processor, the type of Processor is displayed. For a Connection, the source and destination names and IDs are shown. Start: The earliest time shown on the graph. End: The latest time shown on the graph. Min/Max/Mean: The minimum, maximum, and mean (arithmetic mean, or average) values are shown. These values are based only on the range of time selected, if any time range is selected. If this instance of NiFi is clustered, these values are shown for the cluster as a whole, as well as each individual node. In a clustered environment, each node is shown in a different color. This also serves as the graph’s legend, showing the color of each node that is shown in the graph. Hovering the mouse over the Cluster or one of the nodes in the legend will also make the corresponding node bold in the graph. The right-hand side of the dialog provides a drop-down list of the different types of metrics to render in the graphs below. The top graph is larger so as to provide an easier-to-read rendering of the information. In the bottom-right corner of this graph is a small handle ( ) that can be dragged to resize the graph. The blank areas of the dialog can also be dragged around to move the entire dialog. The bottom graph is much shorter and provides the ability to select a time range. Selecting a time range here will cause the top graph to show only the time range selected, but in a more detailed manner. Additionally, this will cause the Min/Max/Mean values on the left-hand side to be recalculated. Once a selection has been created by dragging a rectangle over the graph, double-clicking on the selected portion will cause the selection to fully expand in the vertical direction (i.e., it will select all values in this time range). Clicking on the bottom graph without dragging will remove the selection. 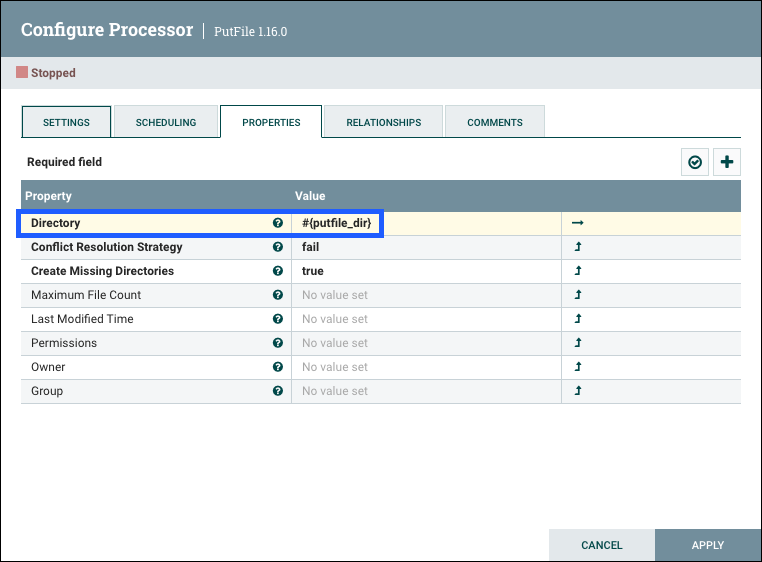 When NiFi is connected to a NiFi Registry, dataflows can be version controlled on the process group level. For more information about NiFi Registry usage and configuration, see the documentation at https://nifi.apache.org/docs/nifi-registry-docs/index.html. To connect NiFi to a Registry, select Controller Settings from the Global Menu. This displays the NiFi Settings window. Select the Registry Clients tab and click the + button in the upper-right corner to register a new Registry client. 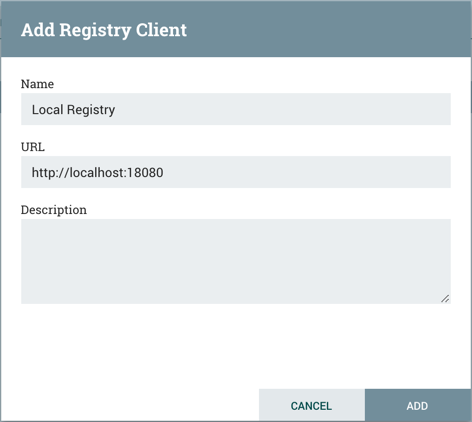 In the Add Registry Client window, provide a name and URL. Click "Add" to complete the registration. Versioned flows are stored and organized in registry buckets. Bucket Policies and Special Privileges configured by the registry administrator determine which buckets a user can import versioned flows from and which buckets a user can save versioned flows to. Information on Bucket Policies and Special Privileges can be found in the NiFi Registry User Guide (https://nifi.apache.org/docs/nifi-registry-docs/html/user-guide.html). Up to date: The flow version is the latest. Locally modified: Local changes have been made. Stale: A newer version of the flow is available. Locally modified and stale: Local changes have been made and a newer version of the flow is available. Sync failure: Unable to synchronize the flow with the registry. Next to the process group name, for the versioned process group itself. Hovering over the state icon displays additional information about the versioned flow. At the bottom of a process group, for the versioned flows contained in the process group. In the Status Bar at the top of the UI, for the versioned flows contained in the root process group. 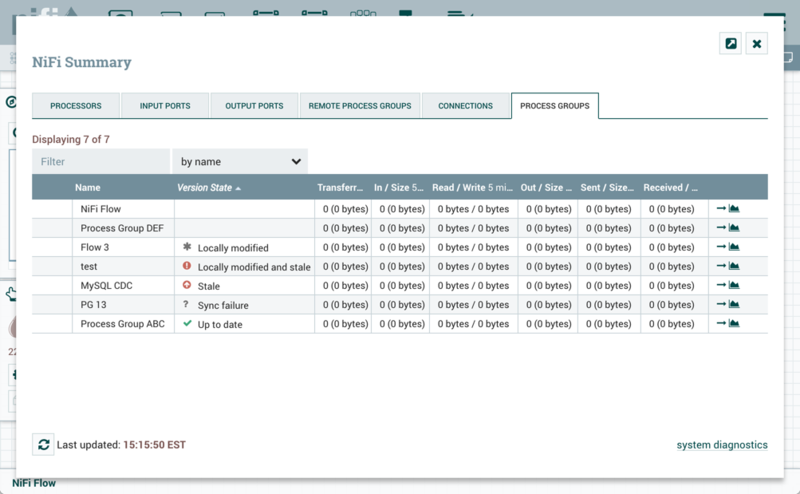 Version state information is also shown in the "Process Groups" tab of the Summary Page. To see the most recent version states, it may be necessary to right-click on the NiFi canvas and select 'Refresh' from the context menu. When a NiFi instance is connected to a registry, an "Import" link will appear in the Add Process Group dialog. Selecting the link will open the Import Version dialog. Connected registries will appear as options in the Registry drop-down menu. For the chosen Registry, buckets the user has access to will appear as options in the Bucket drop-down menu. The names of the flows in the chosen bucket will appear as options in the Name drop-down menu. Select the desired version of the flow to import and select "Import" for the dataflow to be placed on the canvas. Since the version imported in this example is the latest version (MySQL CDC, Version 3), the state of the versioned process group is "Up to date" ( ). If the version imported had been an older version, the state would be "Stale" ( ). To place a process group under version control, right-click on the process group and in the context menu, select "Version→Start version control". In the Save Flow Version window, select a Registry and Bucket and enter a Name for the Flow. If desired, add content for the Description and Comment fields. Select Save and Version 1 of the flow is saved. As the first and latest version of the flow, the state of the versioned process group is "Up to date" ( ). The root process group can not be placed under version control. Creating a variable does not trigger a local change because creating a variable on its own has not changed anything about what the flow processes. A component will have to be created or modified that uses the new variable, which will trigger a local change. Modifying a variable does not trigger a local change because variable values are intended to be different in each environment. When a versioned flow is imported, it is assumed there is a one-time operation required to set those variables specific for the given environment. Deleting a variable does not trigger a local change because the component that references that variable will need need to be modified, which will trigger a local change. 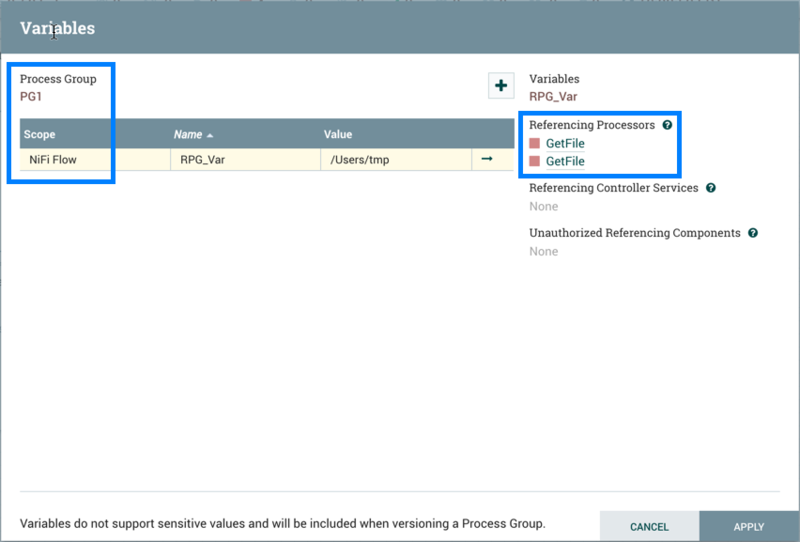 Variables do not support sensitive values and will be included when versioning a Process Group. See Variables in Versioned Flows for more information. 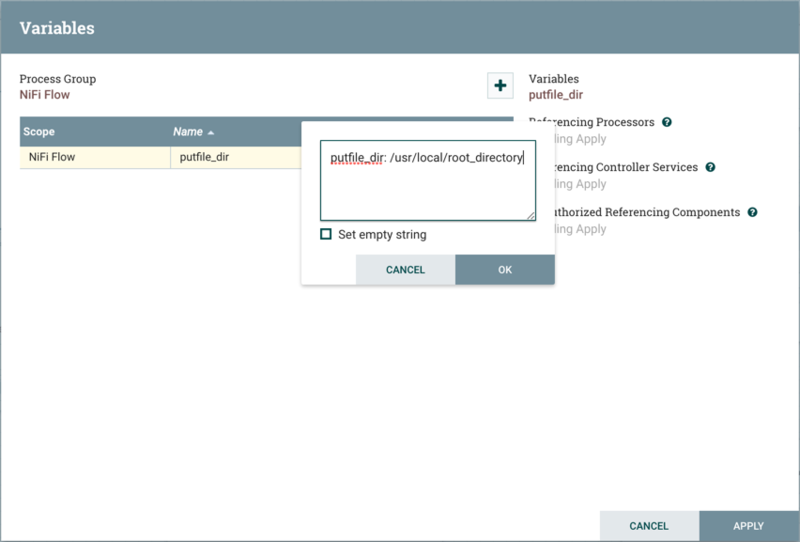 The local changes made to a versioned process group can be viewed in the Show Local Changes dialog by selecting "Version→Show local changes" from the context menu. You can navigate to a component by selecting the "Go To" icon ( ) in its row. As described in the Managing Local Changes section, there are exceptions to which actions are reviewable local changes. Additionally, multiple changes to the same property will only appear as one change in the list as the changes are determined by diffing the current state of the process group and the saved version of the process group noted in the Show Local Changes dialog. Revert the local changes made to a versioned process group by selecting "Version→Revert local changes" from the context menu. 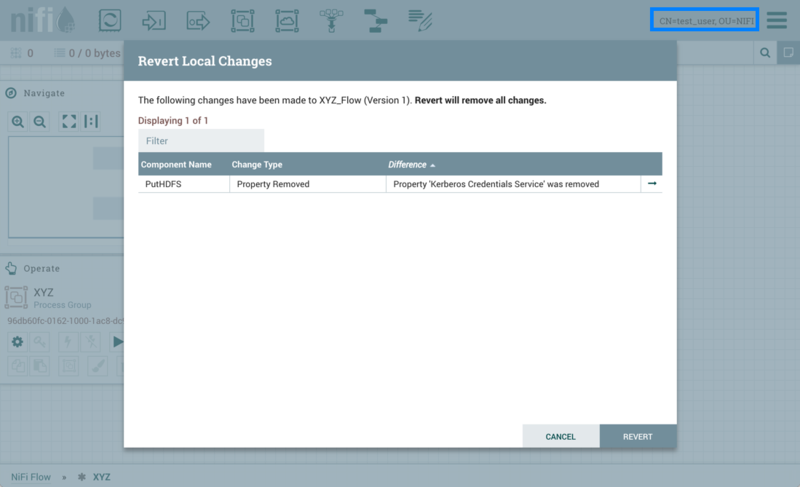 The Revert Local Changes dialog displays a list of the local changes for the DFM to review and consider prior to initiating the revert. Select "Revert" to remove all changes. As described in the Managing Local Changes section, there are exceptions to which actions are revertible local changes. 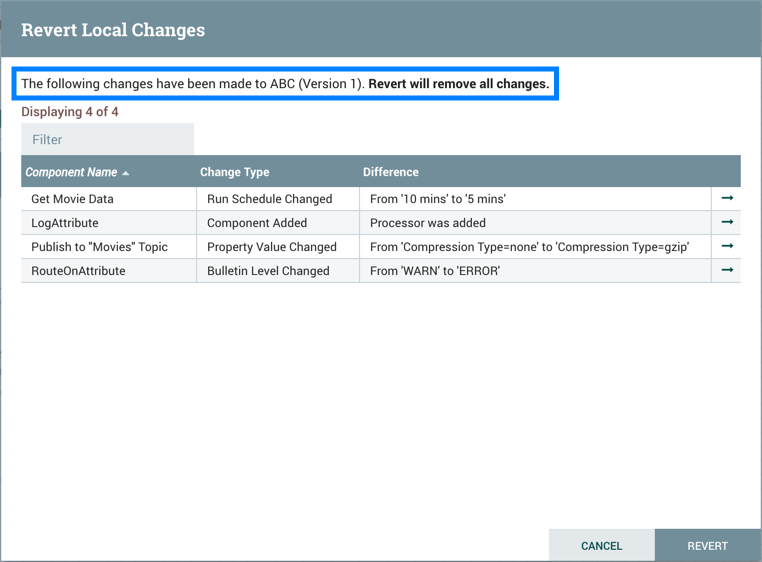 Additionally, multiple changes to the same property will only appear as one change in the list as the changes are determined by diffing the current state of the process group and the saved version of the process group noted in the Revert Local Changes dialog. To commit and save a flow version, select "Version→Commit local changes" from the context menu. In the Save Flow Version dialog, add comments if desired and select "Save". Local changes can not be committed if the version that has been modified is not the latest version. In this scenario, the version state is "Locally modified and stale" ( ). 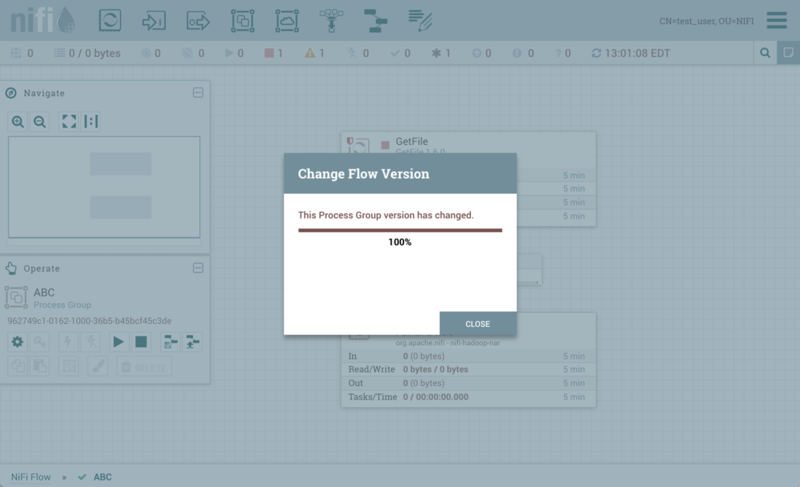 To change the version of a flow, right-click on the versioned process group and select "Version→Change version". In the example shown, the versioned flow is upgraded from an older to the newer latest version. However, a versioned flow can also be rollbacked to an older version. 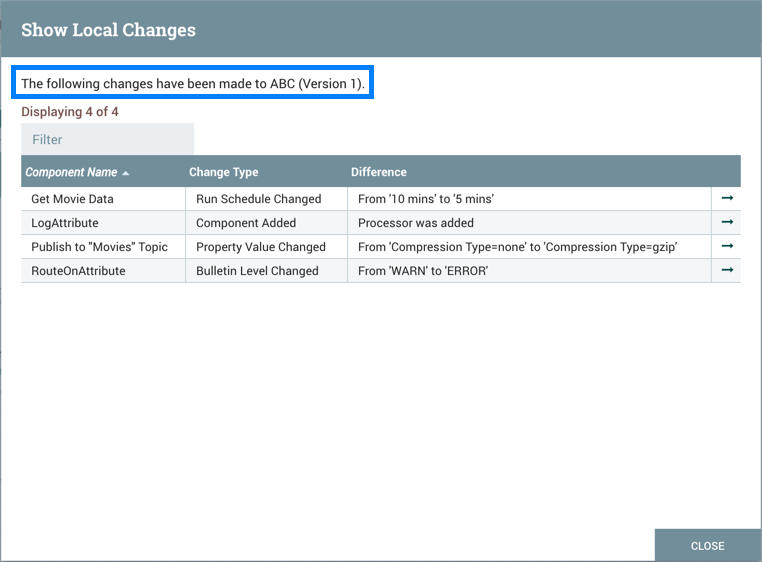 For "Change version" to be an available selection, local changes to the process group need to be reverted. 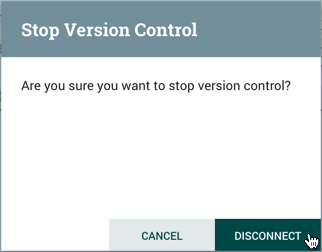 In the Stop Version Control dialog, select "Disconnect". 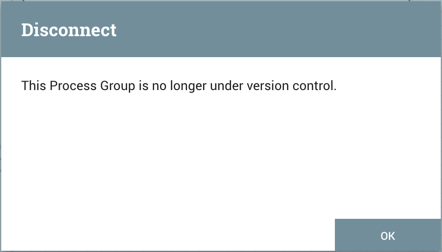 The removal of the process group from version control is confirmed. A versioned process group can contain other versioned process groups. However, local changes to a parent process group cannot be reverted or saved if it contains a child process group that also has local changes. The child process group must first be reverted or have its changes committed for those actions to be performed on the parent process group. There are two users, "sys_admin" and "test_user" who have access to both view and modify the root process group. "sys_admin" has access to all restricted components. "test_user" has access to restricted components requiring 'read filesystem' and 'write filesystem'. In this first example, sys_admin creates a KeytabCredentialsService controller service at the root process group level. 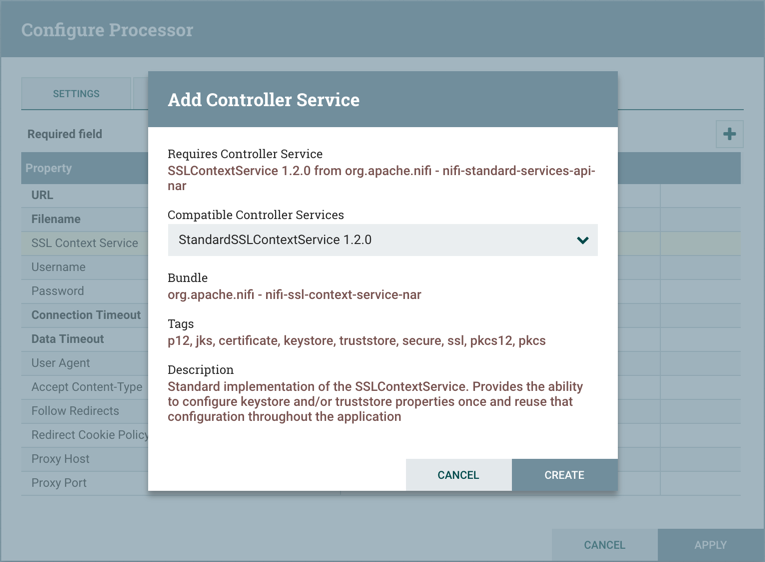 Now, consider a second scenario where the controller service is created on the process group level. Sys_admin saves the process group as a versioned flow. 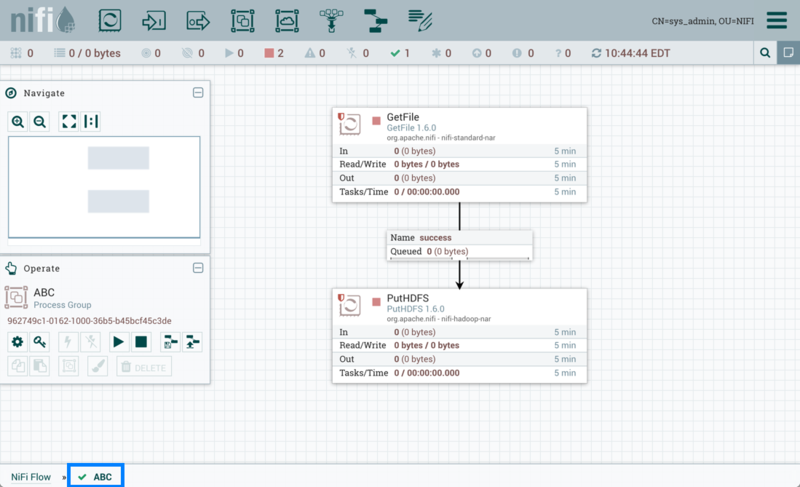 DFMs have the ability to build very large and complex DataFlows using NiFi. This is achieved by using the basic components: Processor, Funnel, Input/Output Port, Process Group, and Remote Process Group. These can be thought of as the most basic building blocks for constructing a DataFlow. At times, though, using these small building blocks can become tedious if the same logic needs to be repeated several times. To solve this issue, NiFi provides the concept of a Template. A Template is a way of combining these basic building blocks into larger building blocks. Once a DataFlow has been created, parts of it can be formed into a Template. This Template can then be dragged onto the canvas, or can be exported as an XML file and shared with others. Templates received from others can then be imported into an instance of NiFi and dragged onto the canvas. To create a Template, select the components that are to be a part of the template, and then click the Create Template ( ) button in the Operate Palette (See NiFi User Interface for more information on the Operate Palette). Clicking this button without selecting anything will create a Template that contains all of the contents of the current Process Group. This means that creating a Template with nothing selected while on the Root Process Group will create a single Template that contains the entire flow. After clicking this button, the user is prompted to provide a name and an optional description for the template. Each template must have a unique name. After entering the name and optional description, clicking the Create button will generate the template and notify the user that the template was successfully created, or provide an appropriate error message if unable to create the template for some reason. It is important to note that if any Processor that is Templated has a sensitive property (such as a password), the value of that sensitive property is not included in the Template. As a result, when dragging the Template onto the canvas, newly created Processors may not be valid if they are missing values for their sensitive properties. Additionally, any Connection that was selected when making the Template is not included in the Template if either the source or the destination of the Connection is not also included in the Template. After receiving a Template that has been exported from another NiFi, the first step needed to use the template is to import the template into this instance of NiFi. You may import templates into any Process Group where you have the appropriate authorization. From the Operate Palette, click the Upload Template ( ) button (see NiFi User Interface for more information on the Operate Palette). This will display the Upload Template dialog. Click the find icon and use the File Selection dialog to choose which template file to upload. Select the file and click Open. Clicking the Upload button will attempt to import the Template into this instance of NiFi. The Upload Template dialog will update to show "Success" or an error message if there was a problem importing the template. Once a Template has been created (see Creating a Template) or imported (see Importing a Template), it is ready to be instantiated, or added to the canvas. This is accomplished by dragging the Template icon ( ) from the Components Toolbar (see NiFi User Interface) onto the canvas. 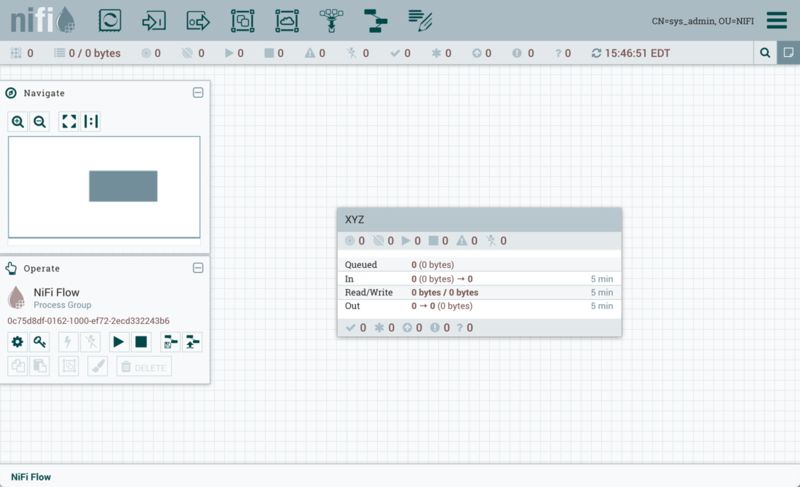 This will present a dialog to choose which Template to add to the canvas. After choosing the Template to add, simply click the Add button. The Template will be added to the canvas with the upper-left-hand side of the Template being placed wherever the user dropped the Template icon. This leaves the contents of the newly instantiated Template selected. If there was a mistake, and this Template is no longer wanted, it may be deleted. One of the most powerful features of NiFi Templates is the ability to easily export a Template to an XML file and to import a Template that has already been exported. This provides a very simple mechanism for sharing parts of a DataFlow with others. You can select Templates from the Global Menu (see NiFi User Interface) to open a dialog that displays all of the Templates that are currently available, filter the templates to see only those of interest, export, and delete Templates. Once a Template has been created, it can be shared with others in the Template Management page. To export a Template, locate the Template in the table. The Filter in the top-right corner can be used to help find the appropriate Template if several are available. Then click the Download button ( ). This will download the template as an XML file to your computer. This XML file can then be sent to others and imported into other instances of NiFi (see Importing a Template). Once it is decided that a Template is no longer needed, it can be easily removed from the Template Management page. 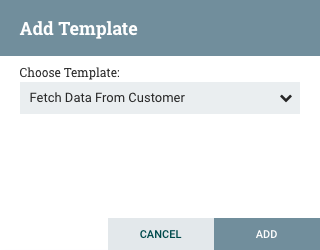 To delete a Template, locate it in the table (the Filter in the top-right corner may be used to find the appropriate Template if several are available) and click the Delete button ( ). This will prompt for confirmation. After confirming the deletion, the Template will be removed from this table and will no longer be available to add to the canvas. When authorization is enabled, accessessing Data Provenance information requires the 'query provenance' Global Policy as well as the 'view provenance' Component Policy for the component which generated the event. 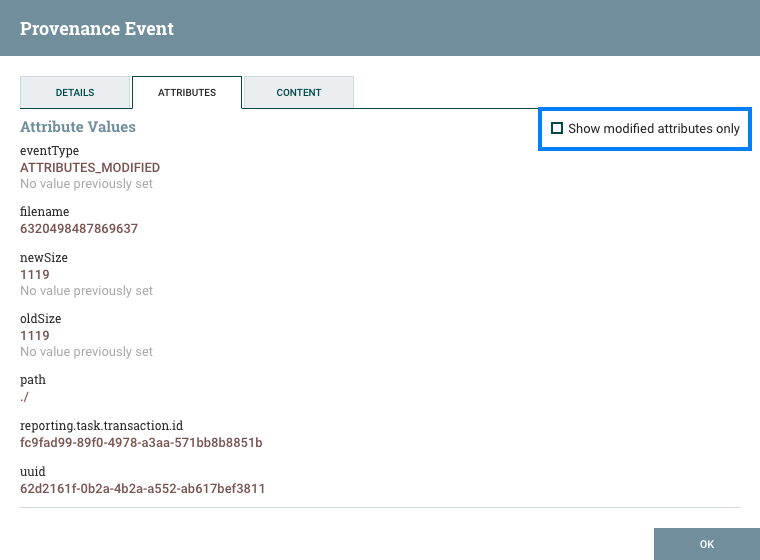 In addition, access to event details which include FlowFile attributes and content require the 'view the data' Component Policy for the component which generated the event. Each point in a dataflow where a FlowFile is processed in some way is considered a 'provenance event'. Various types of provenance events occur, depending on the dataflow design. For example, when data is brought into the flow, a RECEIVE event occurs, and when data is sent out of the flow, a SEND event occurs. Other types of processing events may occur, such as if the data is cloned (CLONE event), routed (ROUTE event), modified (CONTENT_MODIFIED or ATTRIBUTES_MODIFIED event), split (FORK event), combined with other data objects (JOIN event), and ultimately removed from the flow (DROP event). One of the most common tasks performed in the Data Provenance page is a search for a given FlowFile to determine what happened to it. To do this, click the Search button in the upper-right corner of the Data Provenance page. This opens a dialog window with parameters that the user can define for the search. The parameters include the processing event of interest, distinguishing characteristics about the FlowFile or the component that produced the event, the timeframe within which to search, and the size of the FlowFile. In the far-left column of the Data Provenance page, there is a View Details icon for each event ( ). Clicking this button opens a dialog window with three tabs: Details, Attributes, and Content. 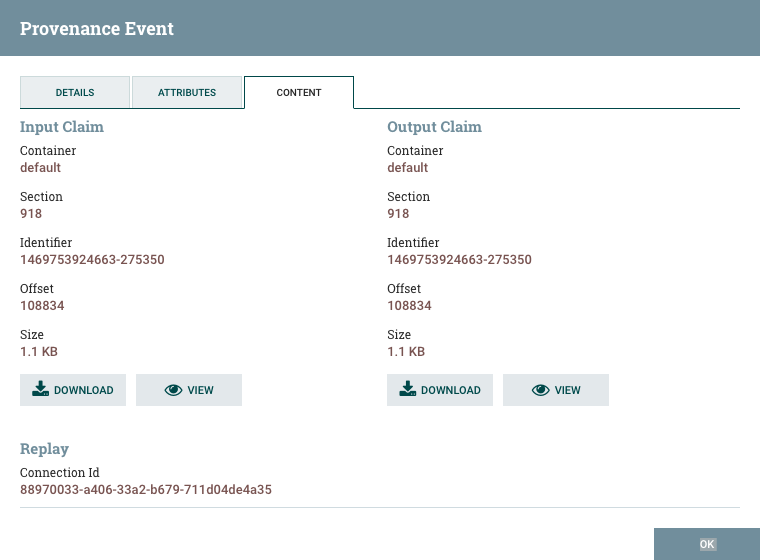 The Details tab shows various details about the event, such as when it occurred, what type of event it was, and the component that produced the event. The information that is displayed will vary according to the event type. This tab also shows information about the FlowFile that was processed. 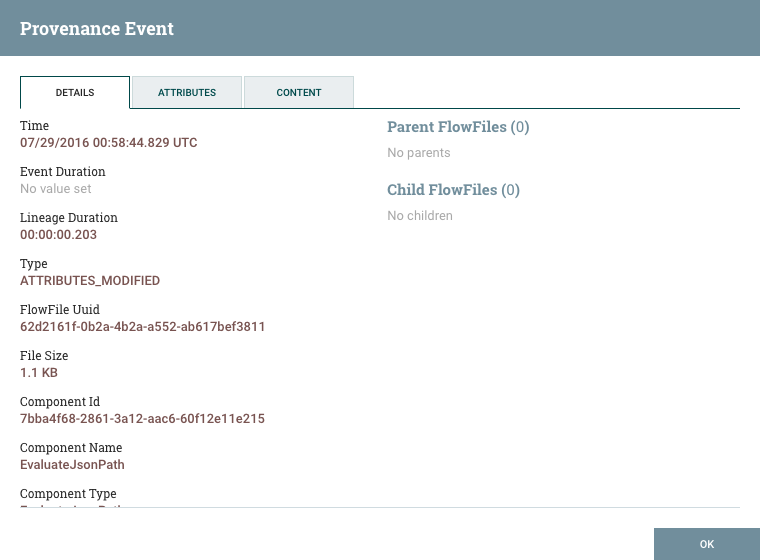 In addition to the FlowFile’s UUID, which is displayed on the left side of the Details tab, the UUIDs of any parent or children FlowFiles that are related to that FlowFile are displayed on the right side of the Details tab. 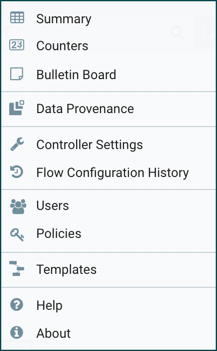 The Attributes tab shows the attributes that exist on the FlowFile as of that point in the flow. In order to see only the attributes that were modified as a result of the processing event, the user may select the checkbox next to "Only show modified" in the upper-right corner of the Attributes tab. A DFM may need to inspect a FlowFile’s content at some point in the dataflow to ensure that it is being processed as expected. And if it is not being processed properly, the DFM may need to make adjustments to the dataflow and replay the FlowFile again. The Content tab of the View Details dialog window is where the DFM can do these things. The Content tab shows information about the FlowFile’s content, such as its location in the Content Repository and its size. In addition, it is here that the user may click the Download button to download a copy of the FlowFile’s content as it existed at this point in the flow. The user may also click the Submit button to replay the FlowFile at this point in the flow. Upon clicking Submit, the FlowFile is sent to the connection feeding the component that produced this processing event. It is often useful to see a graphical representation of the lineage or path a FlowFile took within the dataflow. To see a FlowFile’s lineage, click on the "Show Lineage" icon ( ) in the far-right column of the Data Provenance table. 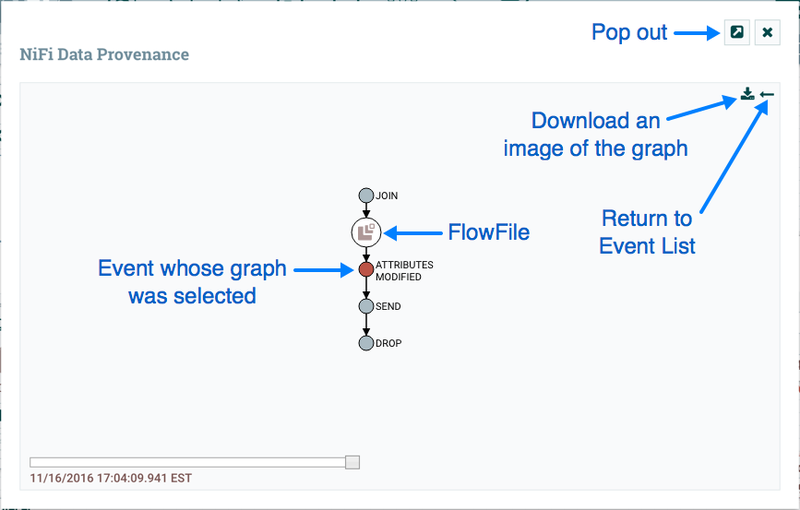 This opens a graph displaying the FlowFile ( ) and the various processing events that have occurred. The selected event will be highlighted in red. It is possible to right-click or double-click on any event to see that event’s details (see Details of an Event). To see how the lineage evolved over time, click the slider at the bottom-left of the window and move it to the left to see the state of the lineage at earlier stages in the dataflow. Sometimes, a user may need to track down the original FlowFile that another FlowFile was spawned from. For example, when a FORK or CLONE event occurs, NiFi keeps track of the parent FlowFile that produced other FlowFiles, and it is possible to find that parent FlowFile in the Lineage. 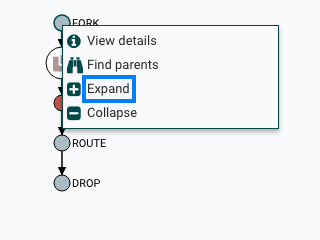 Right-click on the event in the lineage graph and select "Find parents" from the context menu. 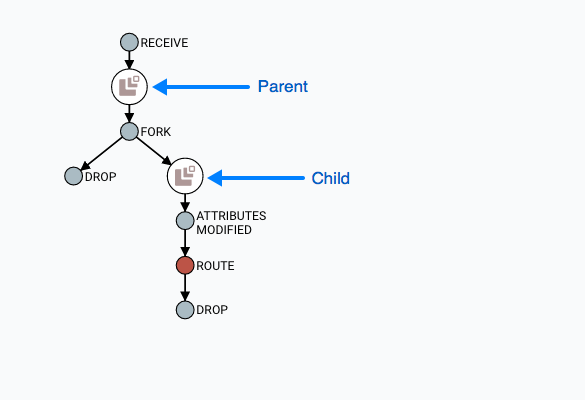 Once "Find parents" is selected, the graph is re-drawn to show the parent FlowFile and its lineage as well as the child and its lineage. 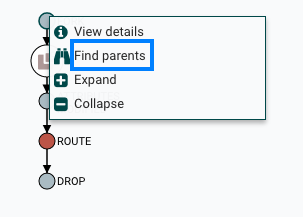 In the same way that it is useful to find a parent FlowFile, the user may also want to determine what children were spawned from a given FlowFile. To do this, right-click on the event in the lineage graph and select "Expand" from the context menu. Once "Expand" is selected, the graph is re-drawn to show the children and their lineage. By default, the Provenance Repository is implemented in a Persistent Provenance configuration. 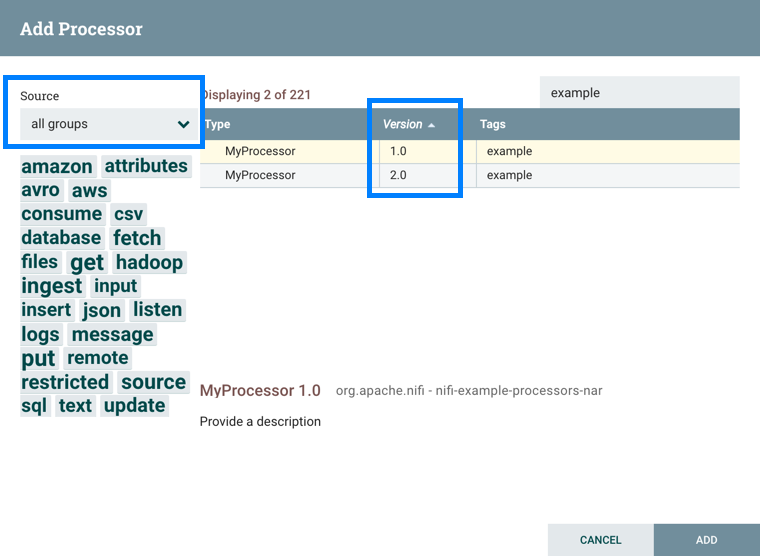 In Apache NiFi 1.2.0, the Write Ahead configuration was introduced to provide the same capabilities as Persistent Provenance, but with far better performance. Migrating to the Write Ahead configuration is easy to accomplish. Simply change the setting for the nifi.provenance.repository.implementation system property in the nifi.properties file from the default value of org.apache.nifi.provenance.PersistentProvenanceRepository to org.apache.nifi.provenance.WriteAheadProvenanceRepository and restart NiFi. However, to increase the chances of a successful migration consider the following factors and recommended actions. The WriteAheadProvenanceRepository can use the Provenance data stored by the PersistentProvenanceRepository. However, the PersistentProvenanceRepository may not be able to read the data written by the WriteAheadProvenanceRepository. Therefore, once the Provenance Repository is changed to use the WriteAheadProvenanceRepository, it cannot be changed back to the PersistentProvenanceRepository without first deleting the data in the Provenance Repository. It is therefore recommended that before changing the implementation to Write Ahead, ensure your version of NiFi is stable, in case an issue arises that requires the need to roll back to a previous version of NiFi that did not support the WriteAheadProvenanceRepository. If you are upgrading from an older version of NiFi to 1.2.0 or later, it is recommended that you do not change the provenance configuration to Write Ahead until you confirm your flows and environment are stable in 1.2.0 first. This reduces the number of variables in your upgrade and can simplify the debugging process if any issues arise. nifi.provenance.repository.concurrent.merge.threads and nifi.provenance.repository.warm.cache.frequency are new properties. The default values of 2 for threads and blank for frequency (i.e. disabled) should remain for most installations. Once these property changes have been made, restart NiFi. Note: Detailed descriptions for each of these properties can be found in System Properties. The above migration recommendations for WriteAheadProvenanceRepository also apply to the encrypted version of the configuration, EncryptedWriteAheadProvenanceRepository. The next section has more information about implementing an Encrypted Provenance Repository. While OS-level access control can offer some security over the provenance data written to the disk in a repository, there are scenarios where the data may be sensitive, compliance and regulatory requirements exist, or NiFi is running on hardware not under the direct control of the organization (cloud, etc.). In this case, the provenance repository allows for all data to be encrypted before being persisted to the disk. The current implementation of the encrypted provenance repository intercepts the record writer and reader of WriteAheadProvenanceRepository, which offers significant performance improvements over the legacy PersistentProvenanceRepository and uses the AES/GCM algorithm, which is fairly performant on commodity hardware. In most scenarios, the added cost will not be significant (unnoticable on a flow with hundreds of provenance events per second, moderately noticable on a flow with thousands - tens of thousands of events per second). However, administrators should perform their own risk assessment and performance analysis and decide how to move forward. Switching back and forth between encrypted/unencrypted implementations is not recommended at this time. The EncryptedWriteAheadProvenanceRepository is a new implementation of the provenance repository which encrypts all event record information before it is written to the repository. This allows for storage on systems where OS-level access controls are not sufficient to protect the data while still allowing querying and access to the data through the NiFi UI/API. The WriteAheadProvenanceRepository was introduced in NiFi 1.2.0 and provided a refactored and much faster provenance repository implementation than the previous PersistentProvenanceRepository. The encrypted version wraps that implementation with a record writer and reader which encrypt and decrypt the serialized bytes respectively. The fully qualified class org.apache.nifi.provenance.EncryptedWriteAheadProvenanceRepository is specified as the provenance repository implementation in nifi.properties as the value of nifi.provenance.repository.implementation. In addition, new properties must be populated to allow successful initialization. The StaticKeyProvider implementation defines keys directly in nifi.properties. Individual keys are provided in hexadecimal encoding. The keys can also be encrypted like any other sensitive property in nifi.properties using the ./encrypt-config.sh tool in the NiFi Toolkit. The following configuration section would result in a key provider with two available keys, "Key1" (active) and "AnotherKey". Each line defines a key ID and then the Base64-encoded cipher text of a 16 byte IV and wrapped AES-128, AES-192, or AES-256 key depending on the JCE policies available. The individual keys are wrapped by AES/GCM encryption using the master key defined by nifi.bootstrap.sensitive.key in conf/bootstrap.conf. Simply update nifi.properties to reference a new key ID in nifi.provenance.repository.encryption.key.id. Previously-encrypted events can still be decrypted as long as that key is still available in the key definition file or nifi.provenance.repository.encryption.key.id.<OldKeyID> as the key ID is serialized alongside the encrypted record. Once the repository is initialized, all provenance event record write operations are serialized according to the configured schema writer (EventIdFirstSchemaRecordWriter by default for WriteAheadProvenanceRepository) to a byte. Those bytes are then encrypted using an implementation of ProvenanceEventEncryptor (the only current implementation is AES/GCM/NoPadding) and the encryption metadata (keyId, algorithm, version, IV) is serialized and prepended. The complete byte is then written to the repository on disk as normal. On record read, the process is reversed. The encryption metadata is parsed and used to decrypt the serialized bytes, which are then deserialized into a ProvenanceEventRecord object. The delegation to the normal schema record writer/reader allows for "random-access" (i.e. immediate seek without decryption of unnecessary records). Within the NiFi UI/API, there is no detectable difference between an encrypted and unencrypted provenance repository. The Provenance Query operations work as expected with no change to the process. When switching between implementation "families" (i.e. VolatileProvenanceRepository or PersistentProvenanceRepository to EncryptedWriteAheadProvenanceRepository), the existing repository must be cleared from the file system before starting NiFi. A terminal command like localhost:$NIFI_HOME $ rm -rf provenance_repository/ is sufficient. There is also a future effort to provide a standalone tool in NiFi Toolkit to encrypt/decrypt an existing provenance repository to make the transition easier. The translation process could take a long time depending on the size of the existing repository, and being able to perform this task outside of application startup would be valuable (NIFI-3723). Multiple repositories — No additional effort or testing has been applied to multiple repositories at this time. It is possible/likely issues will occur with repositories on different physical devices. There is no option to provide a heterogenous environment (i.e. one encrypted, one plaintext repository). Corruption — when a disk is filled or corrupted, there have been reported issues with the repository becoming corrupted and recovery steps are necessary. This is likely to continue to be an issue with the encrypted repository, although still limited in scope to individual records (i.e. an entire repository file won’t be irrecoverable due to the encryption). In addition to the Summary Page, Data Provenance Page, Template Management Page, and Bulletin Board Page, there are other tools in the Global Menu (see NiFi User Interface) that are useful to the DFM. 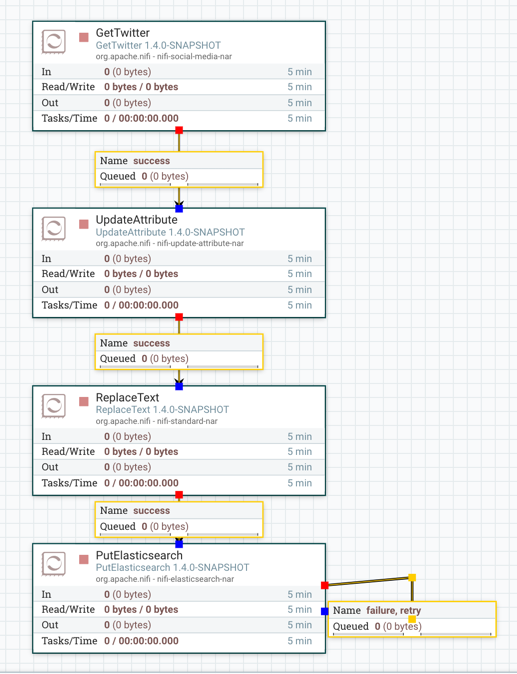 Select Flow Configuration History to view all the changes that have been made to the dataflow. The history can aid in troubleshooting, such as if a recent change to the dataflow has caused a problem and needs to be fixed. The DFM can see what changes have been made and adjust the flow as needed to fix the problem. 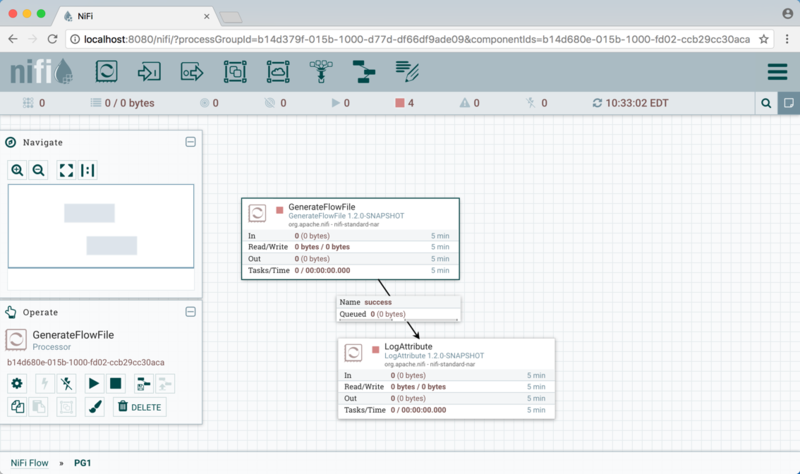 While NiFi does not have an "undo" feature, the DFM can make new changes to the dataflow that will fix the problem. Two other tools in the Global Menu are Controller Settings and Users. 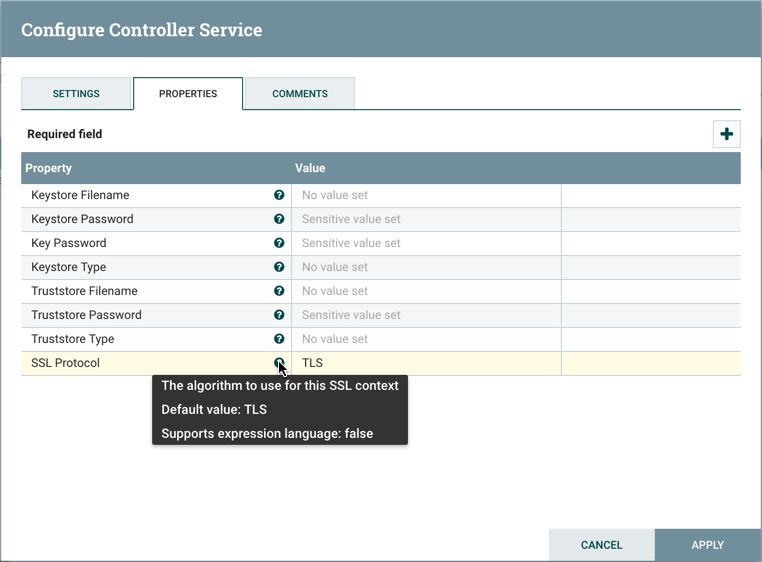 The Controller Settings page provides the ability to change the name of the NiFi instance, add comments describing the NiFi instance, and set the maximum number of threads that are available to the application. It also provides tabs where DFMs may add and configure Controller Services and Reporting Tasks. The Users page is used to manage user access, which is described in the System Administrator’s Guide.